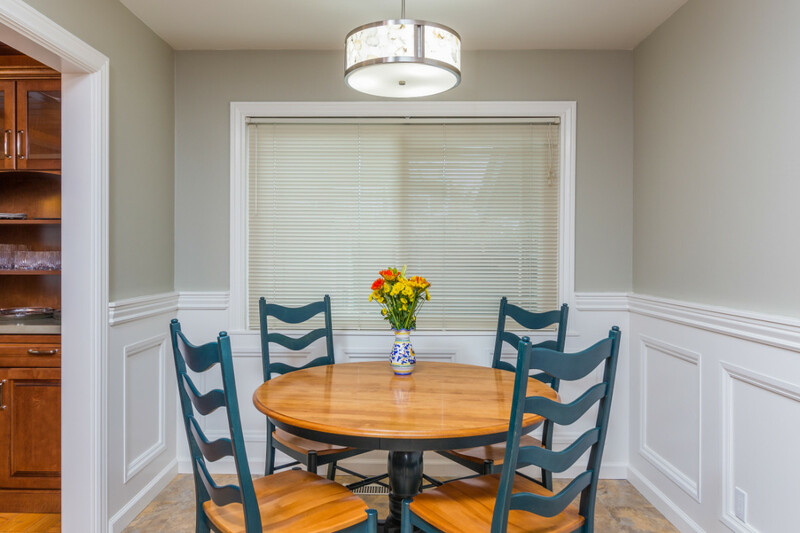 Although remodeled over a decade ago, this unit still looks great and is a testament to the quality of our workmanship. 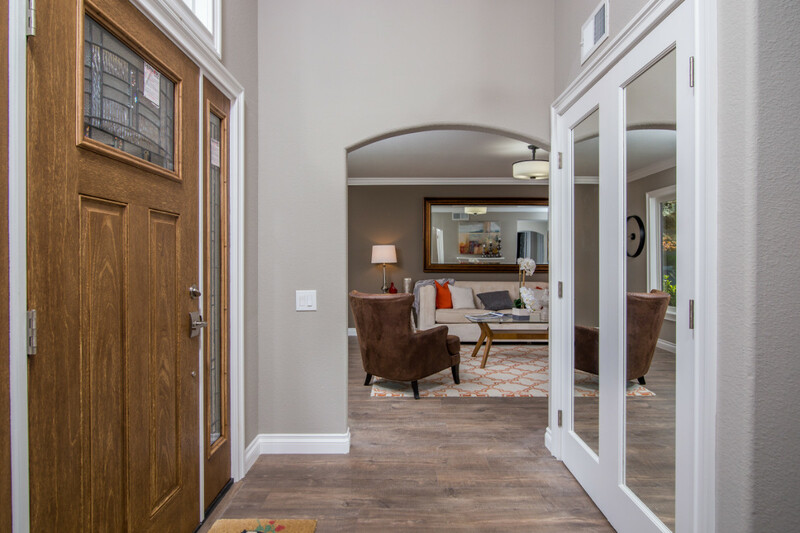 Some of the signature Toupin details are on display here with arched doorways, arched pass through added to allow for more light to pass between spaces, coffered/tray ceiling details, paneled doors and ample moldings. 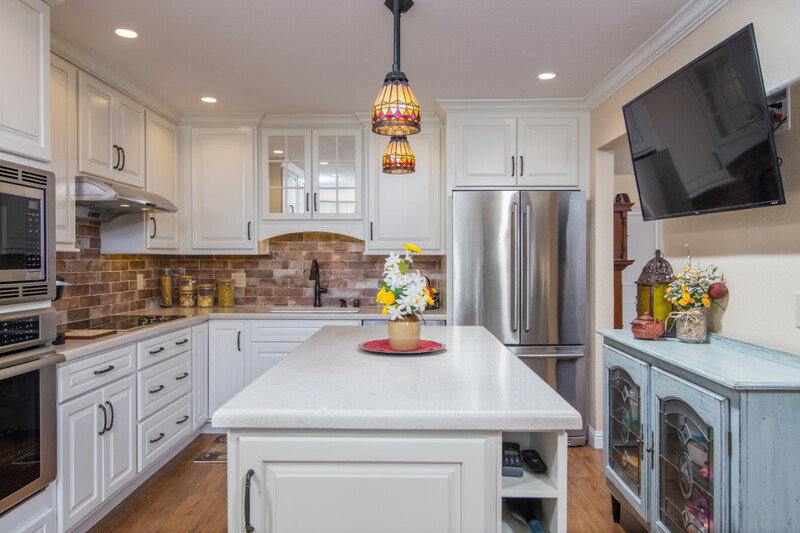 Classic natural stone was used throughout the kitchen and bathroom with the warm honey colored cabinetry and light cherry laminate flooring. 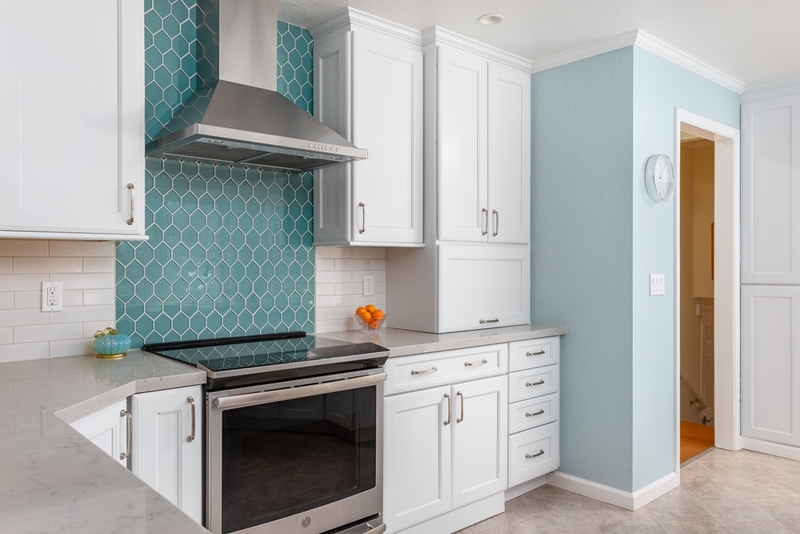 Teal was the accent chosen and it pops in this space. 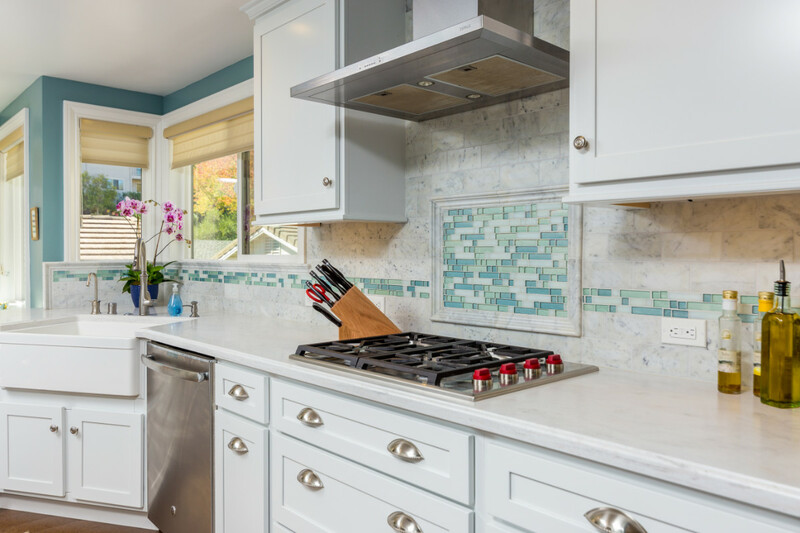 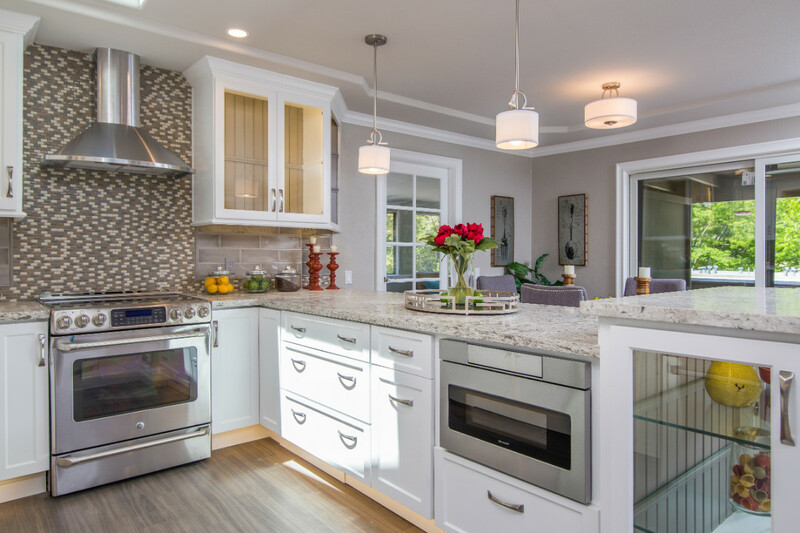 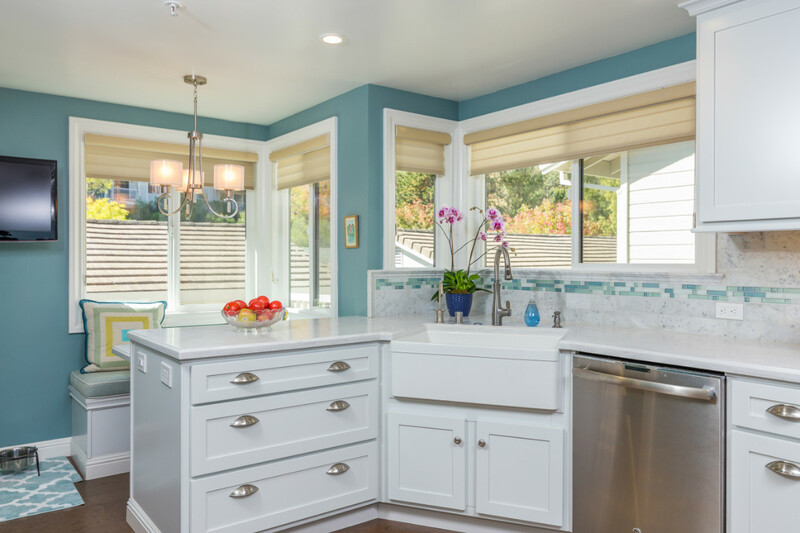 Beautiful Praa Sands Cambria countertops have a touch of the color running through which started us in this colorful direction. 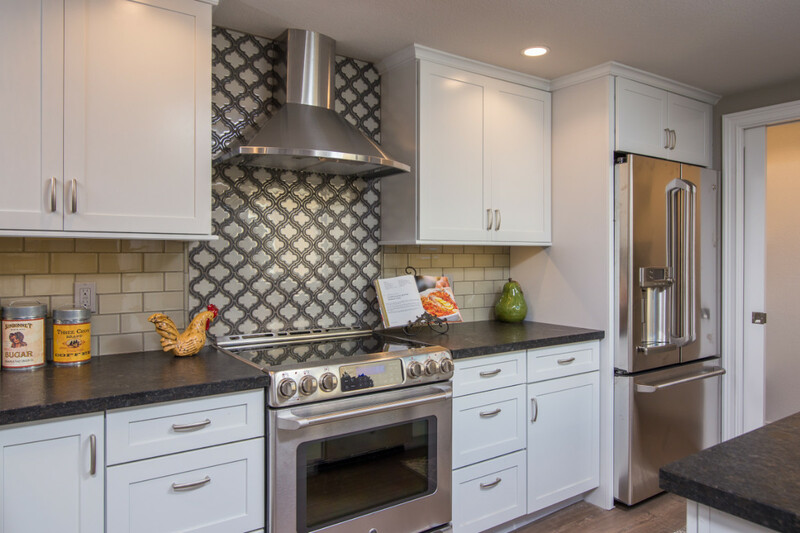 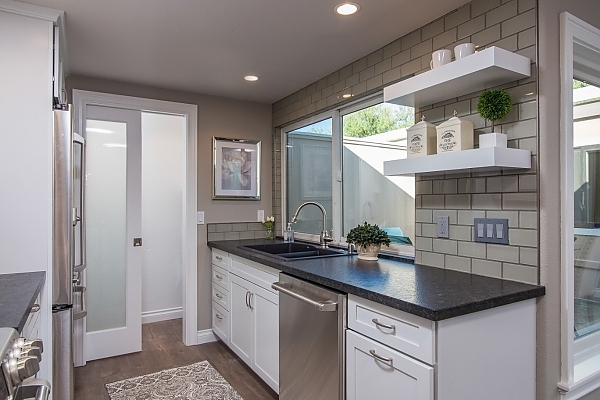 A ceramic tile backsplash in a more updated sized subway tile and coordinating pendants tie it all together. 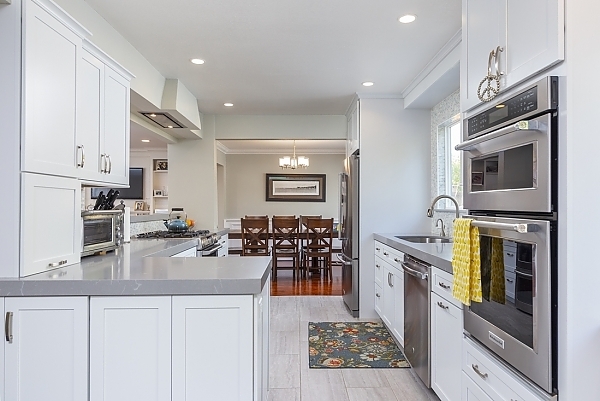 Canvas, cream colored cabinets warm up the space along with the existing hardwood floors which we were able to work around with the new kitchen layout. 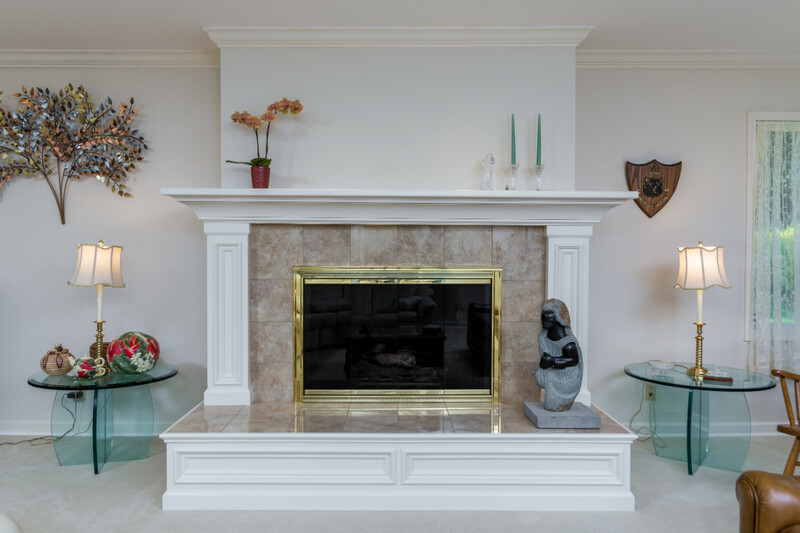 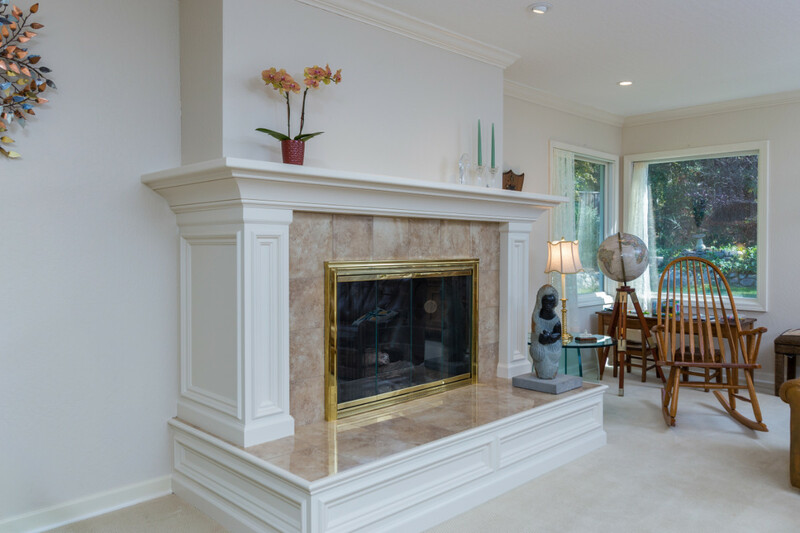 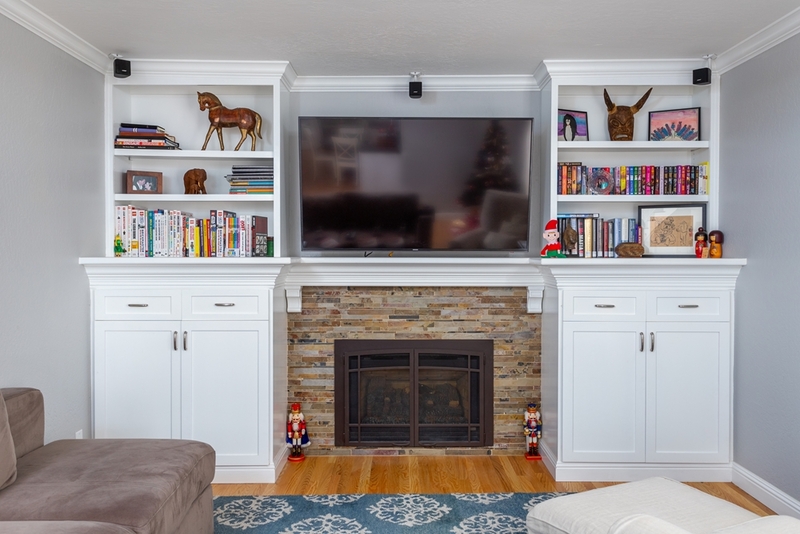 We refaced two fireplaces at this home as well, covering over and eliminating the original heavy and dark brick that was too overpowering in these spaces, installing new updated tile and nice paneled details in legs, mantles and surrounds. 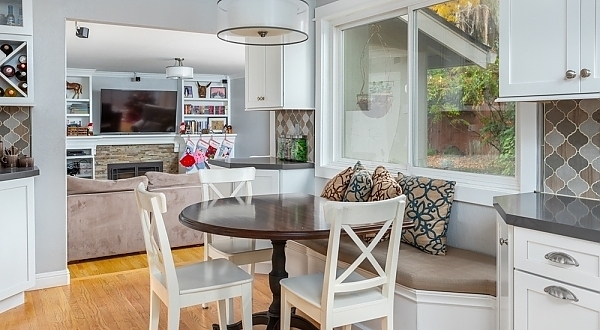 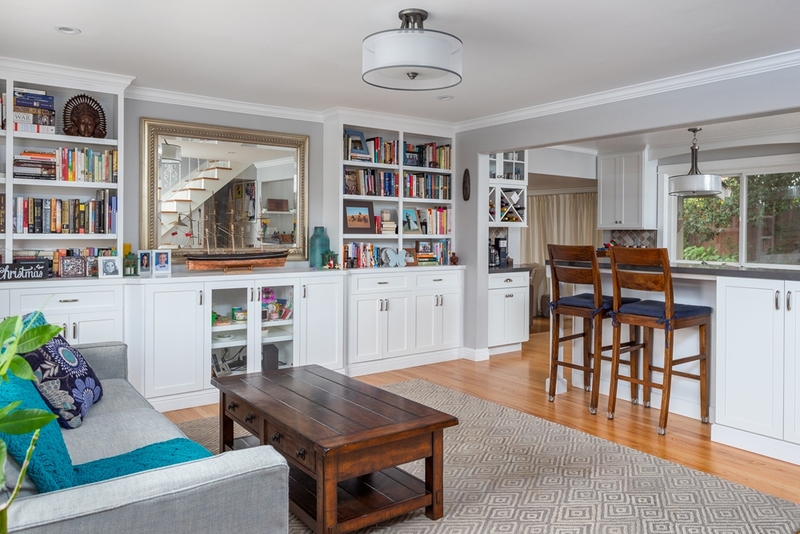 Touches of drama add interest in this complete home makeover. 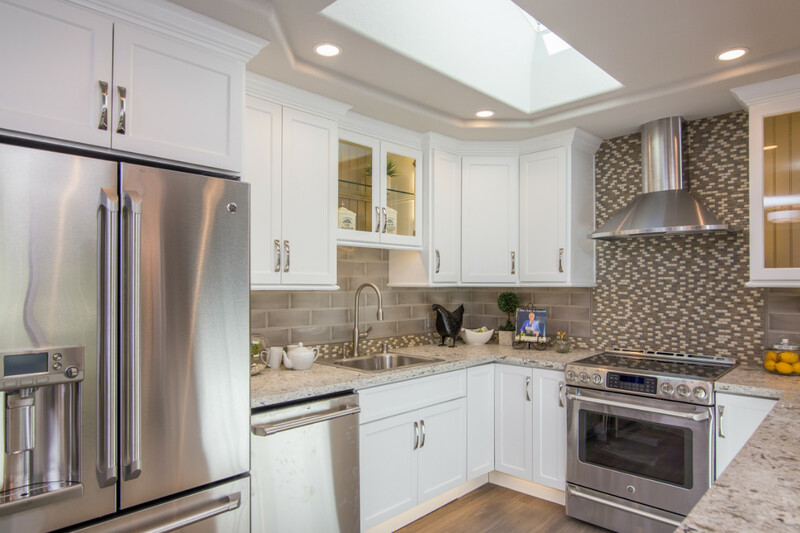 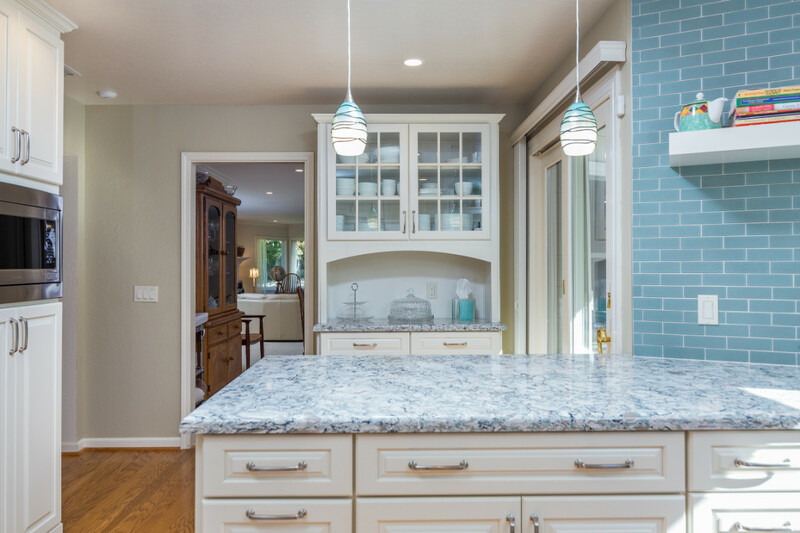 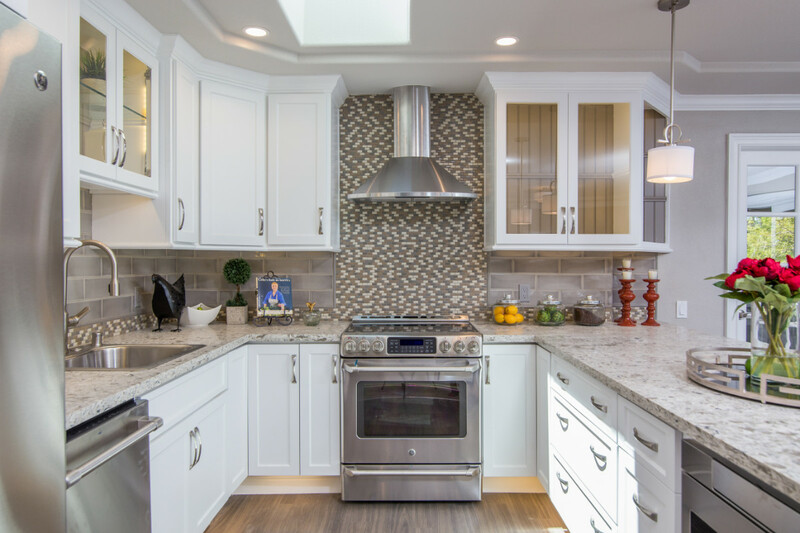 In the kitchen a dramatic, patterned glass tile draws the eye as a main focal point behind the hood, along with sparkling pendant lights. 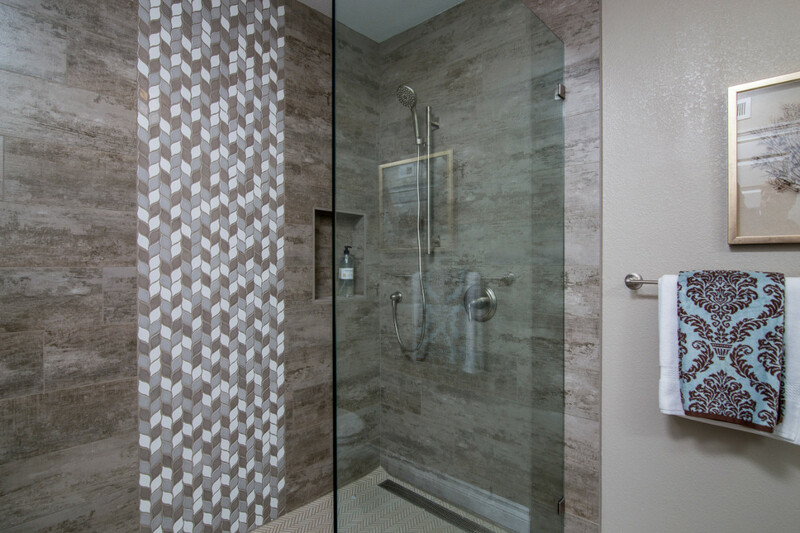 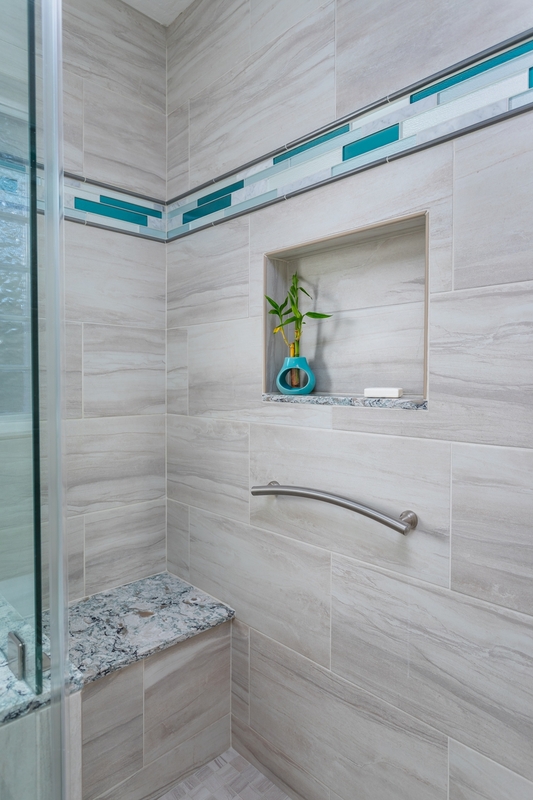 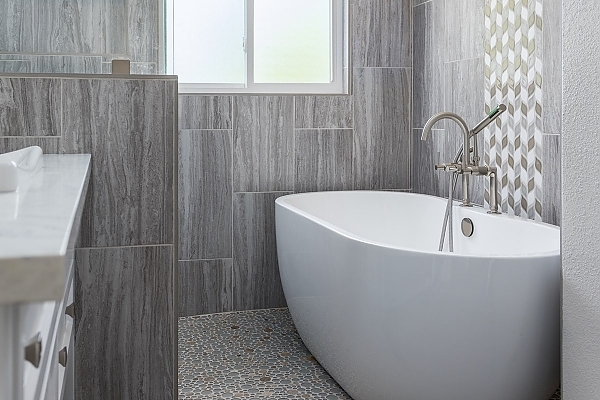 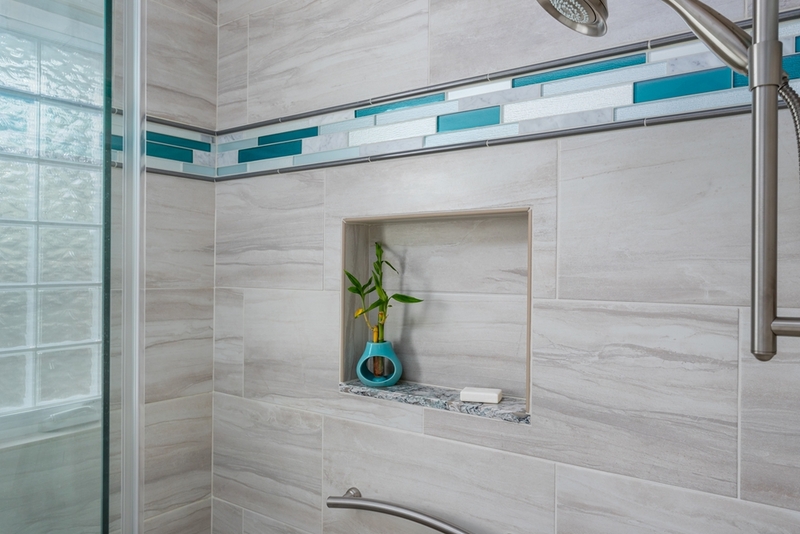 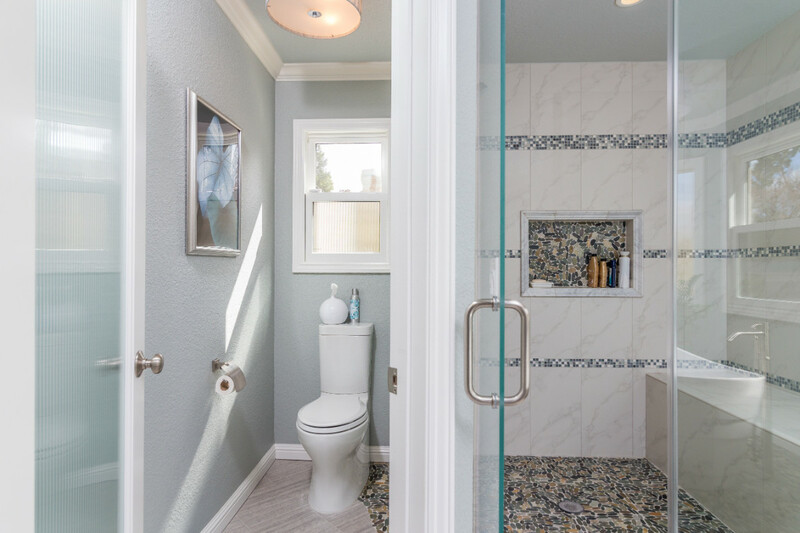 In the bathroom a similar floor to ceiling “waterfall” tile accent in the shower is another striking presence. 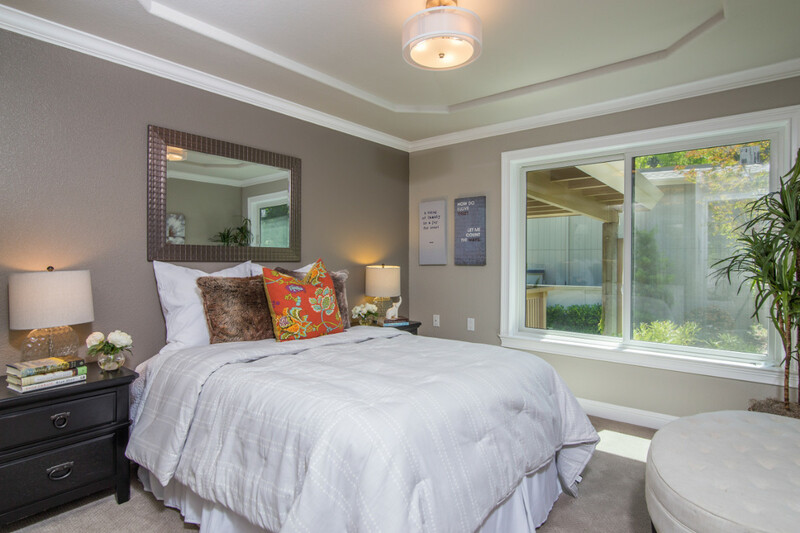 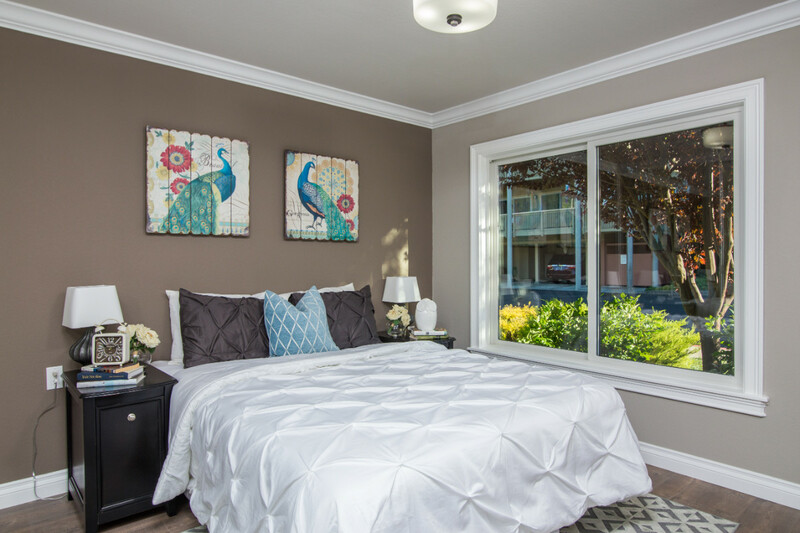 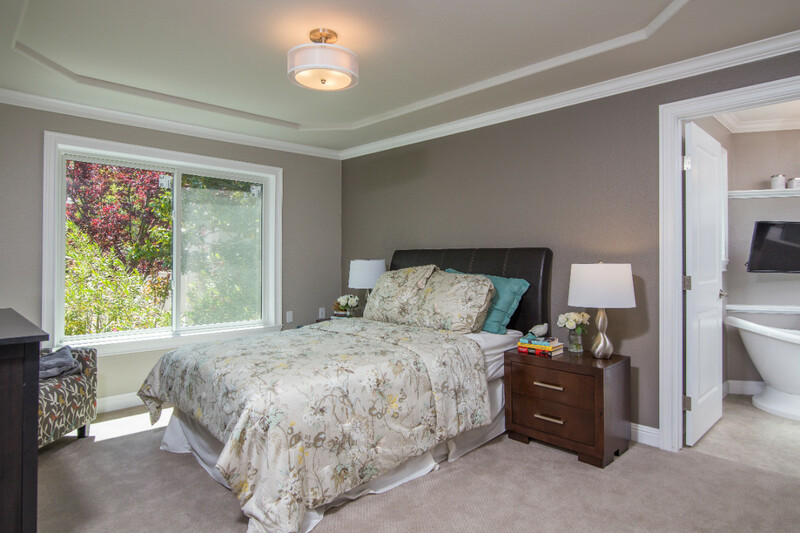 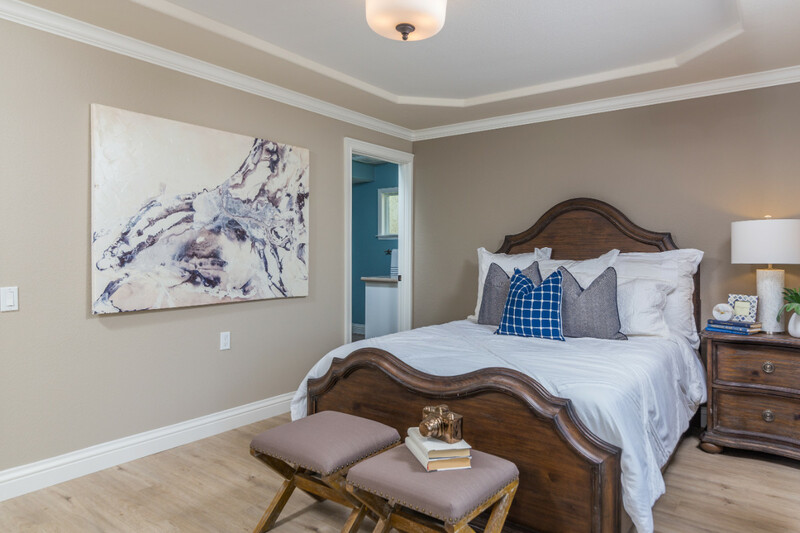 Dark painted accent walls in contrast to bright white crown and baseboards also provide pops of color and interest. 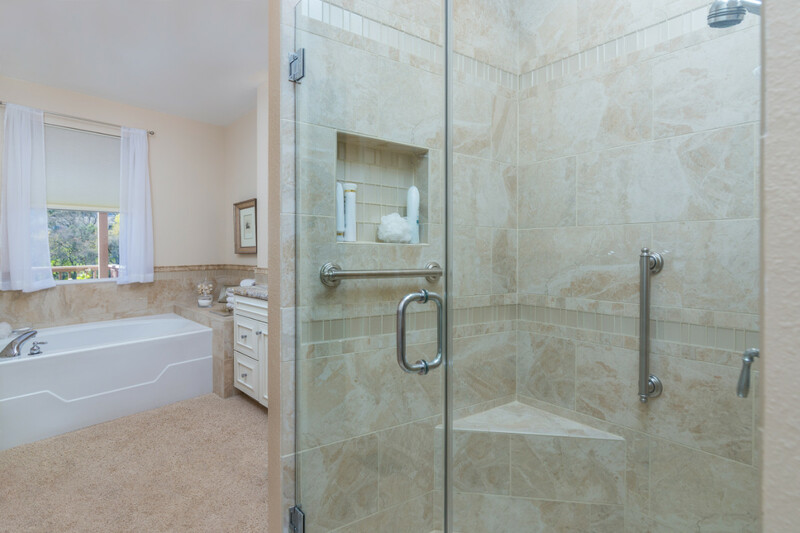 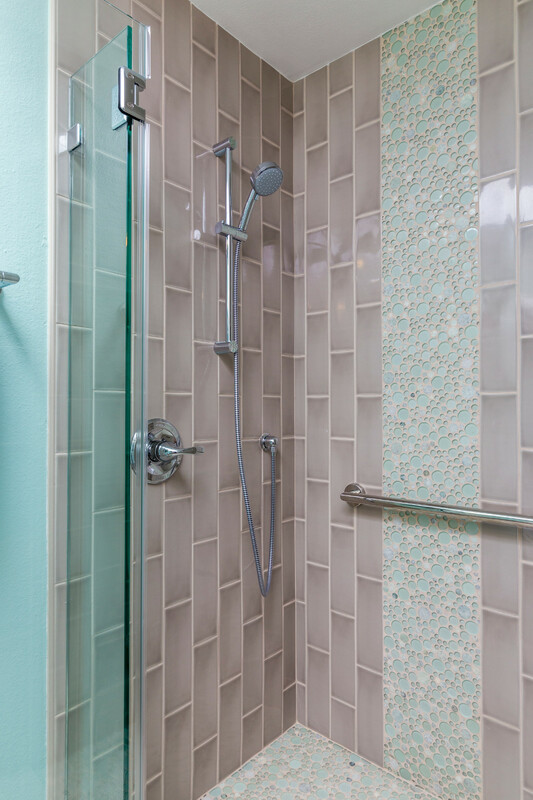 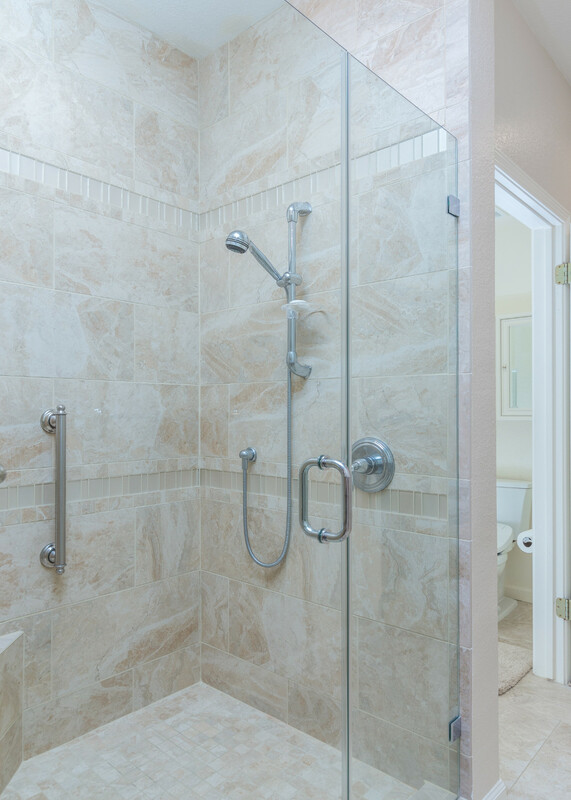 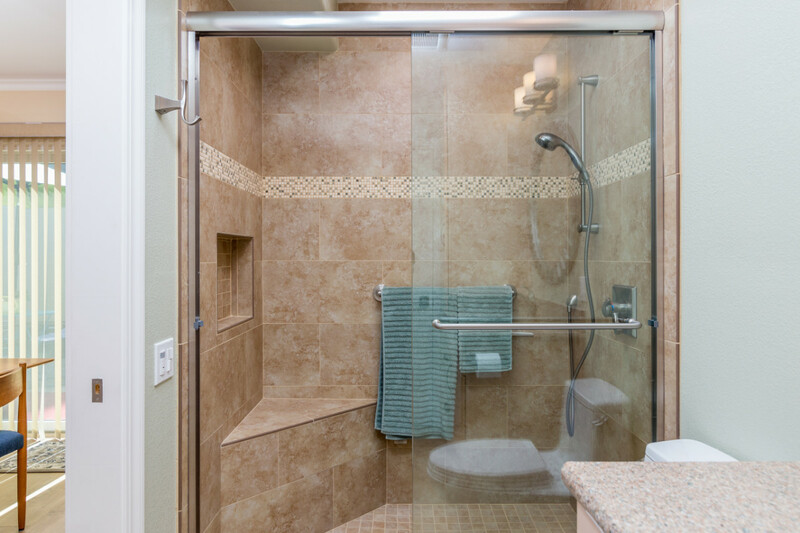 In the bathroom the shower is both beautiful and functional as it allows for barrier-free access, no curb or shower door to worry about. 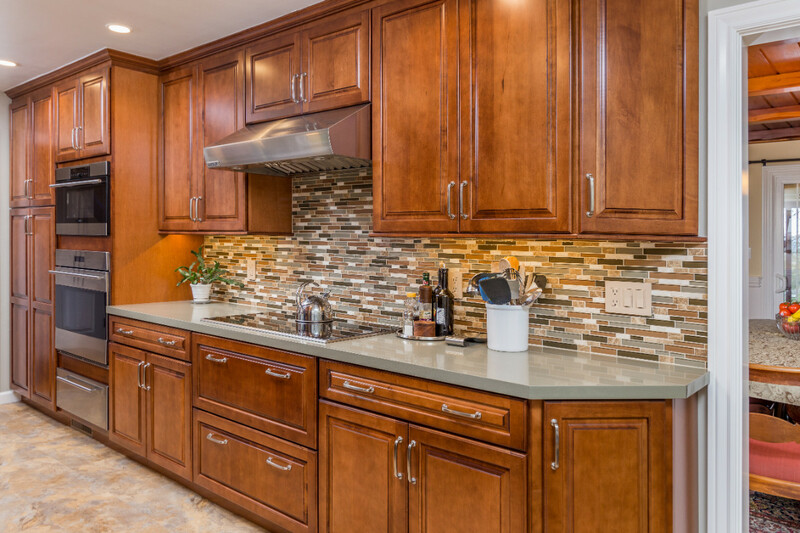 Rich cherry toned maple cabinetry is offset and complimented with natural green tones in the quartz slab countertops and tile backsplash. 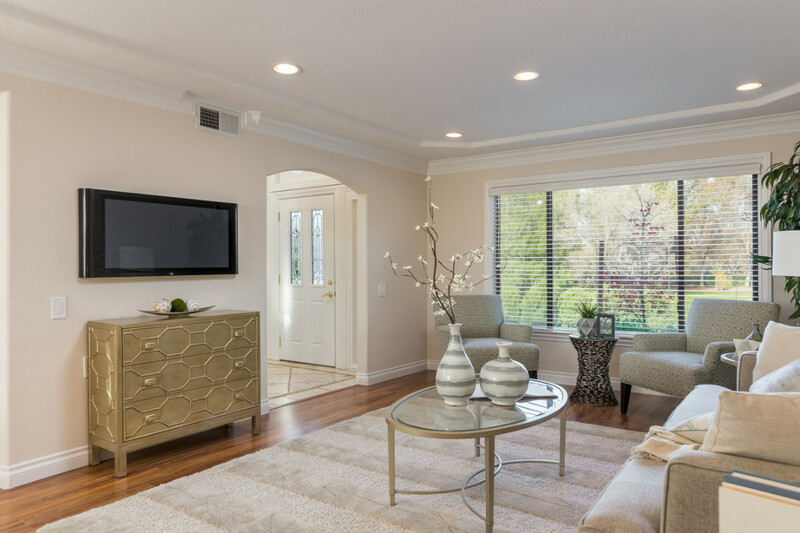 The LVT flooring also has a touch of green along with golds and warm tones that tie the space together. 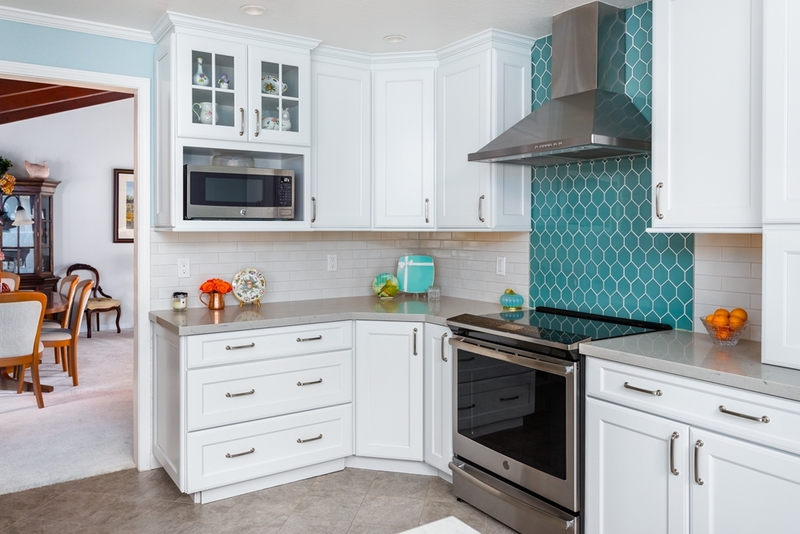 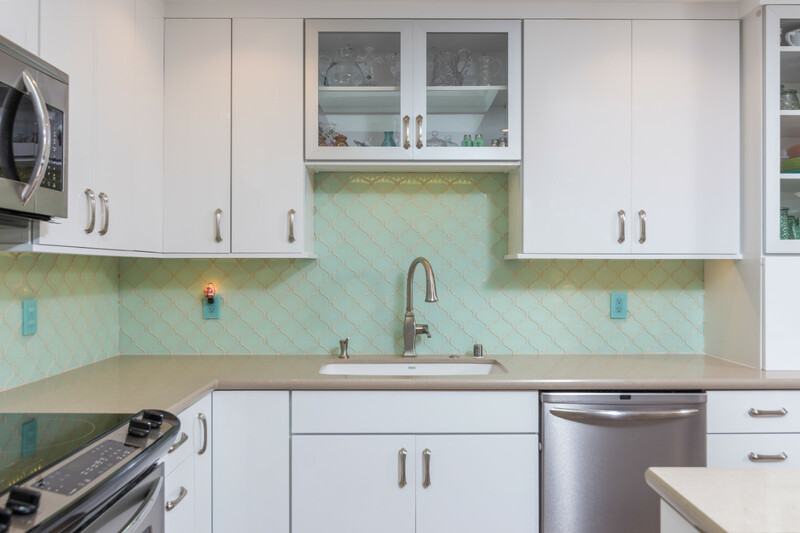 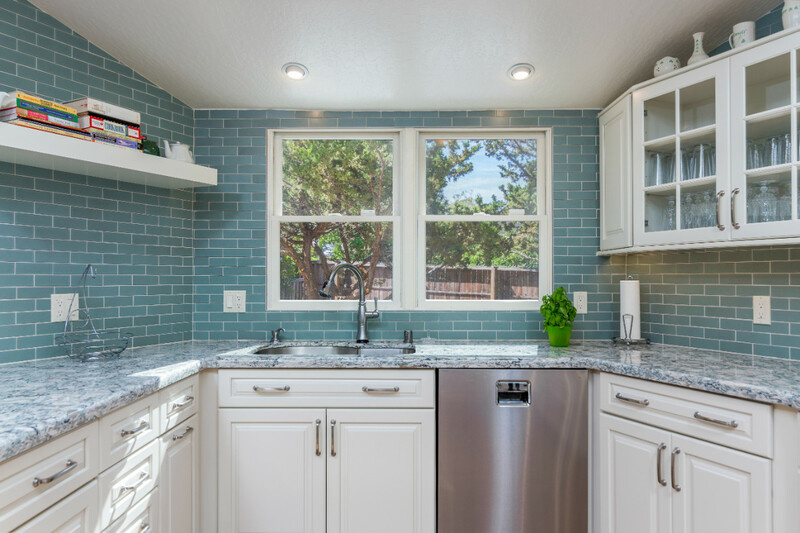 With the drama of the tile design, a simple, plainer countertop was chosen to coordinate. 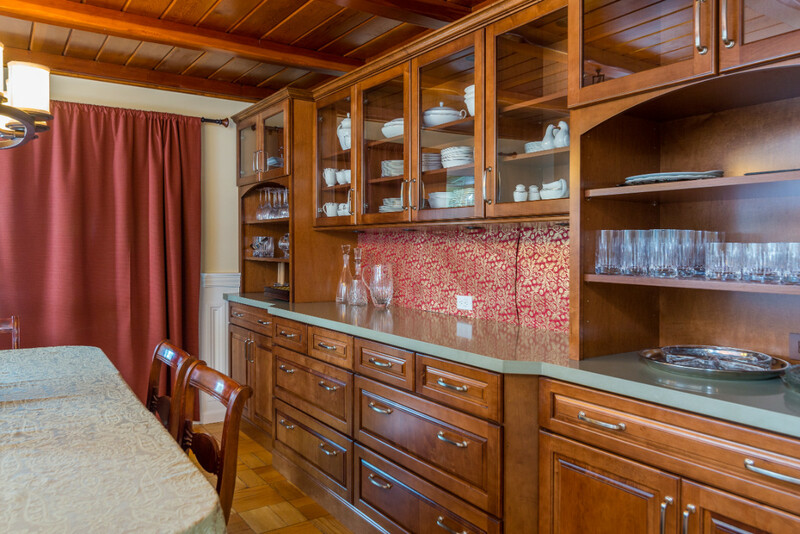 In the dining room the client wanted a large hutch for added storage that would coordinate with the adjacent kitchen space. 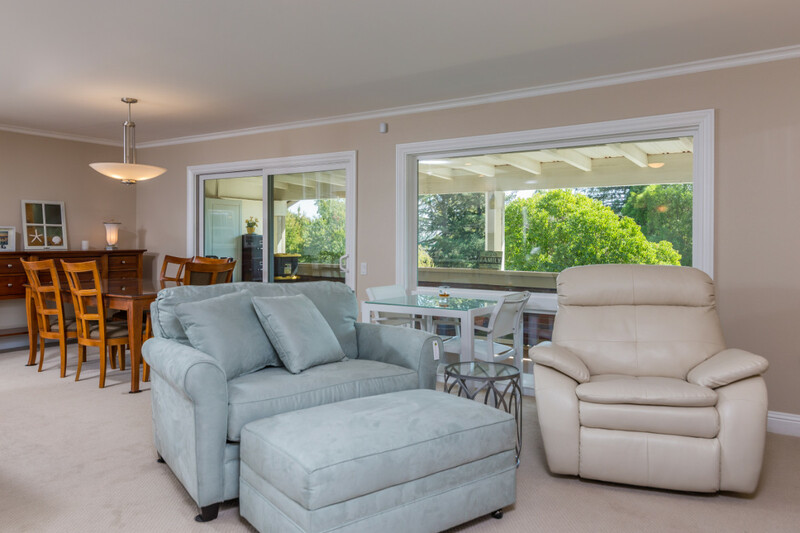 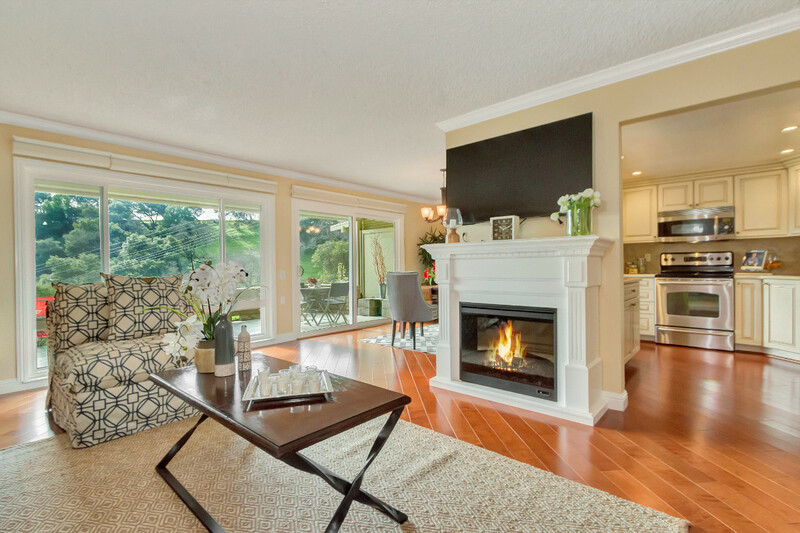 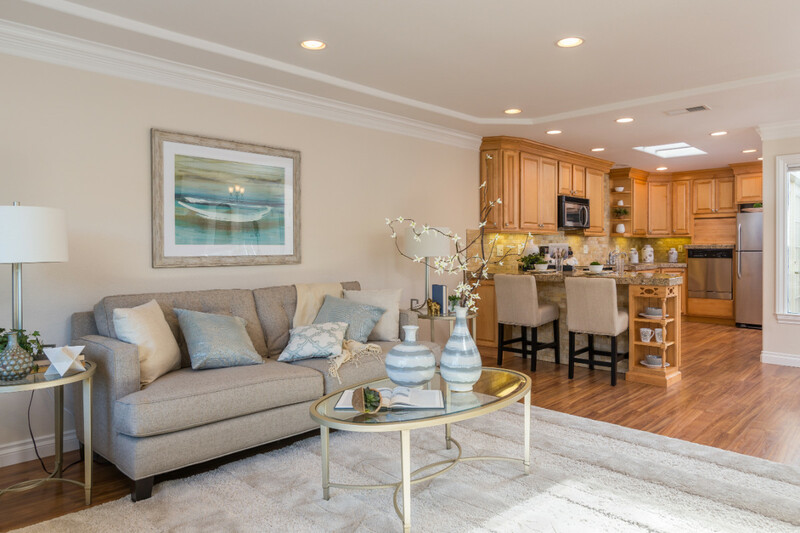 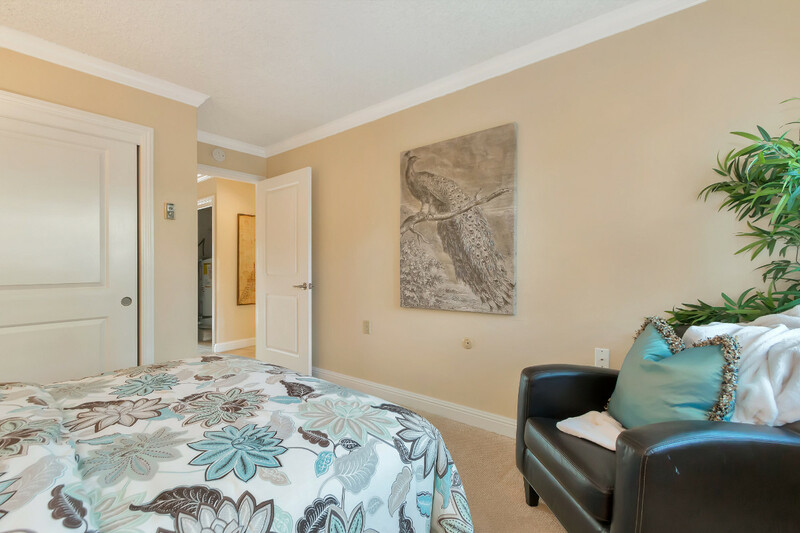 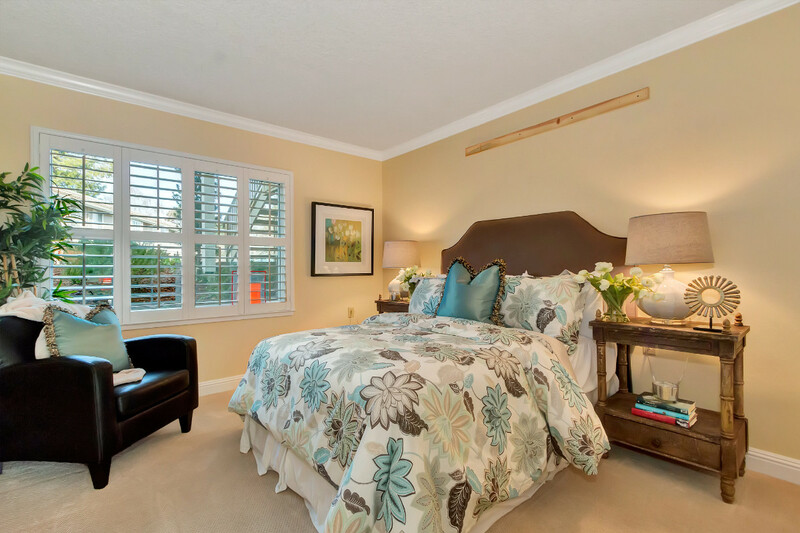 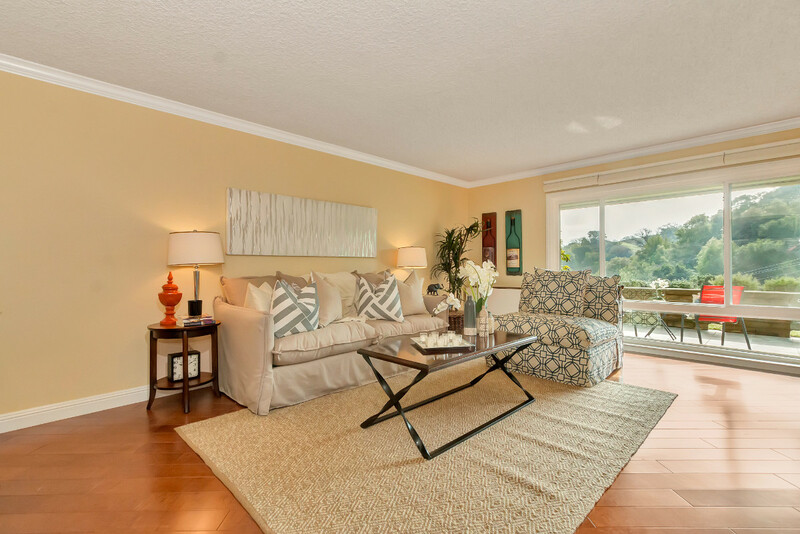 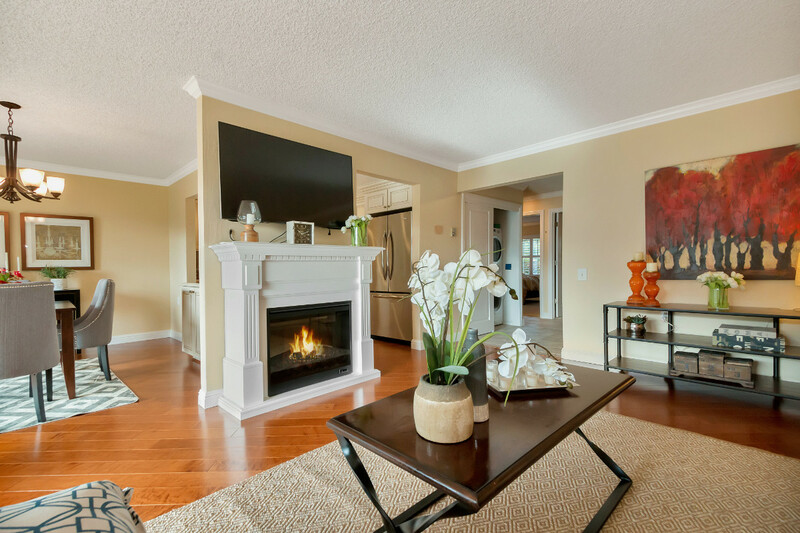 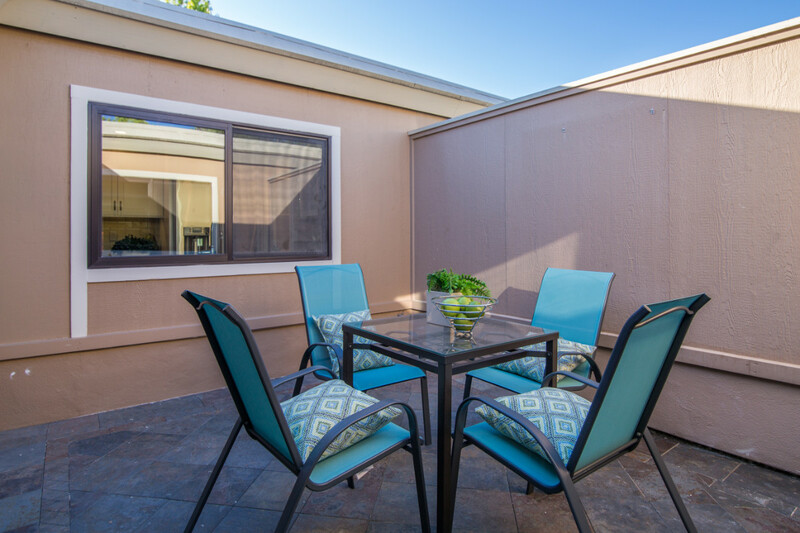 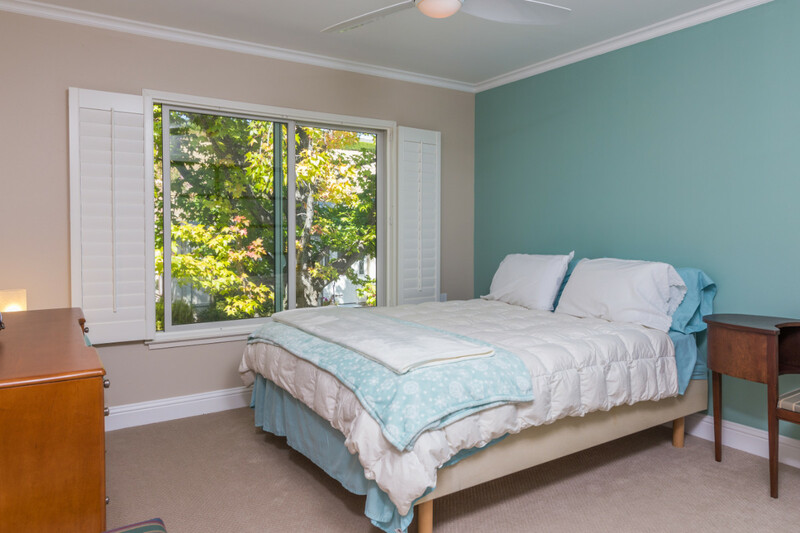 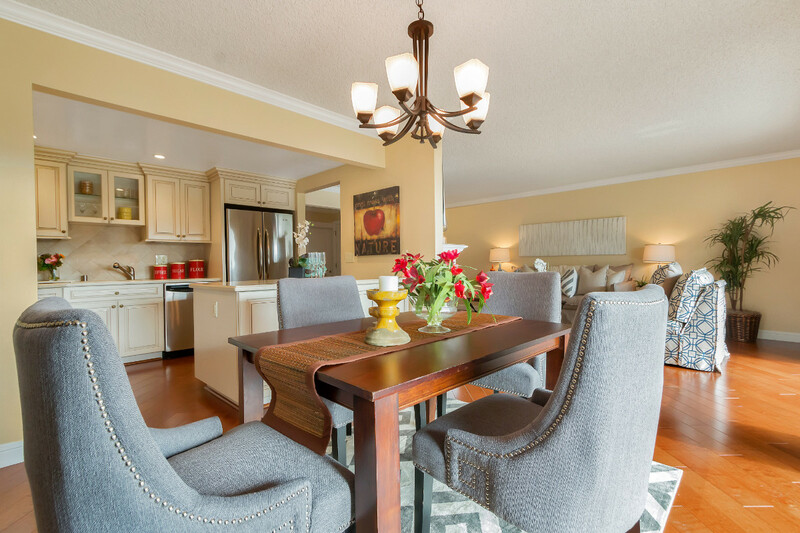 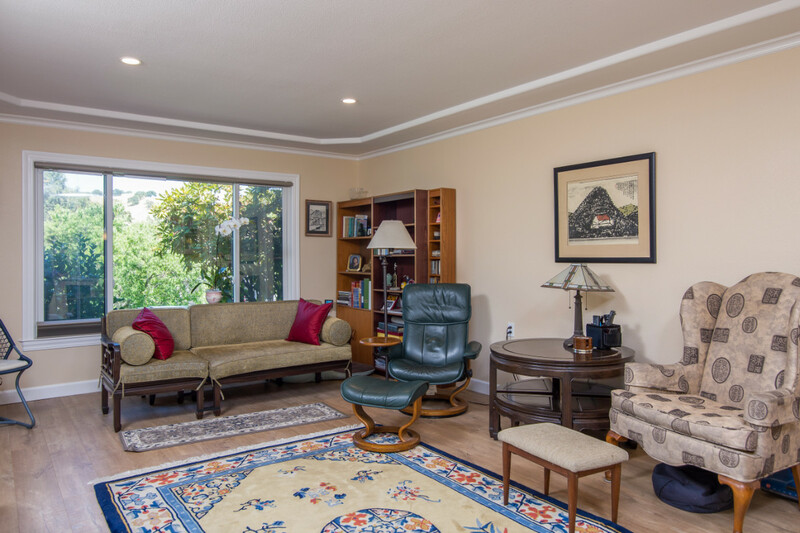 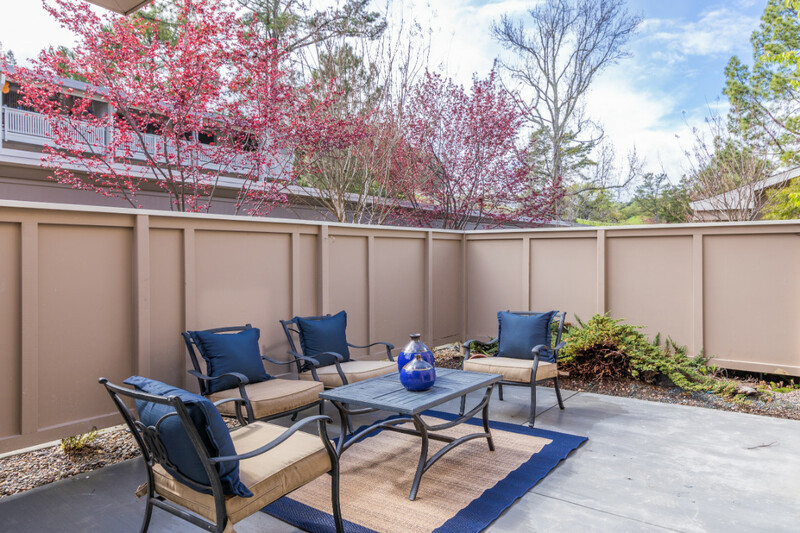 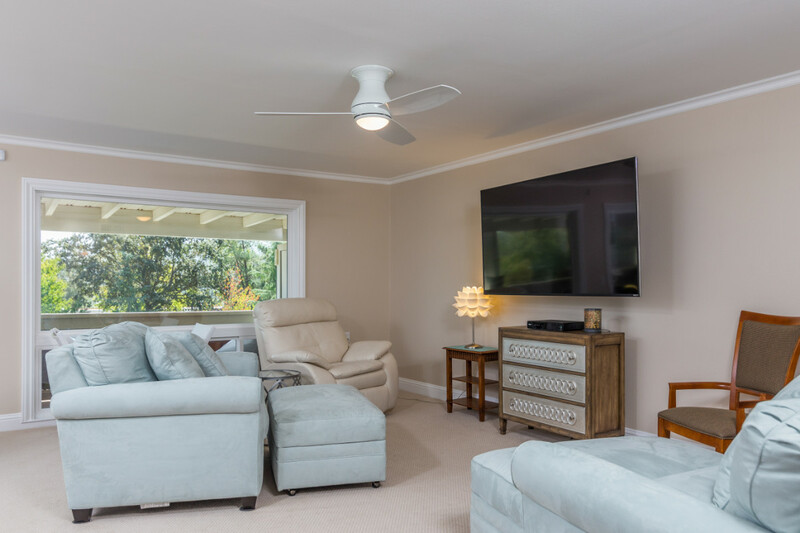 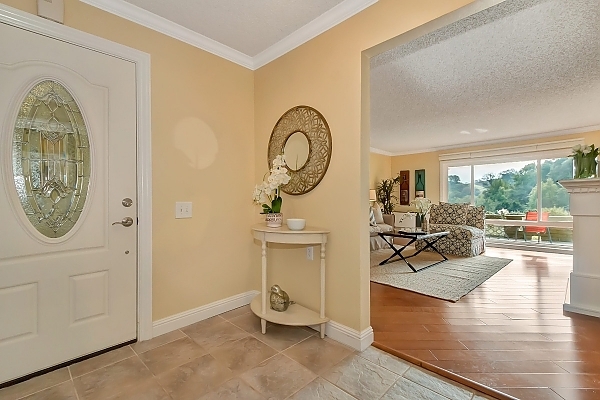 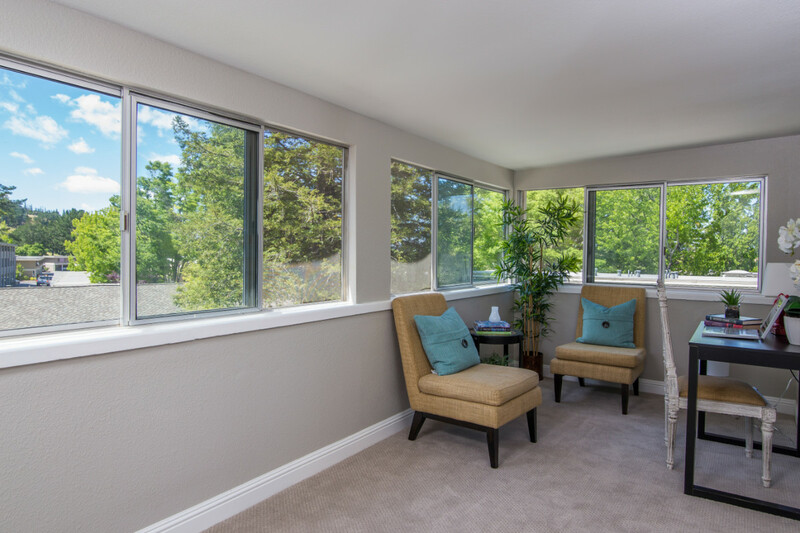 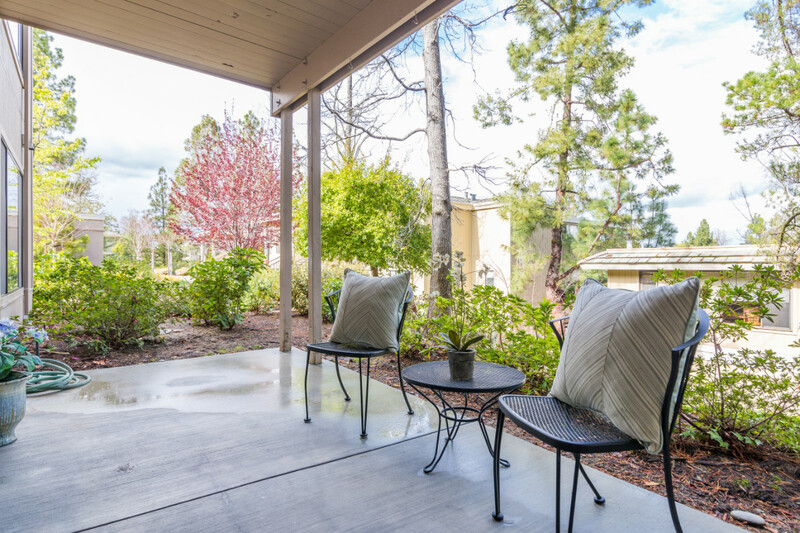 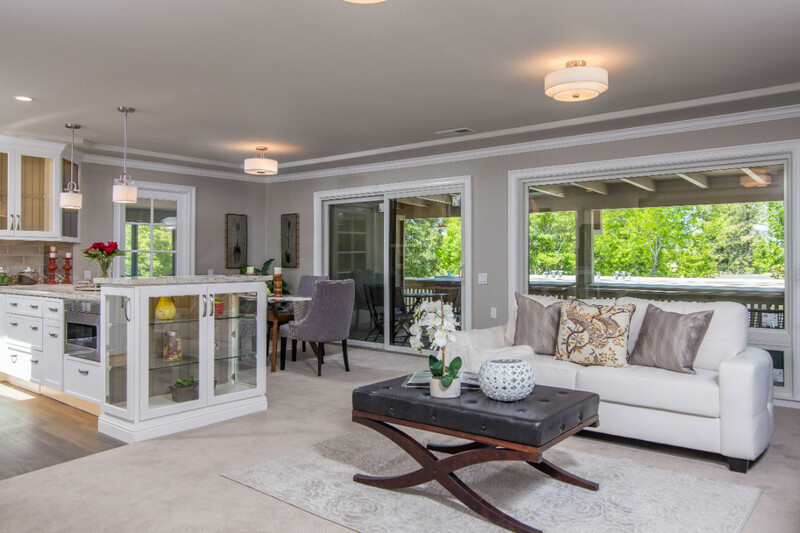 This unit was completely remodeled for resale from top to bottom. 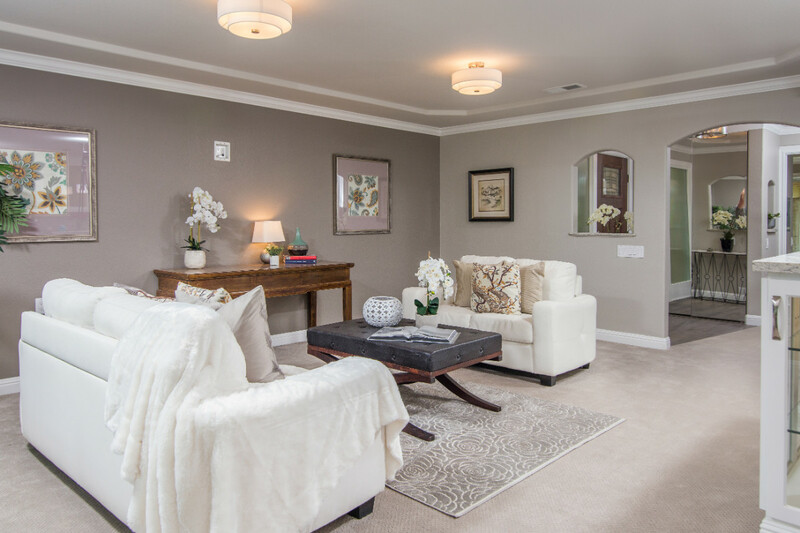 It features warm greige tones throughout. 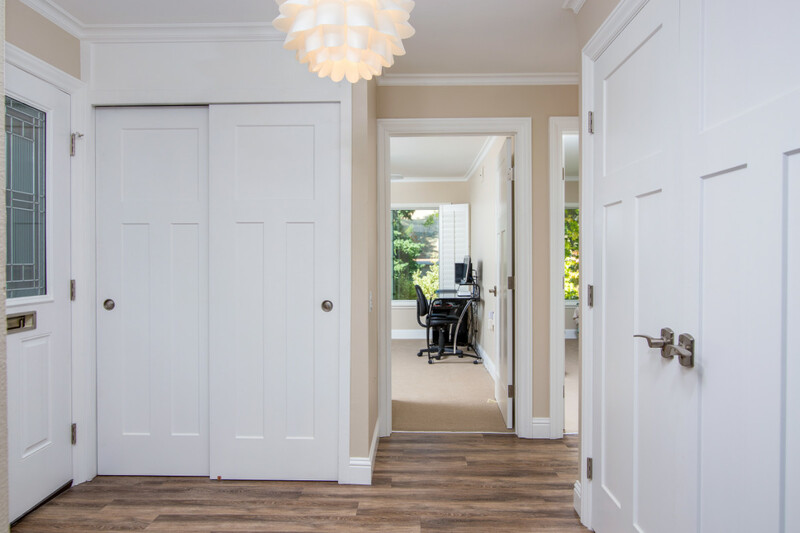 The floors are a contemporary LVT wood plank look. 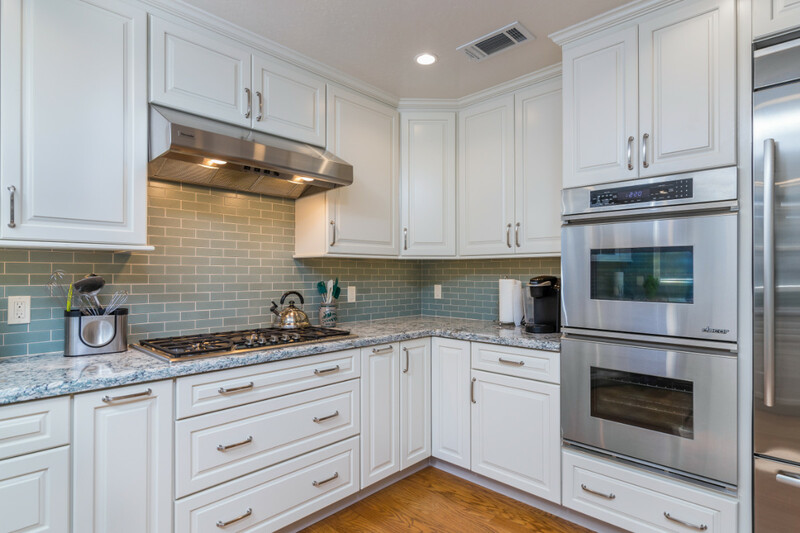 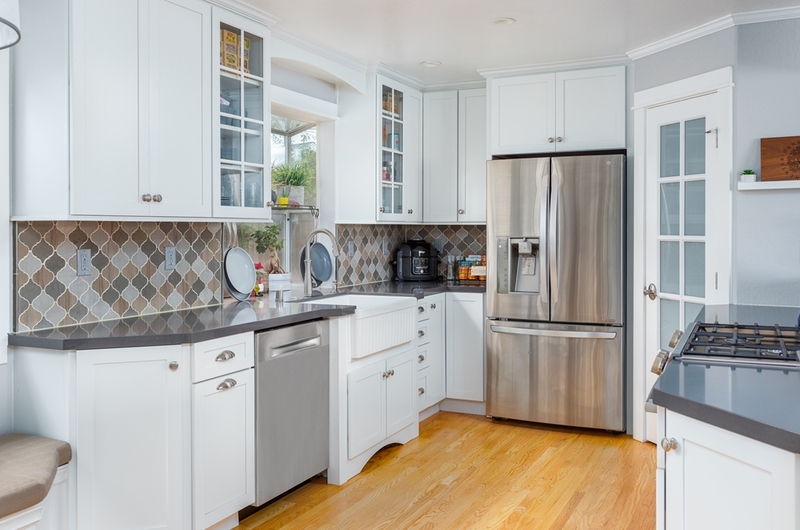 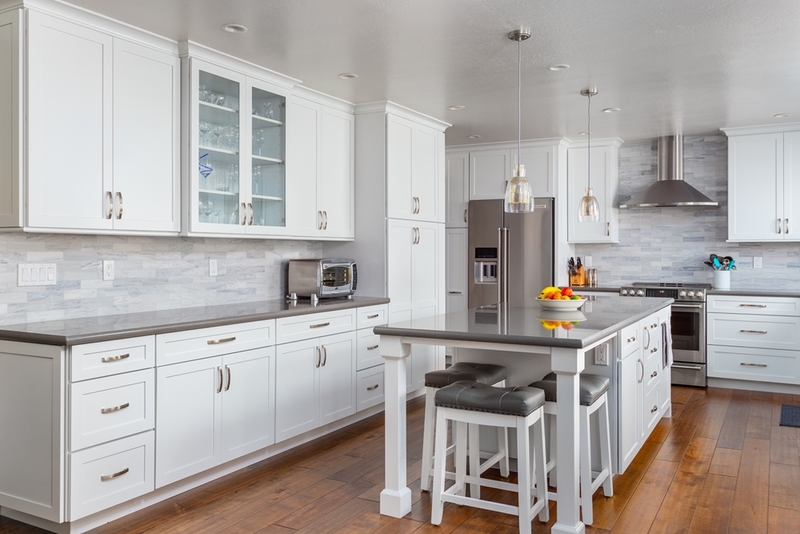 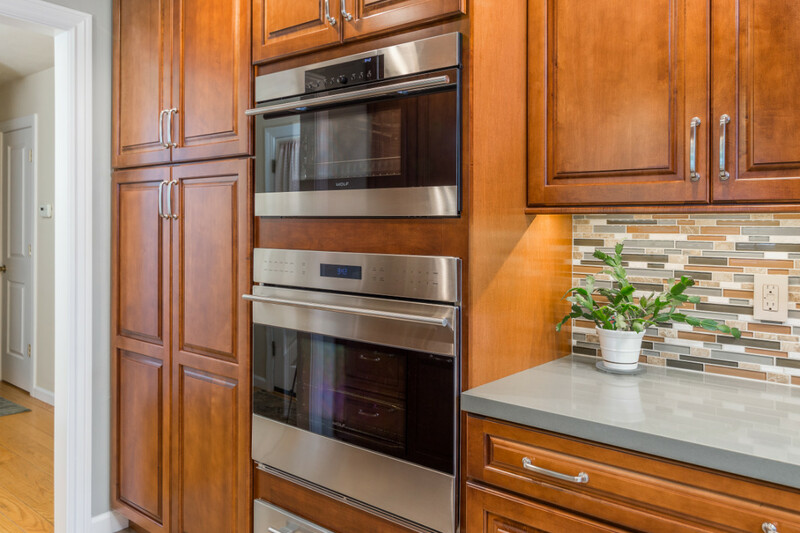 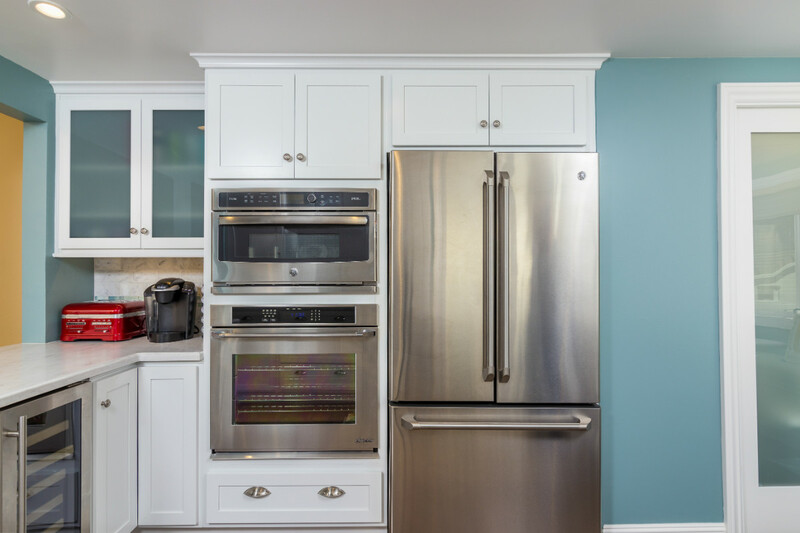 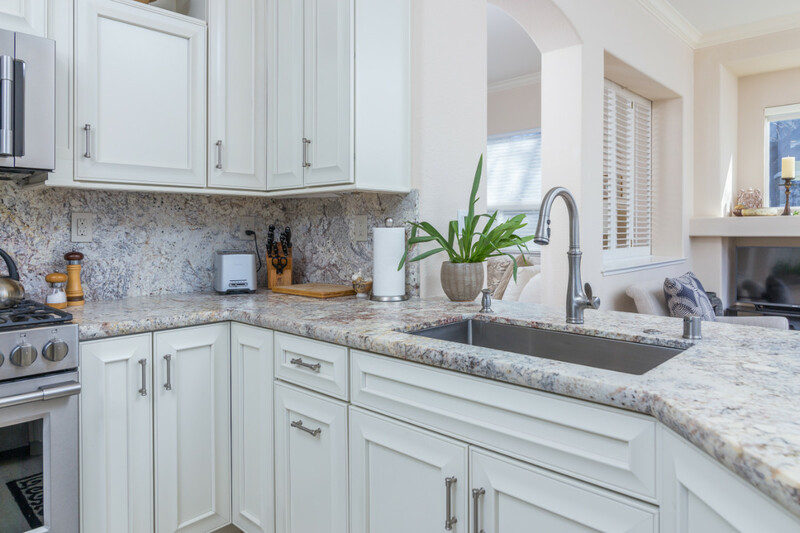 The kitchen and bathrooms feature Kraftmaid cabinetry in an economical ½” overlay shaker style door in a white painted finish with bronze cup pulls and handles that pop. 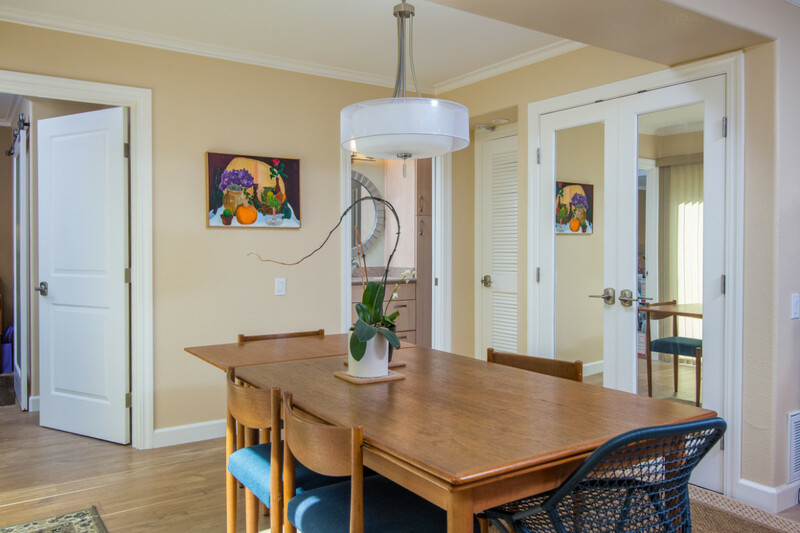 Other bronze fixtures and accents are featured throughout. 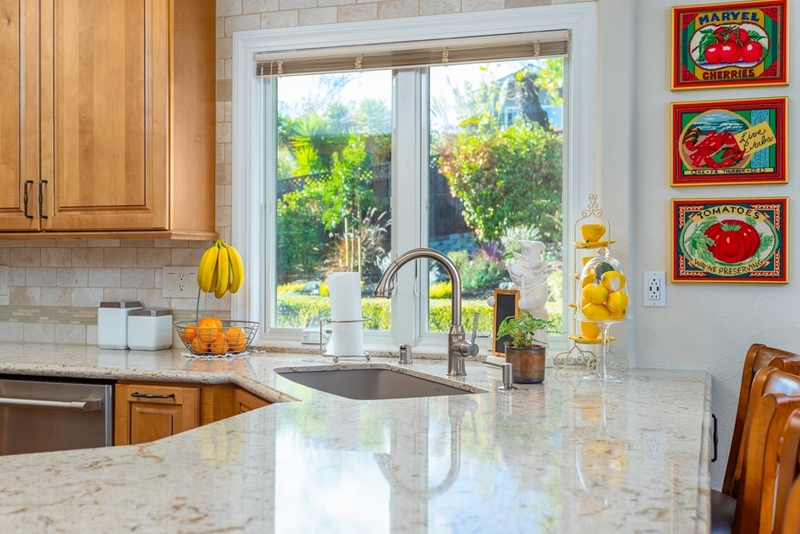 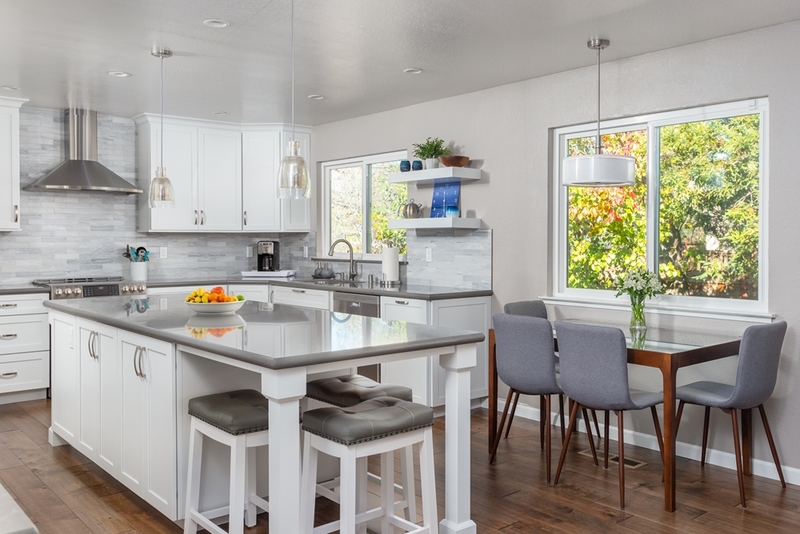 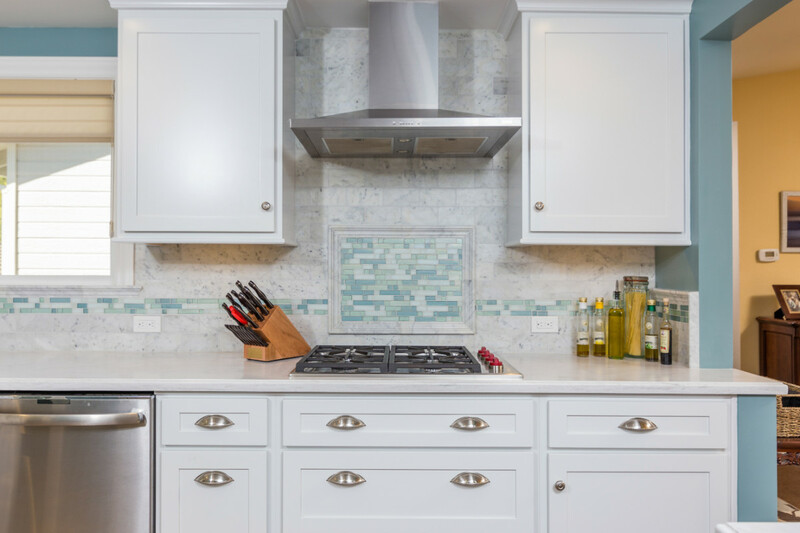 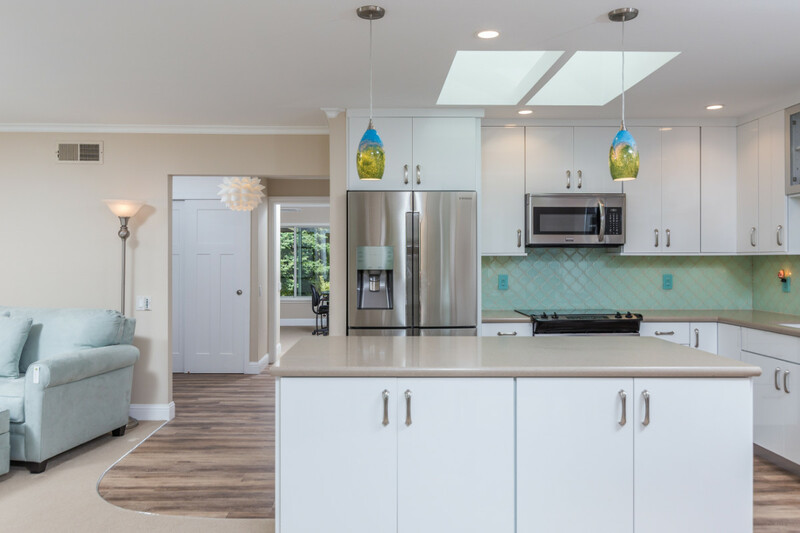 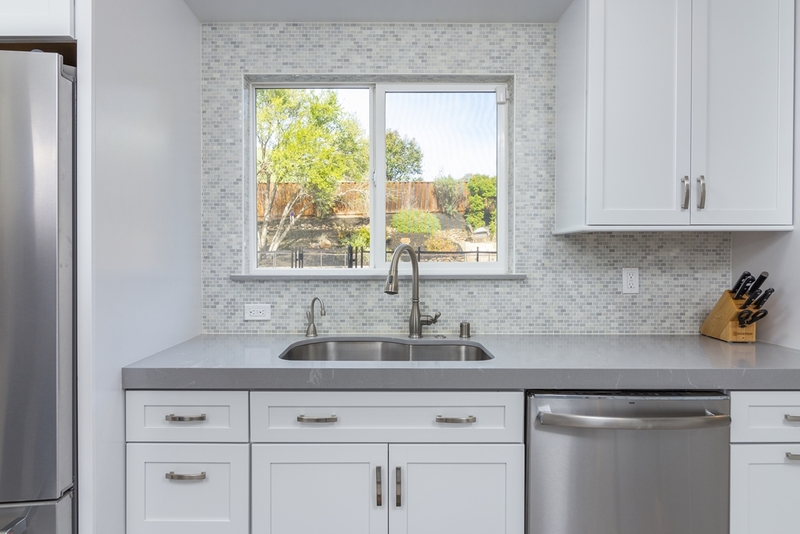 Countertops are Caesarstone Quartz and porcelain, ceramic, stone and glass tiles are all used throughout the home in the kitchen backsplash and bathroom shower surrounds. 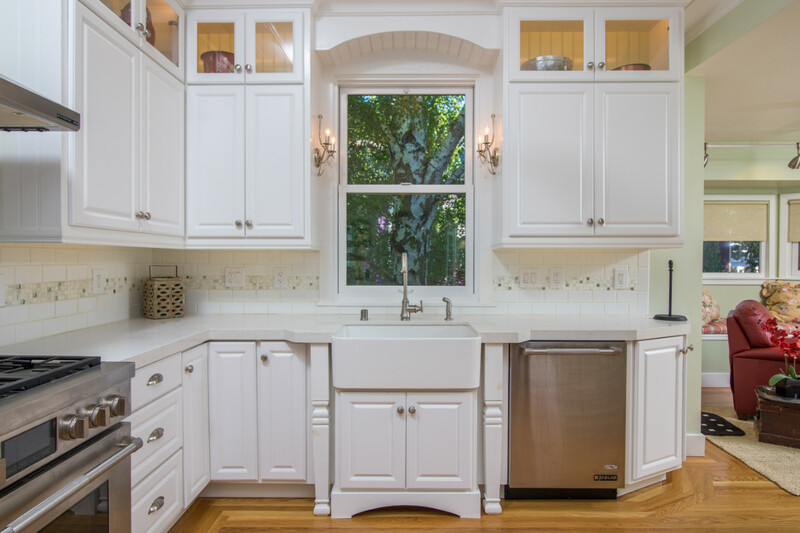 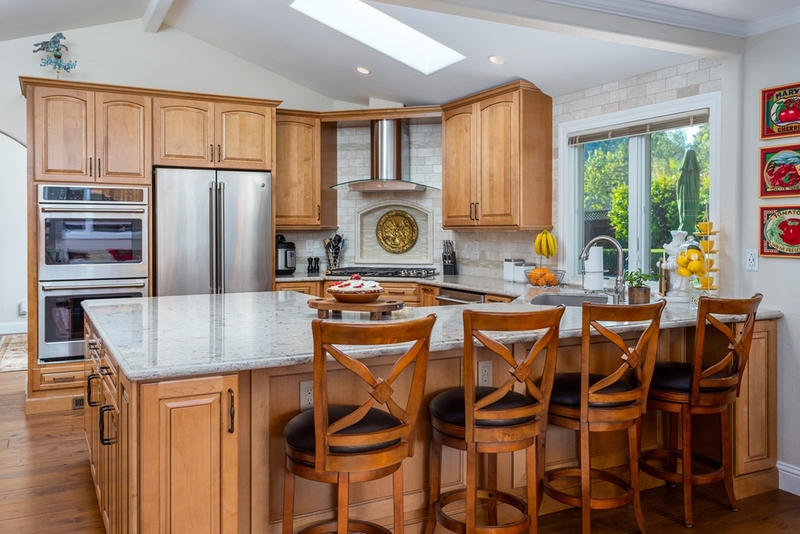 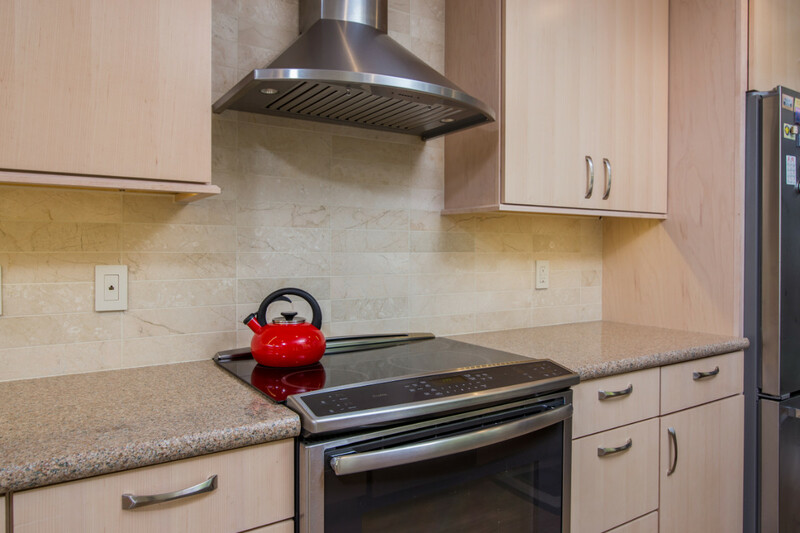 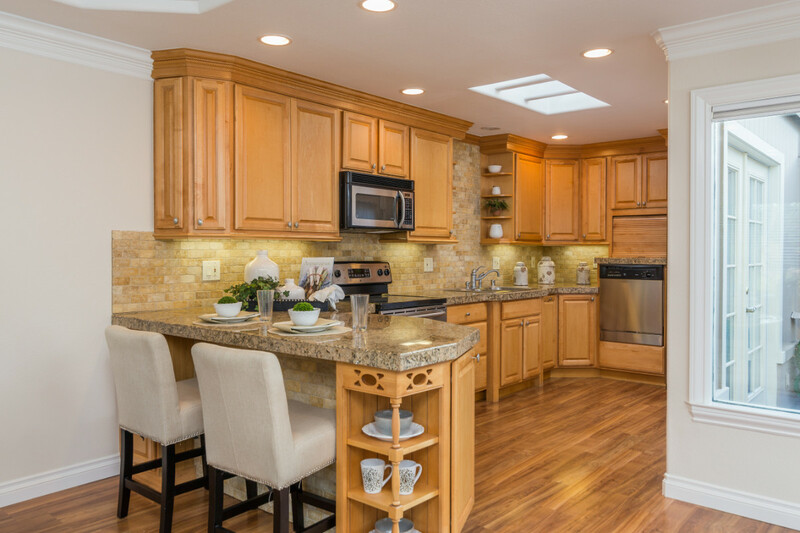 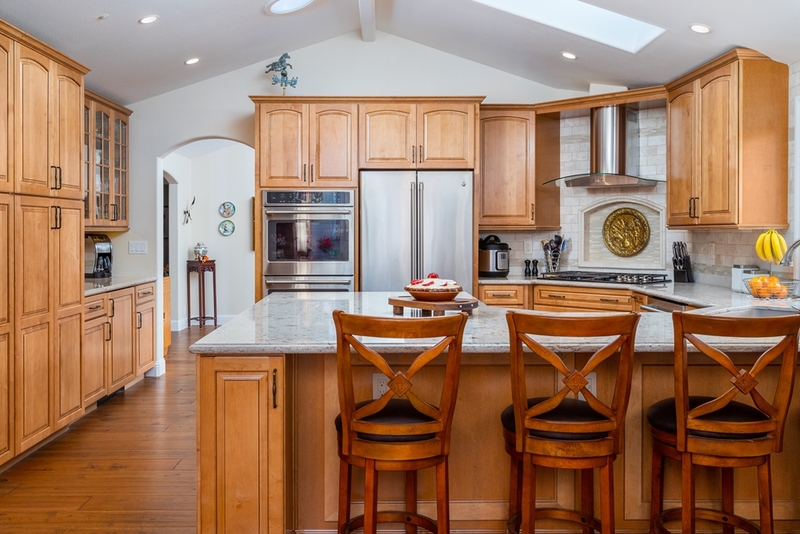 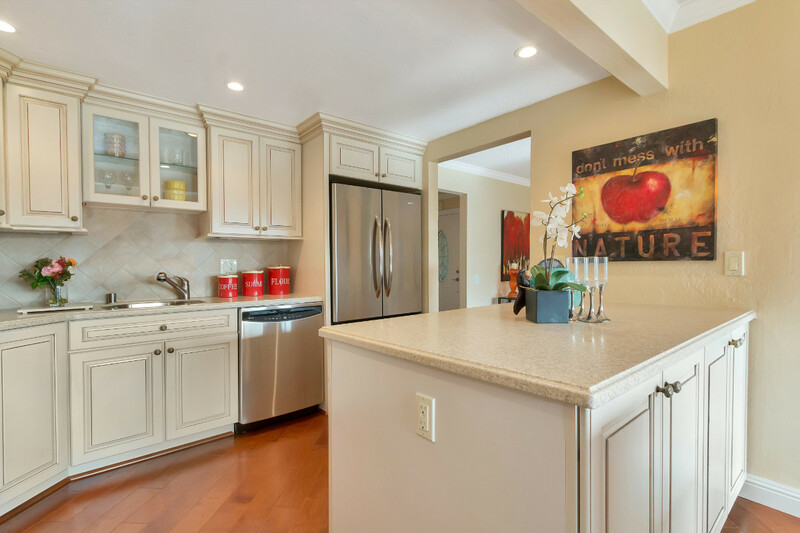 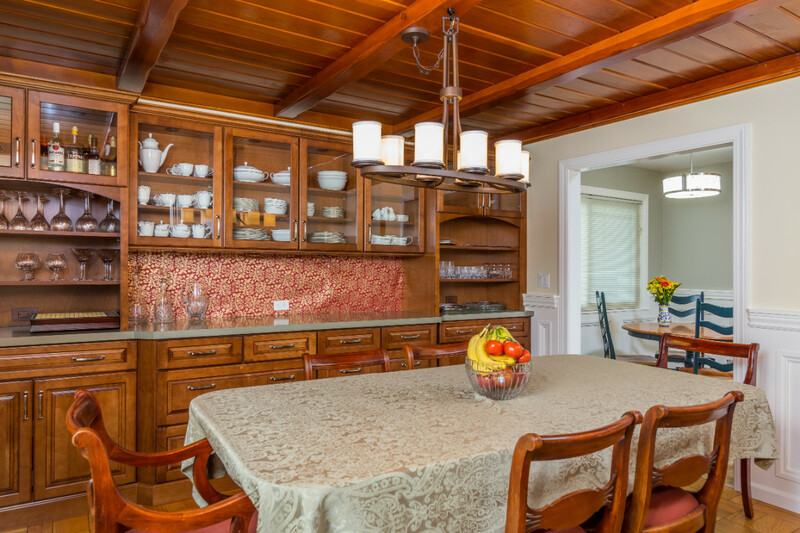 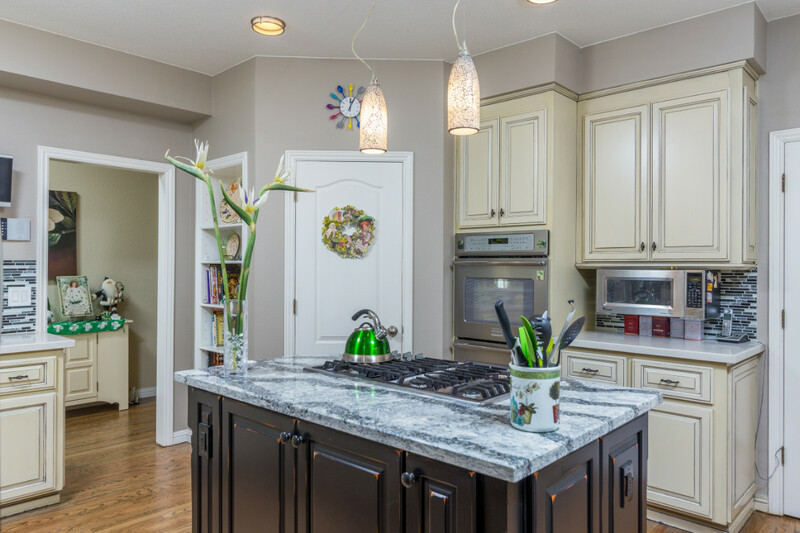 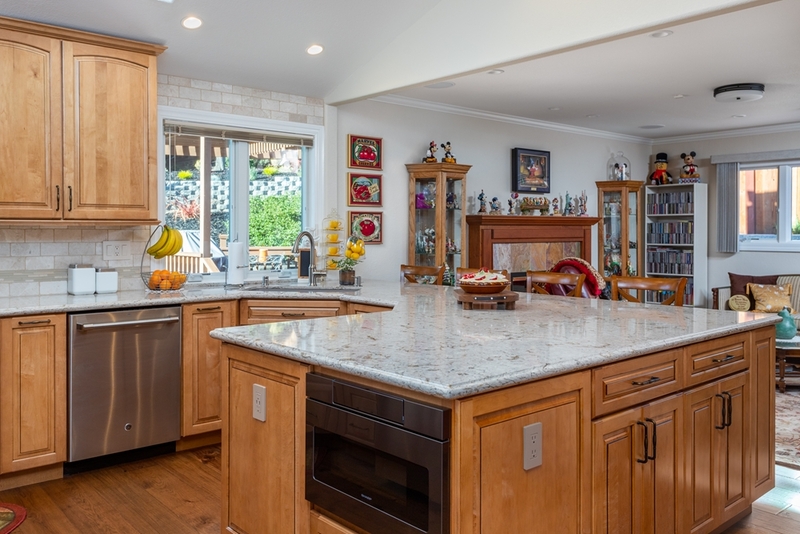 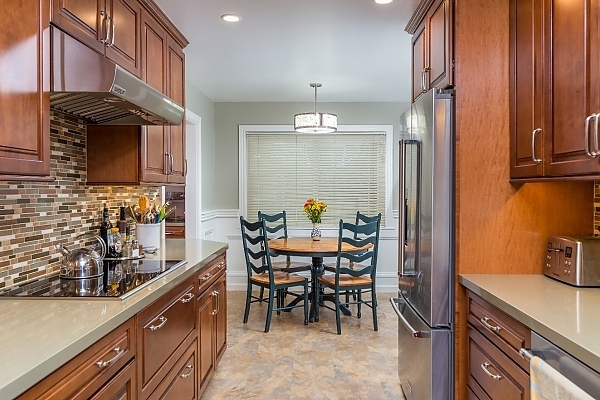 Many remodeling projects occurred in this home over the years starting with the kitchen. 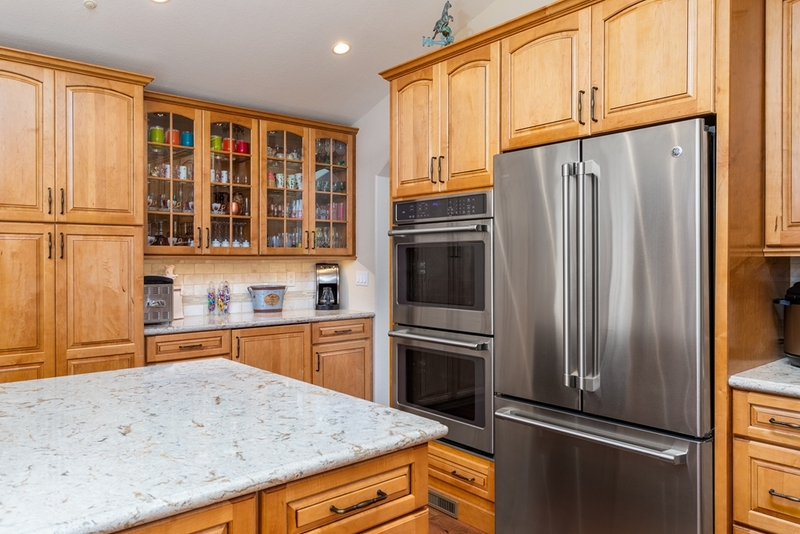 The perimeter cabinets were original, but did get a facelift with a new paint/glaze technique to cover the old oak stained finish. 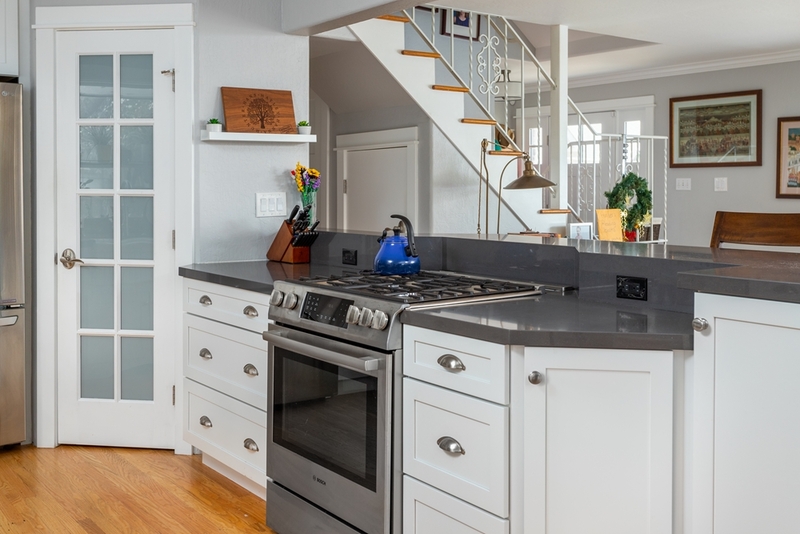 The island was new cabinetry, configured a bit more thoughtfully and in a dramatic distressed black. 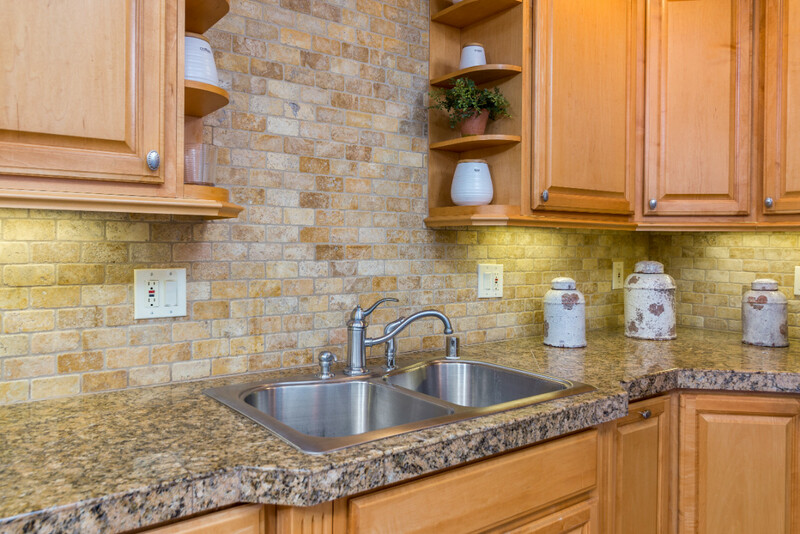 New quartz slab countertops and mosaic stone/glass backsplash further finished off the space. 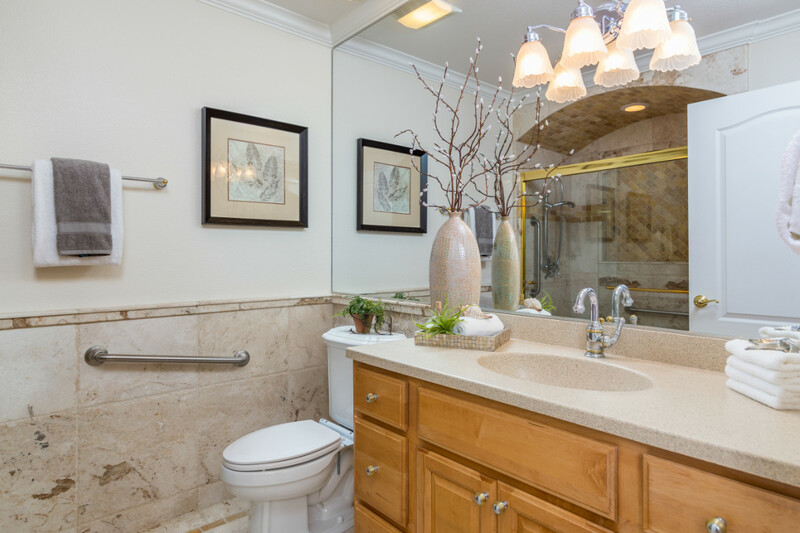 The Master bathroom got a major re-design in later years. 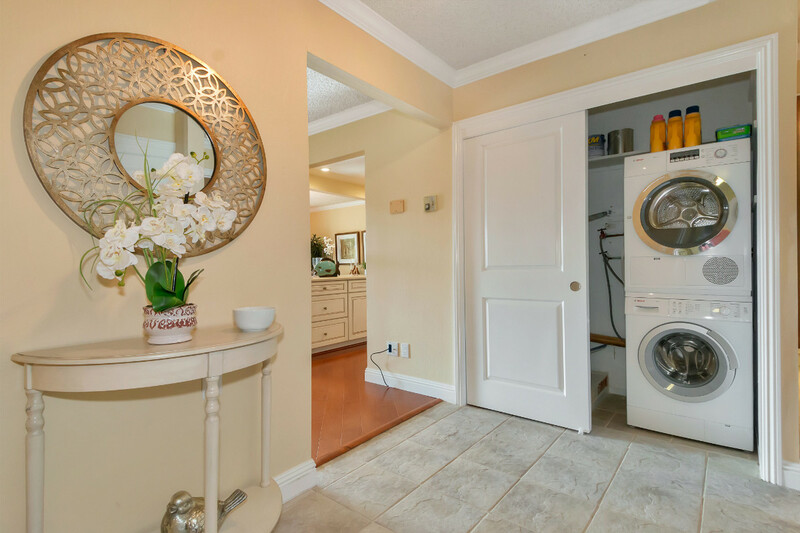 It was poorly laid out with a lot of wasted space and an adjoining closet that was very small. 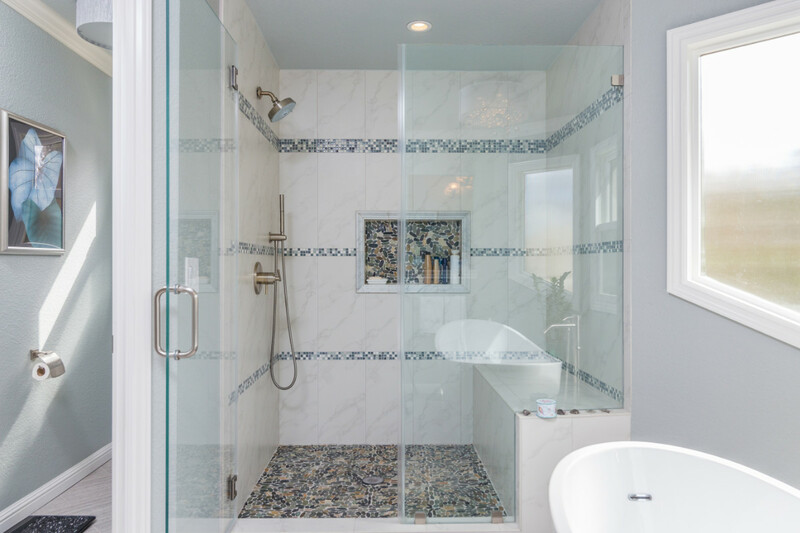 We were able to redesign the space to a modern masterpiece with a sleek free-standing soaking tub, and beautiful tiled shower surround. 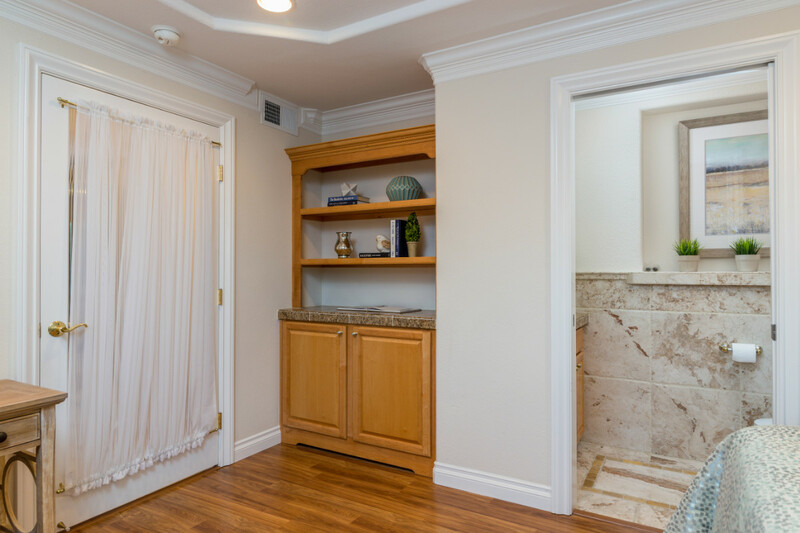 The vanity area was further opened up to the bathing areas with a new pass through opening in an existing wall which also allowed a lot more natural light to flow through. 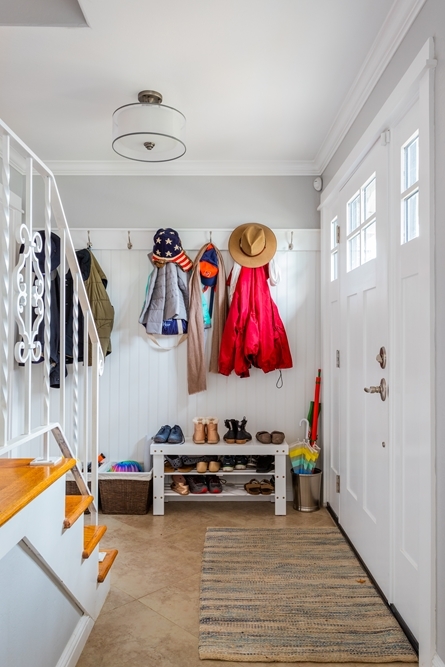 The master walk-in closet was then greatly expanded with his and her sides organized to perfection. 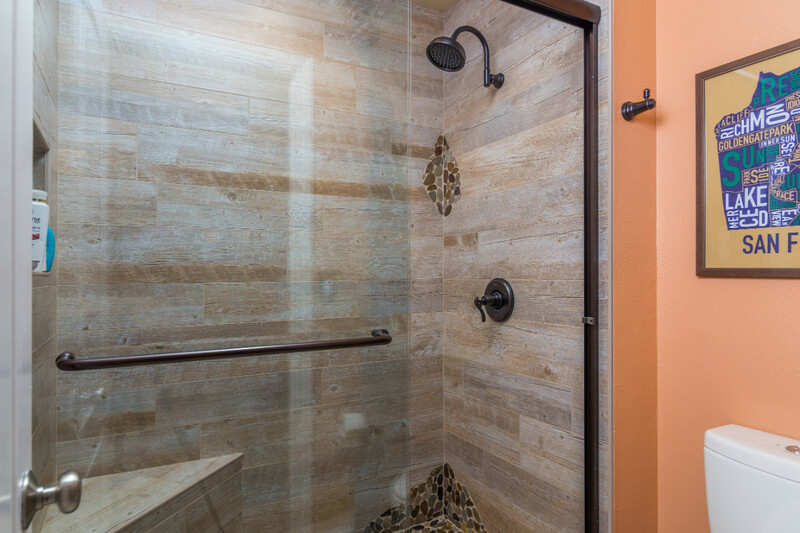 The downstairs guest bath was also remodeled with some dramatic color tones, a wood look porcelain tile shower surround with pebble accent tiles and bronze fixtures. 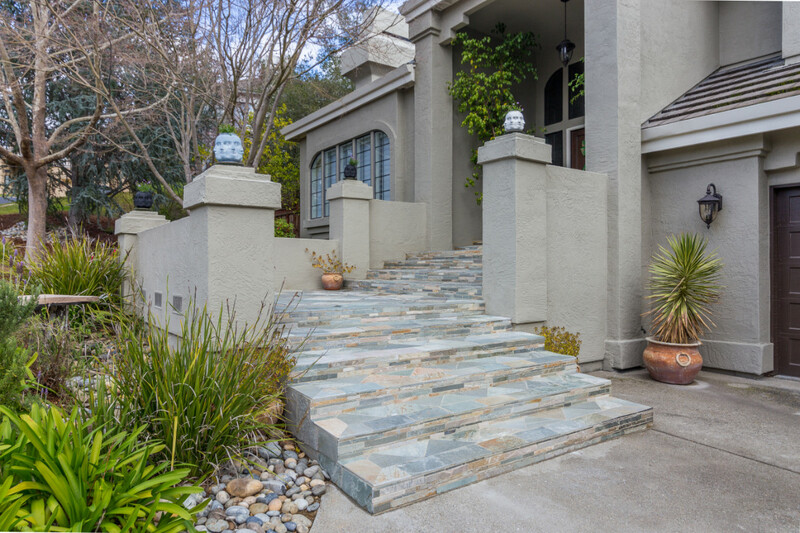 We also did a wonderful update the stair railing, modernizing it with iron balusters and a new handrail. 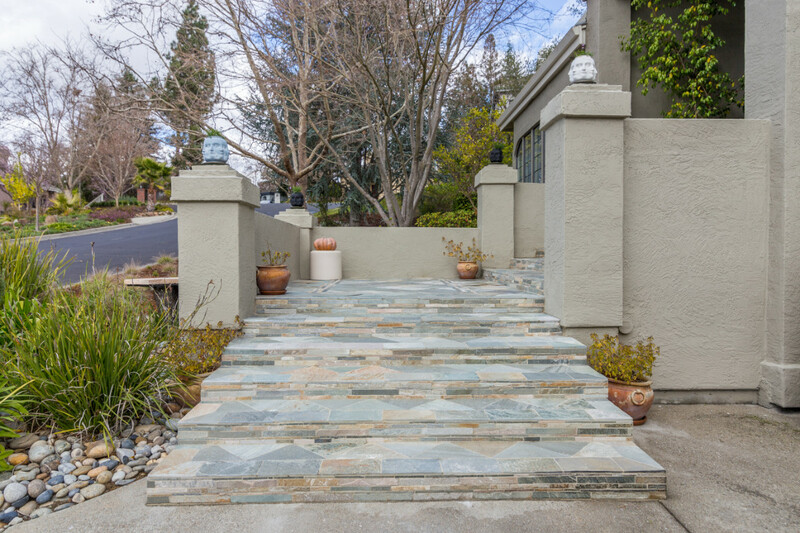 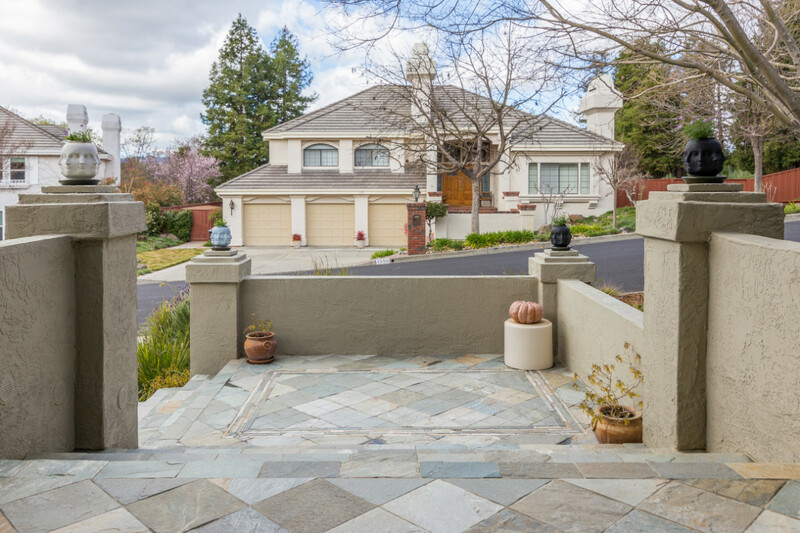 Other remodeling projects included refinishing of floors, exterior tiled steps and mailbox, and complete re-painting of the exterior. 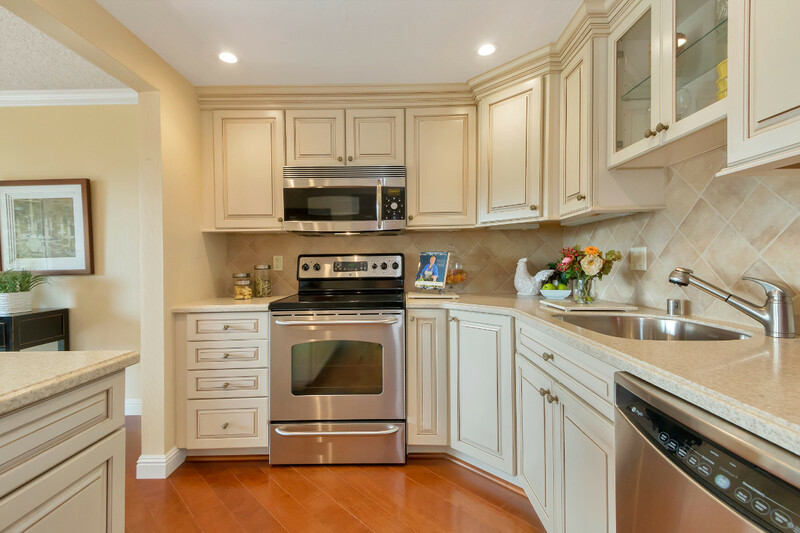 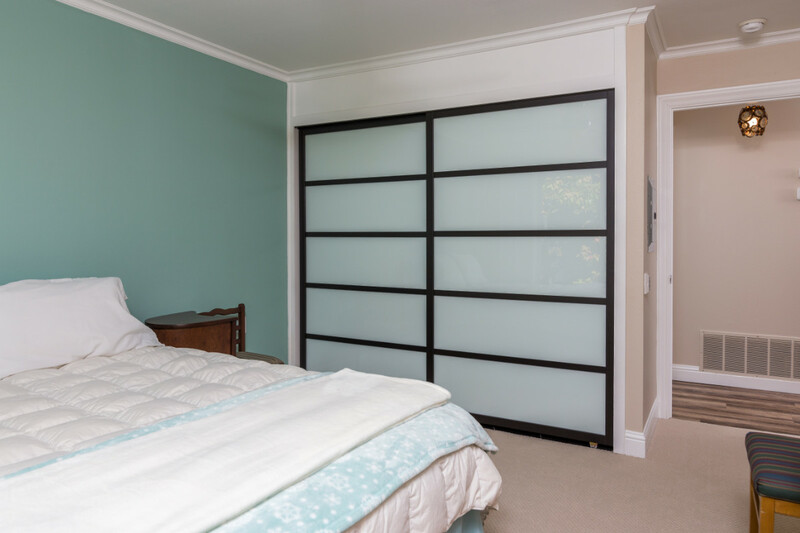 In this unit we custom built the cabinetry on site and ordered laminate, pre-finished, shaker style doors. 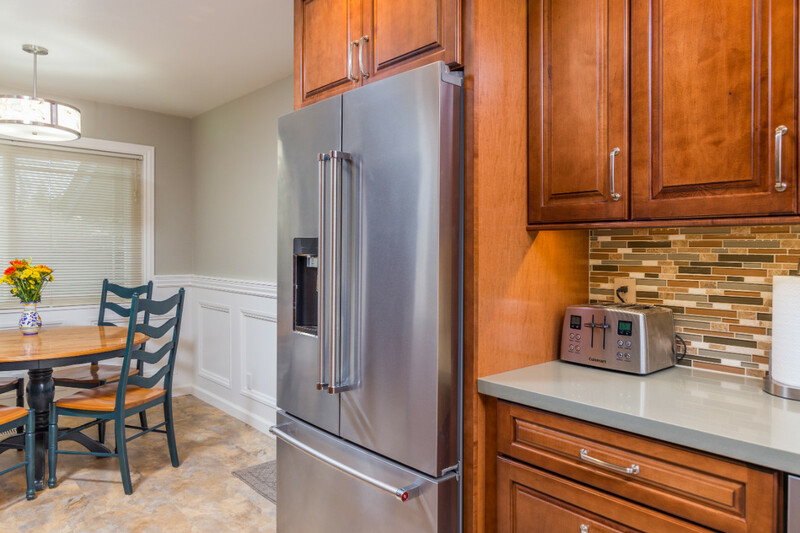 Taking down some walls the kitchen is now open concept with thoughtful details such as an open display shelf on the end of the refrigerator/side panel. 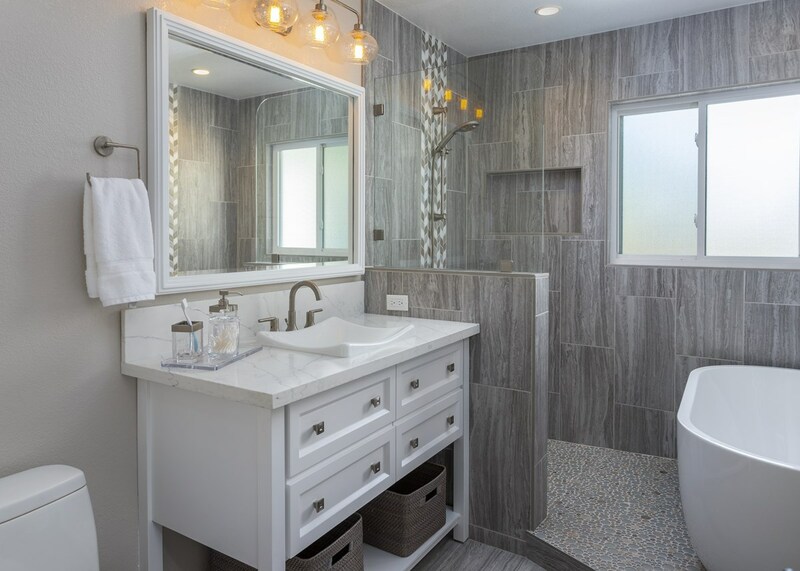 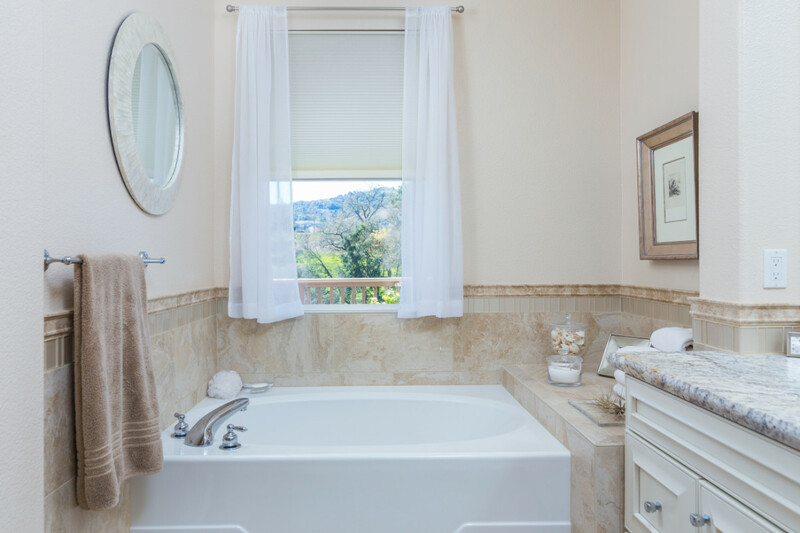 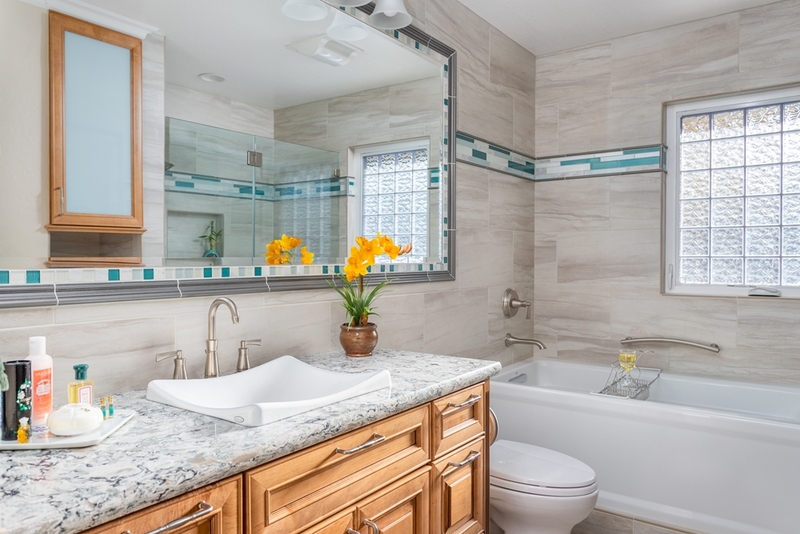 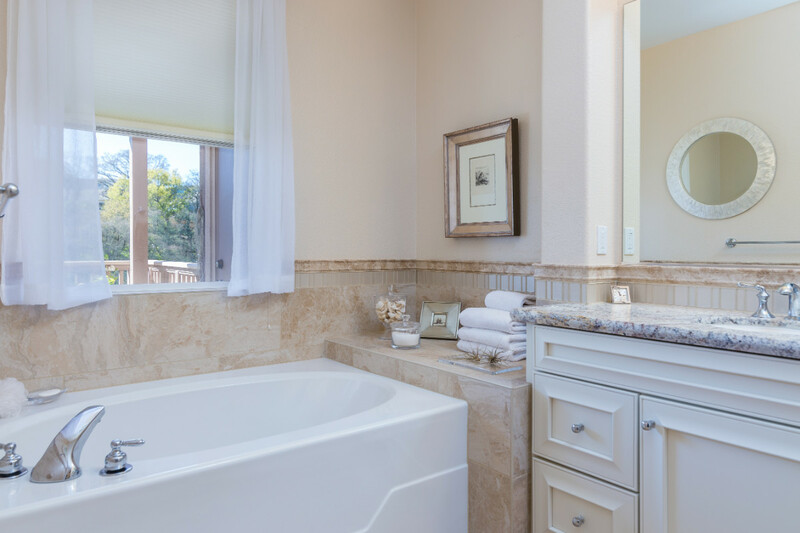 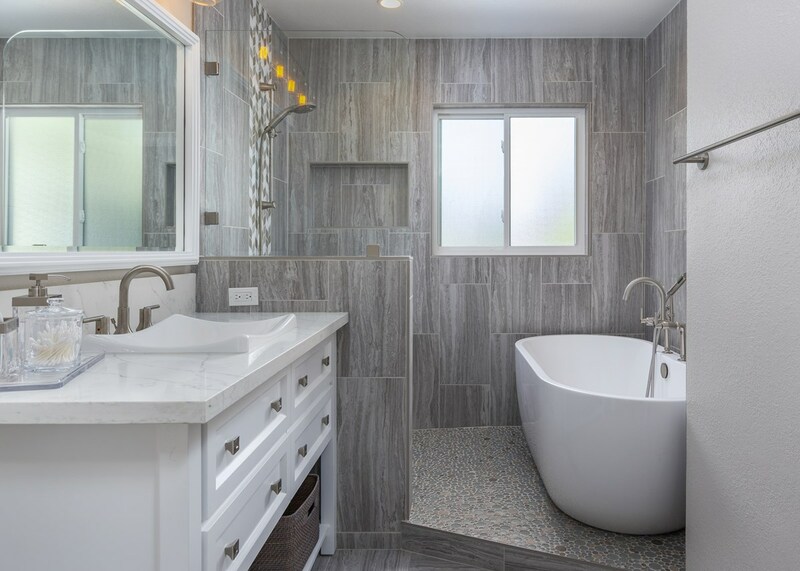 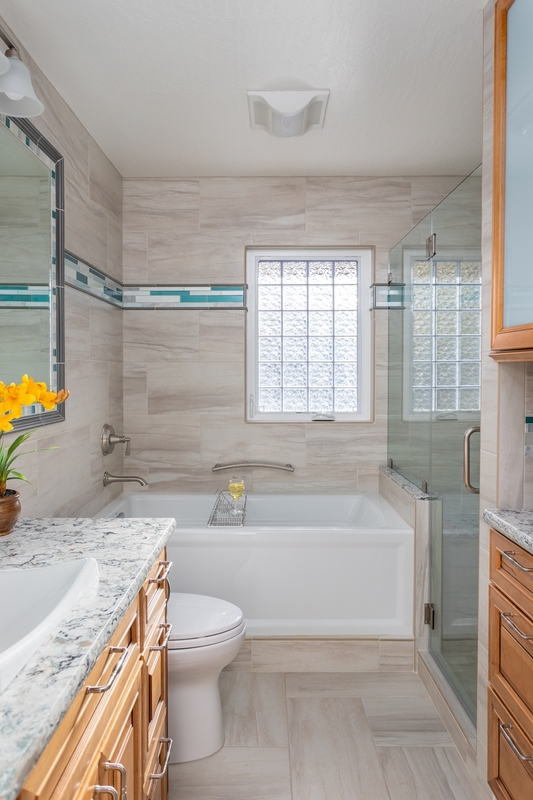 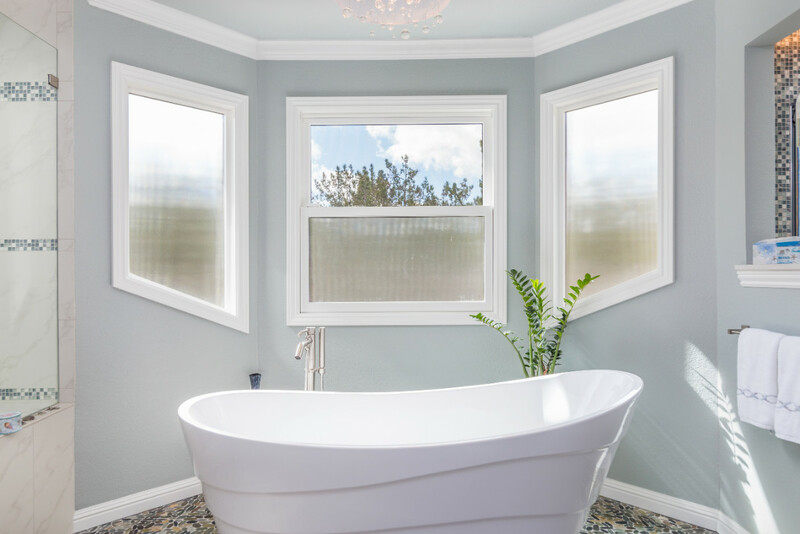 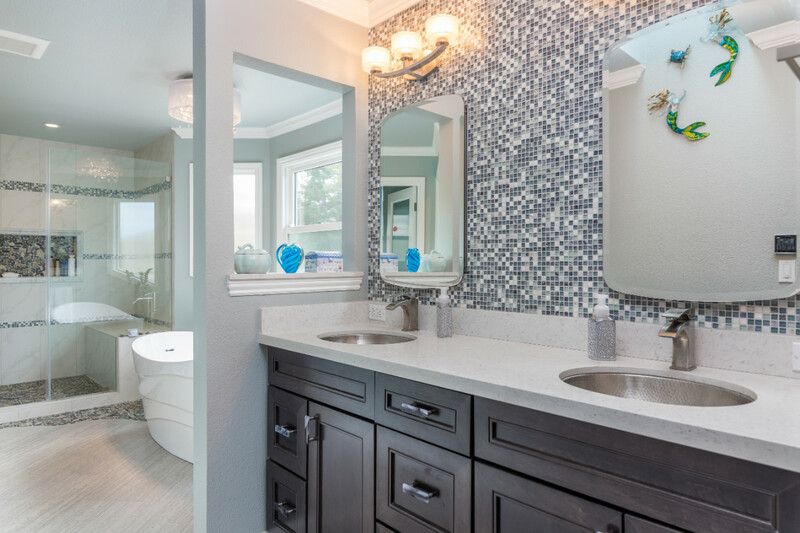 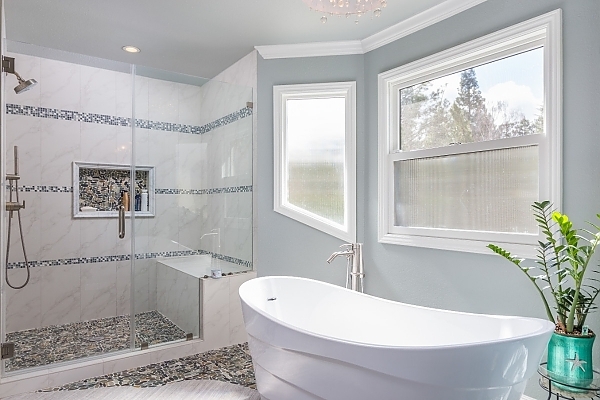 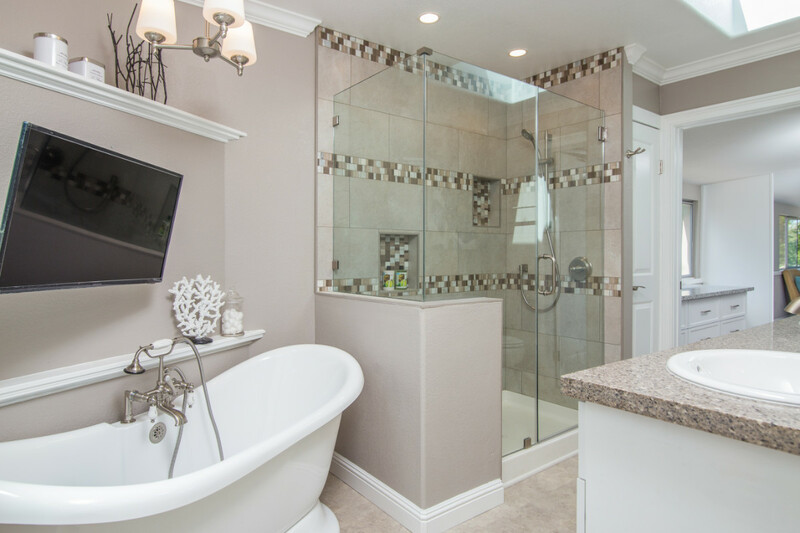 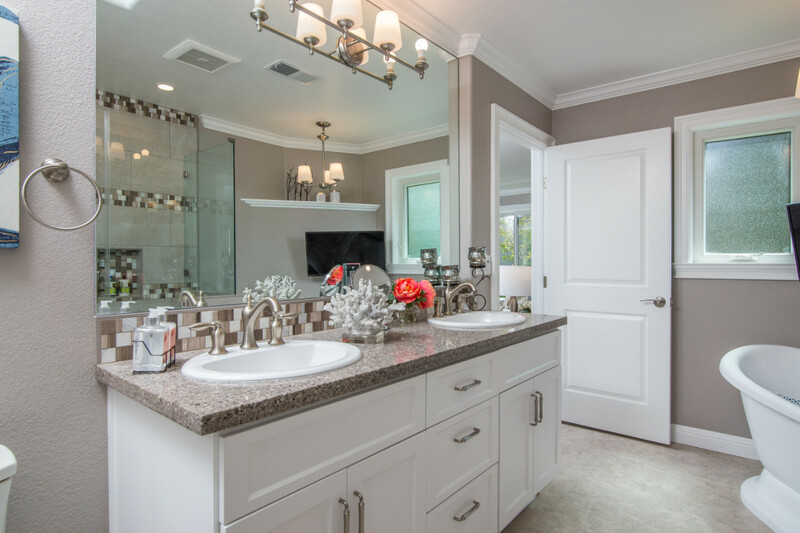 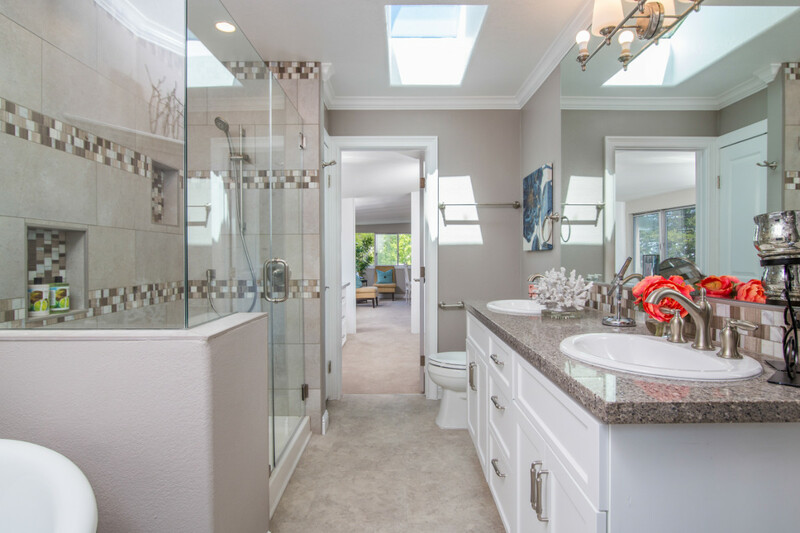 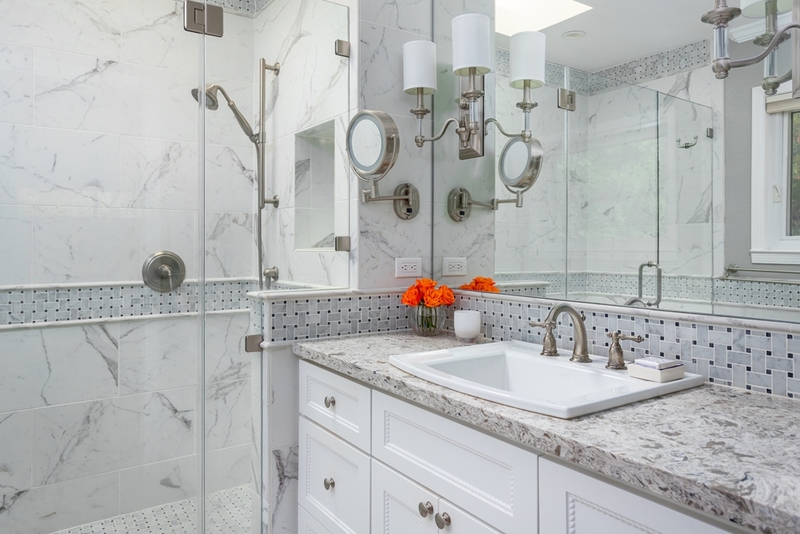 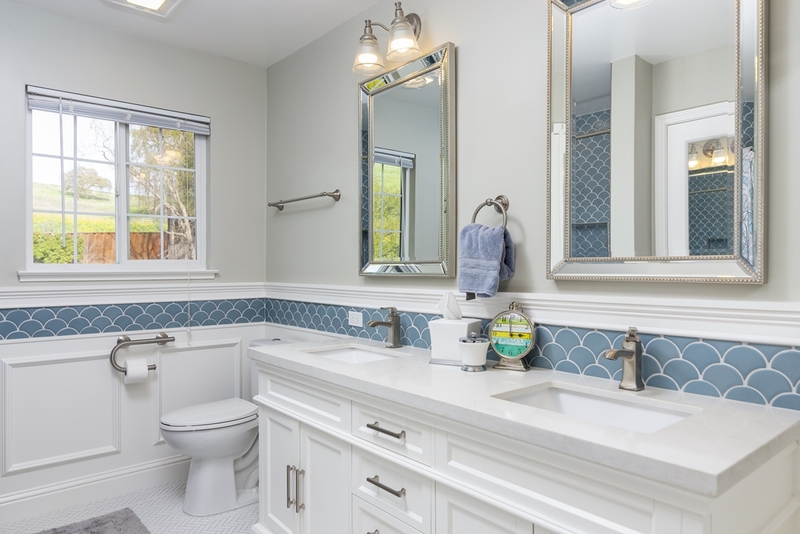 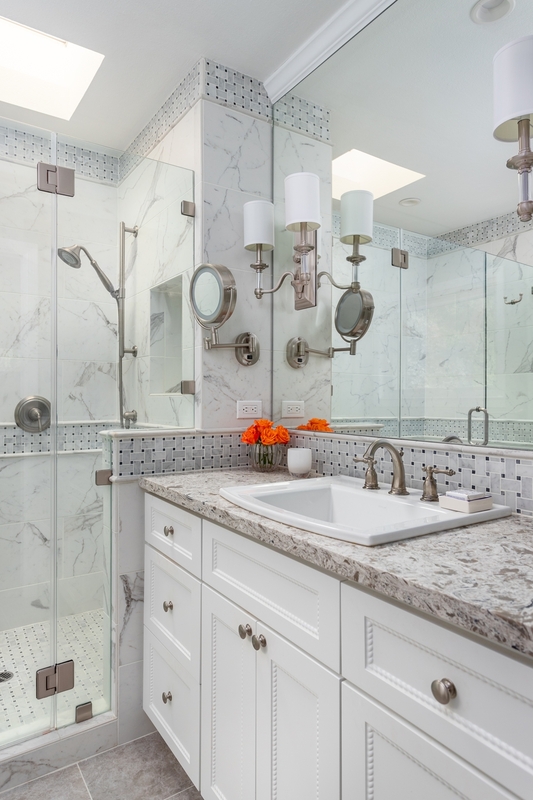 The master bathroom was completely reconfigured and improved, removing a wall that divided and shrunk the space, allowing for a free-standing soaking tub, separate shower and double vanity. 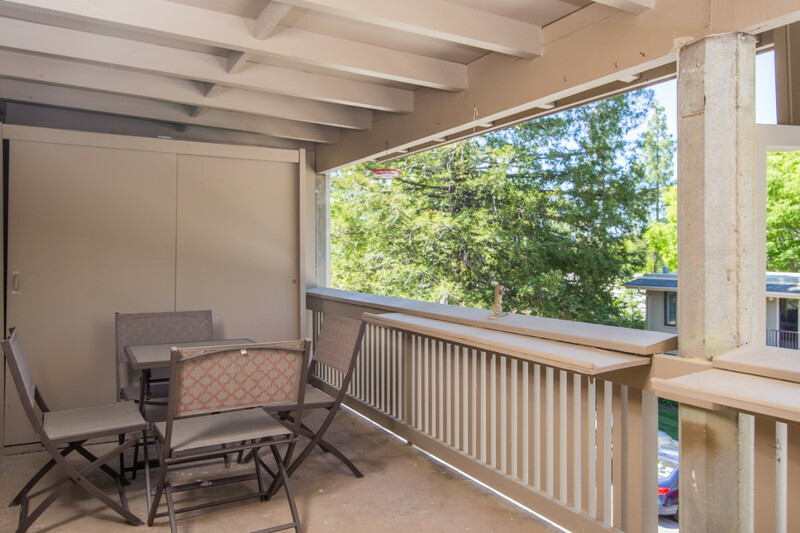 Part of the enclosed veranda was dedicated for a walk-in closet space. 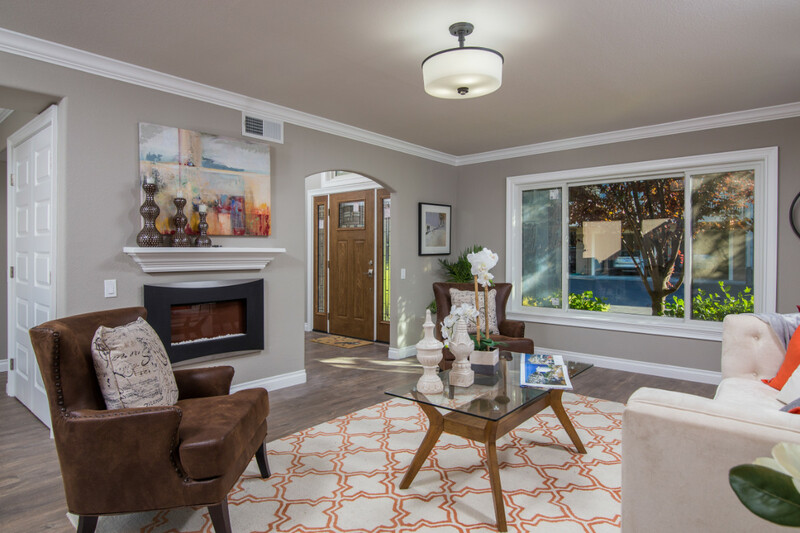 Soft warm, gray tones we used throughout, so while on trend with the gray movement, the warmth in the tones keeps things classic. 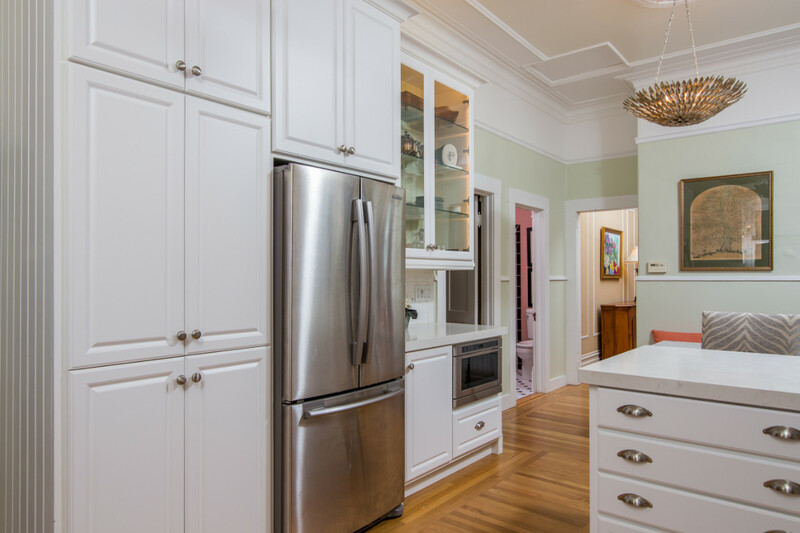 This Victorian home already had great bones with beautiful high ceilings but was dated and the kitchen was a mess. 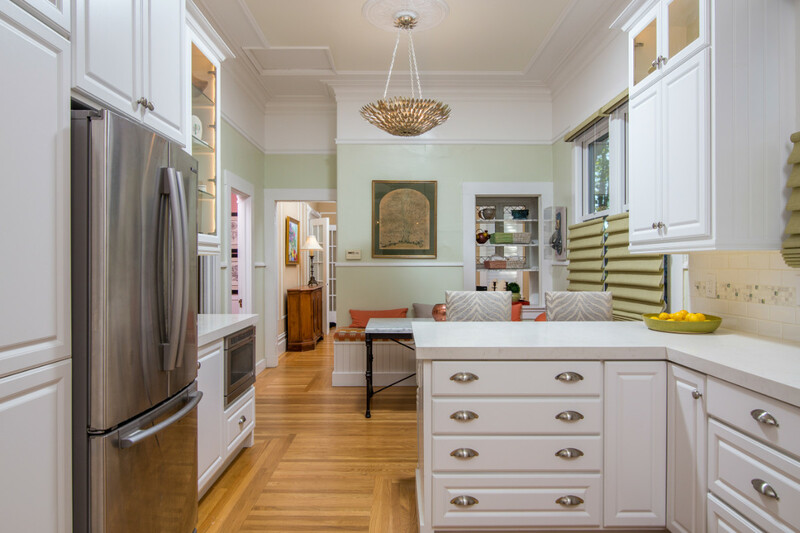 To highlight the ceiling we did a stacked molding design that extended down on the wall and out on the ceiling. 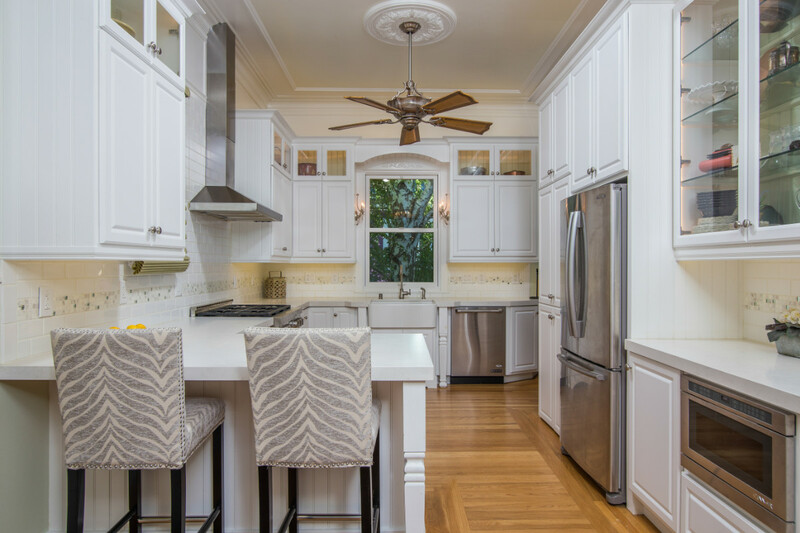 Additionally stacked cabinetry featuring lighted upper glass display cabinets was part of the design adding drama and height. 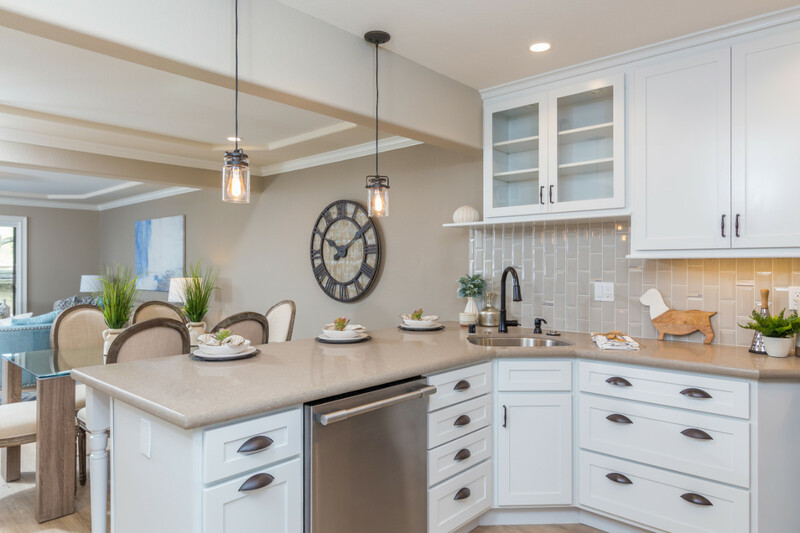 Other interesting lighting was featured in the space, including above and undercabinet LED tape lights, sconces in sides of the cabinets over the sink, and overhead decorative fixtures. 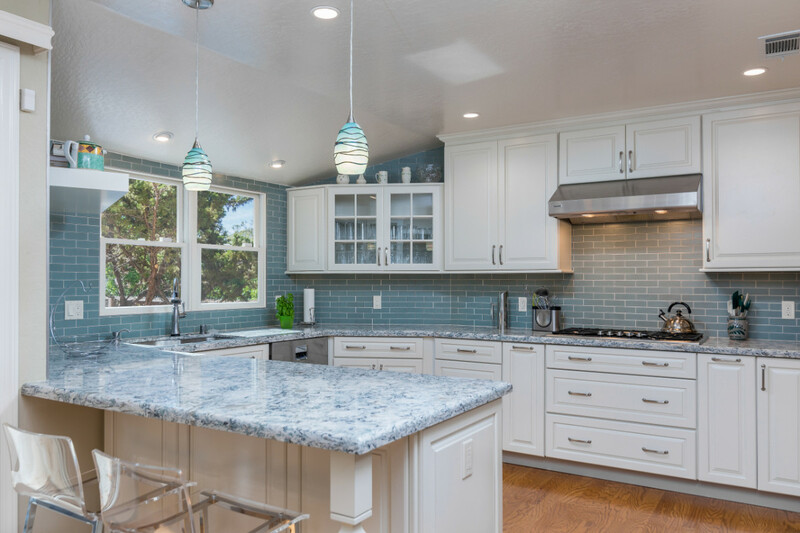 Quartz countertops, tile backsplash and custom hardwood flooring was also installed in the space. 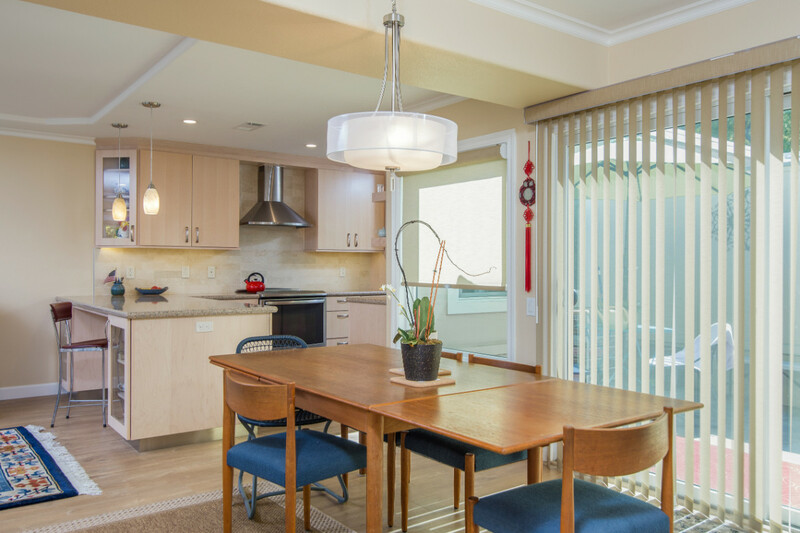 Re-engineering was required to make the kitchen a bit more open to the adjacent living spaces which was a high priority to the client. 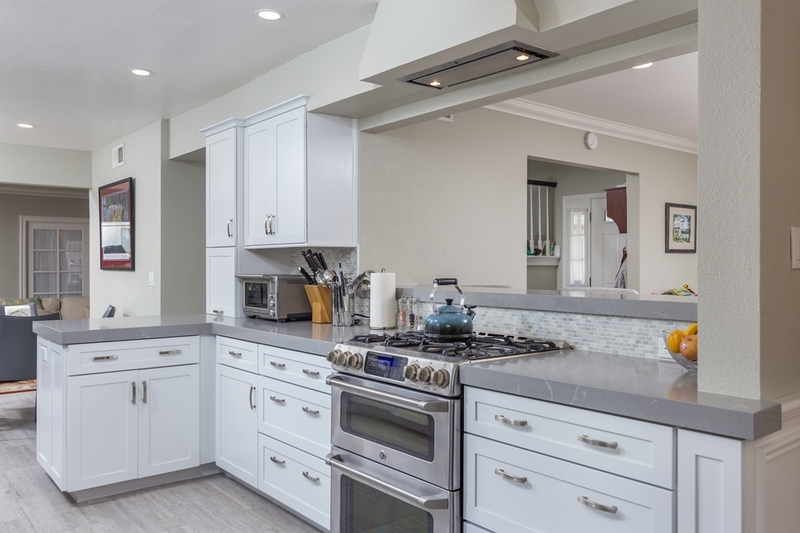 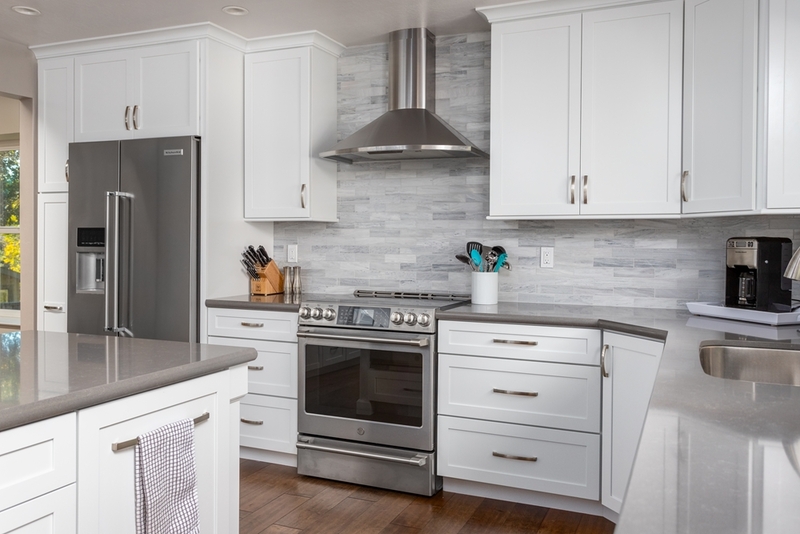 Additionally updating the overall look to be more contemporary with new stainless appliances, clean white shaker style cabinets, Gray quartz countertops, marble backsplash and porcelain tile flooring was accomplished. 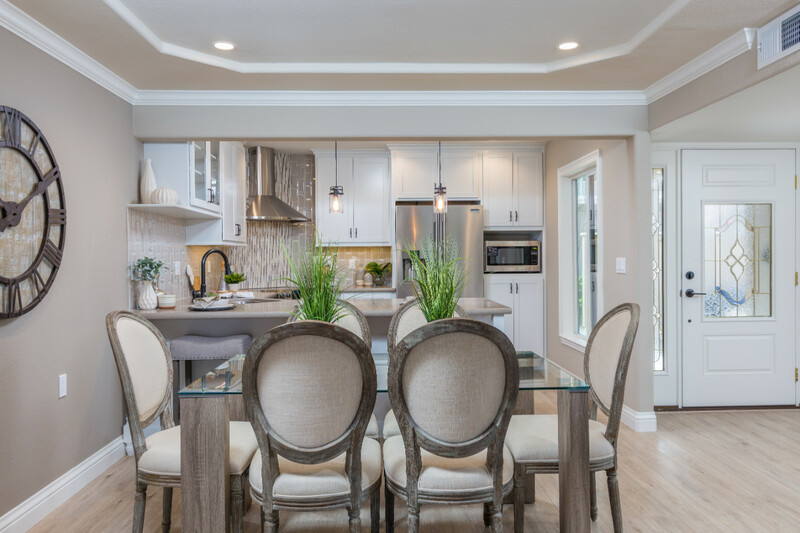 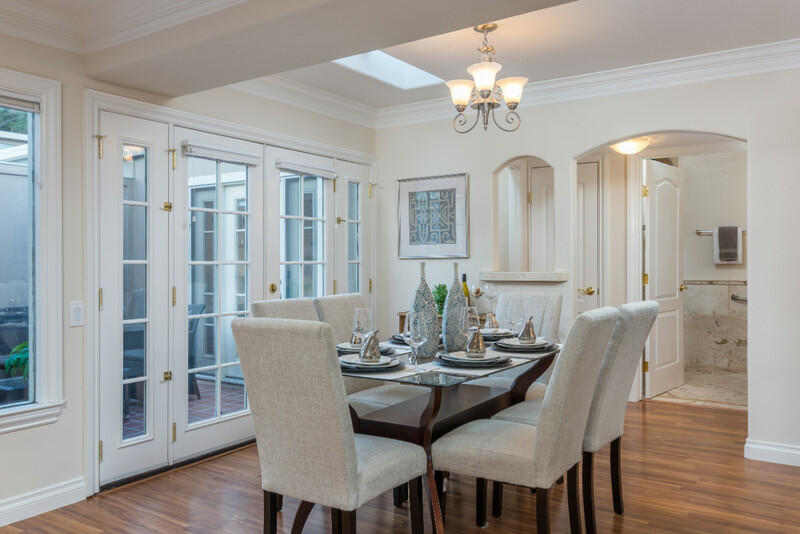 The layout and design of the space was vastly improved to make the kitchen more functional and additional storage was added in the nook side of the kitchen still maintaining a casual dining area. 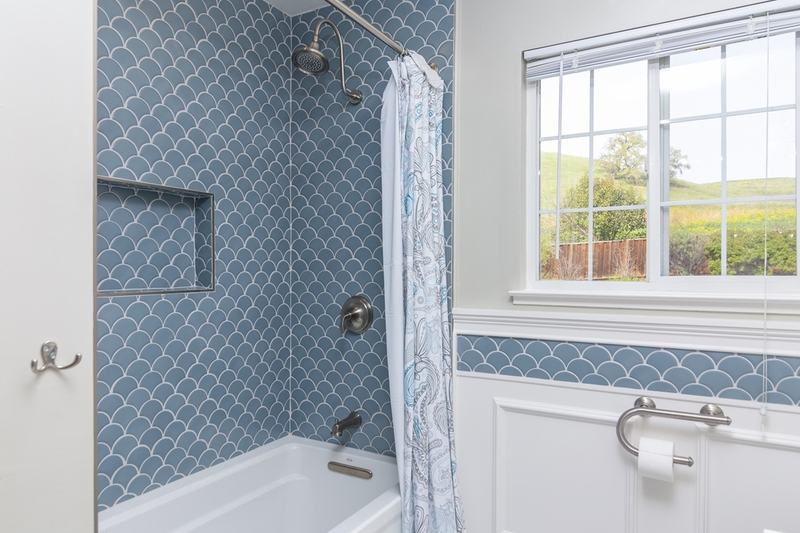 In the upstairs kids bath we modernized and beautified the space, making small adjustments to also accommodate a stackable washer/dryer in the adjacent closet space. The bathroom has the special touch of wainscotting around the perimeter with inset tiles carried over from the tub/shower surround. 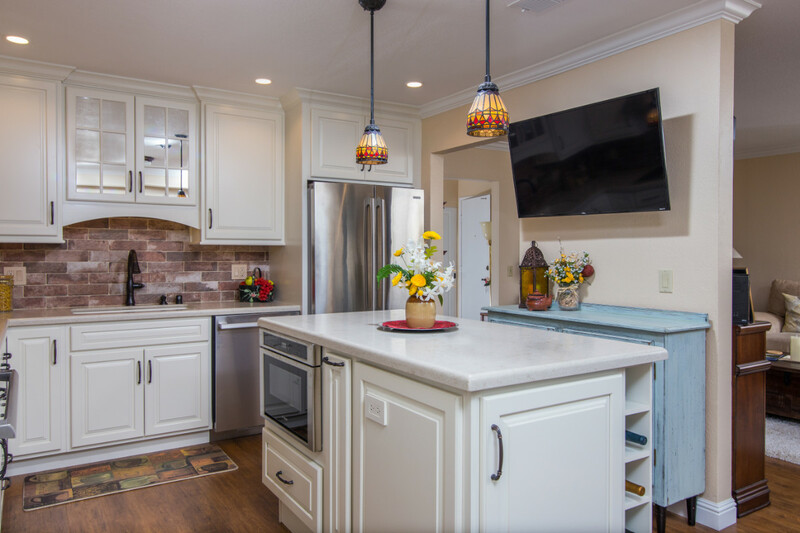 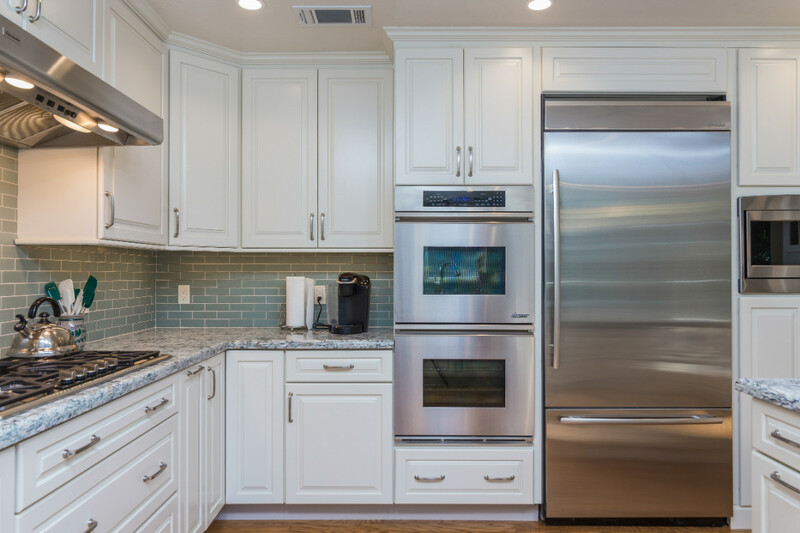 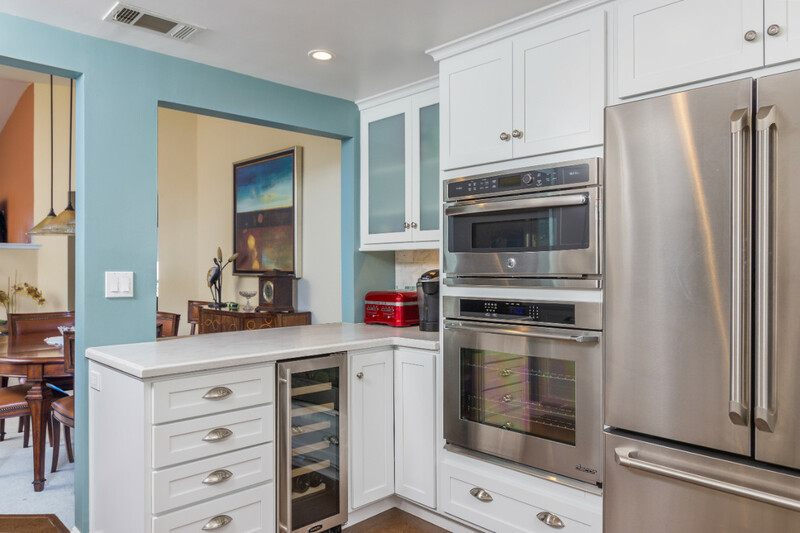 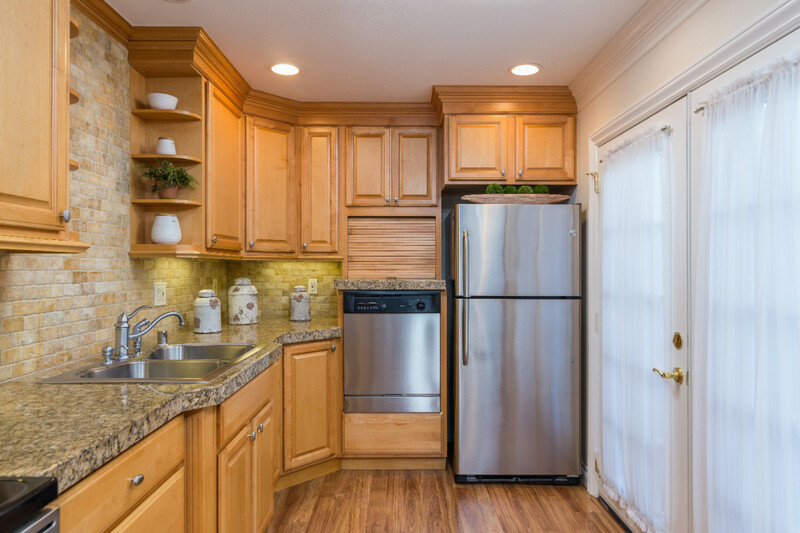 Many remodels were done to this unit over the years starting with the kitchen nearly a decade before the final remodeling was completed. 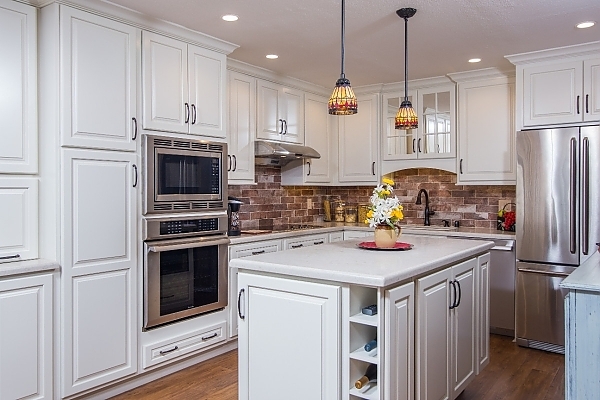 The kitchen cabinets features a cream cabinet finish with a dark brown glaze/antiquing affect. 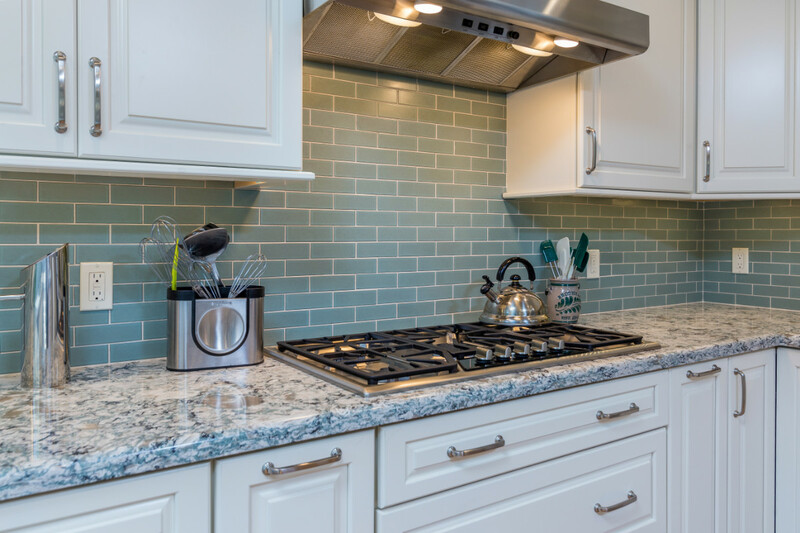 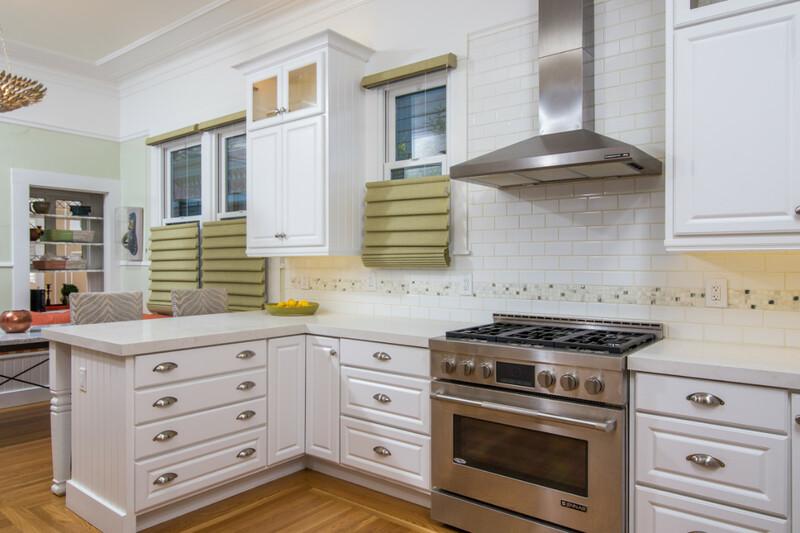 Corian countertops and tiled backsplash were also used in this space. 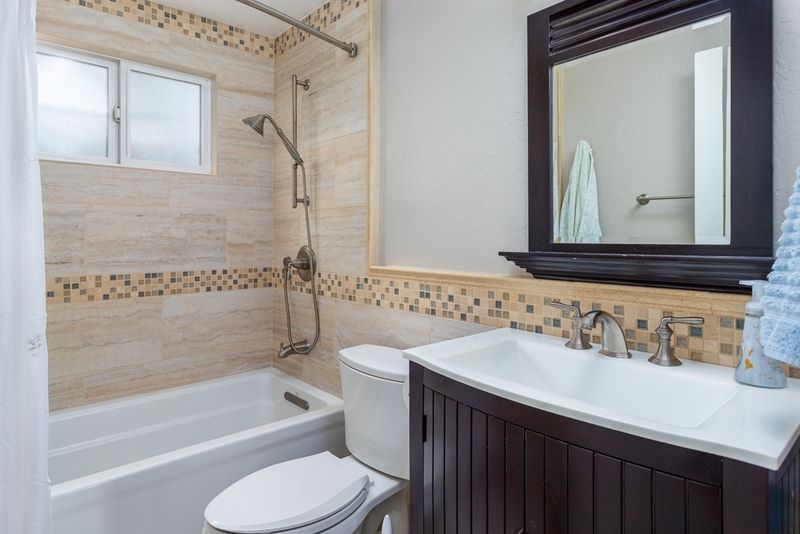 Later hardwood flooring, new paneled interior doors and an electric fireplace with TV above were added along with a partial remodel to the bathroom space. 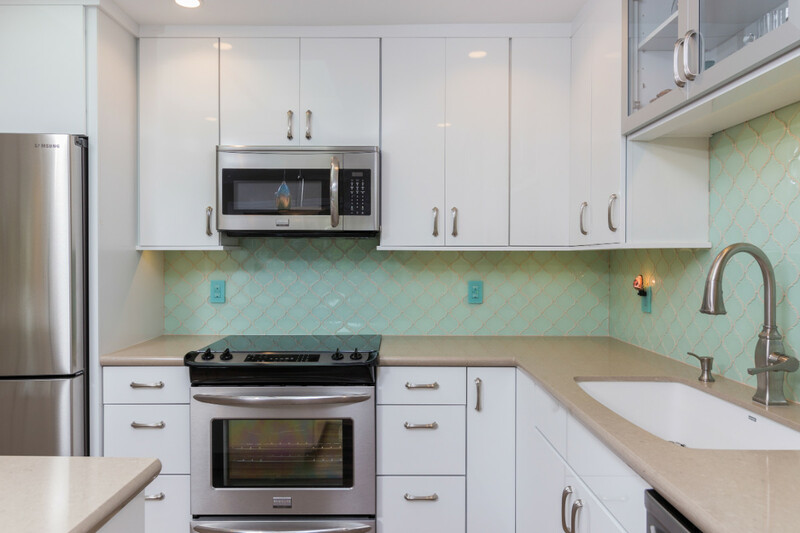 The cabinets are original, though freshly painted, but everything else in the space was replaced. 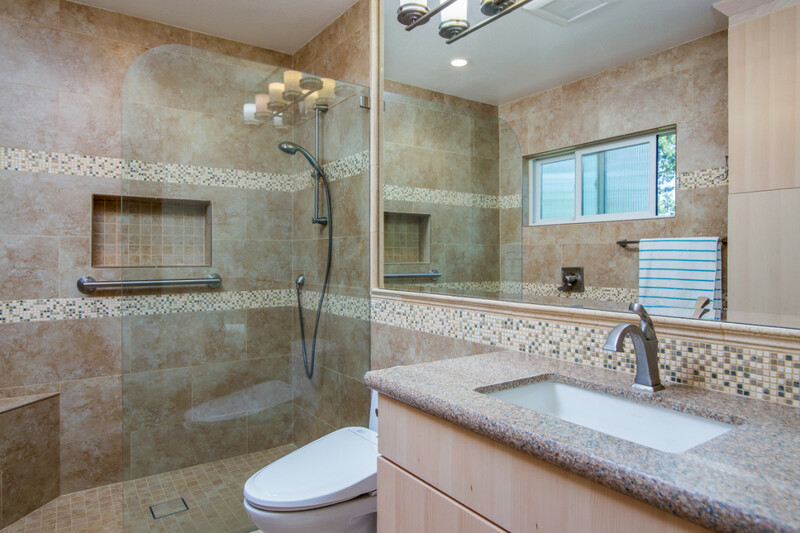 The tub was removed and a classy, all tile shower pan and surround were installed with new fixtures. 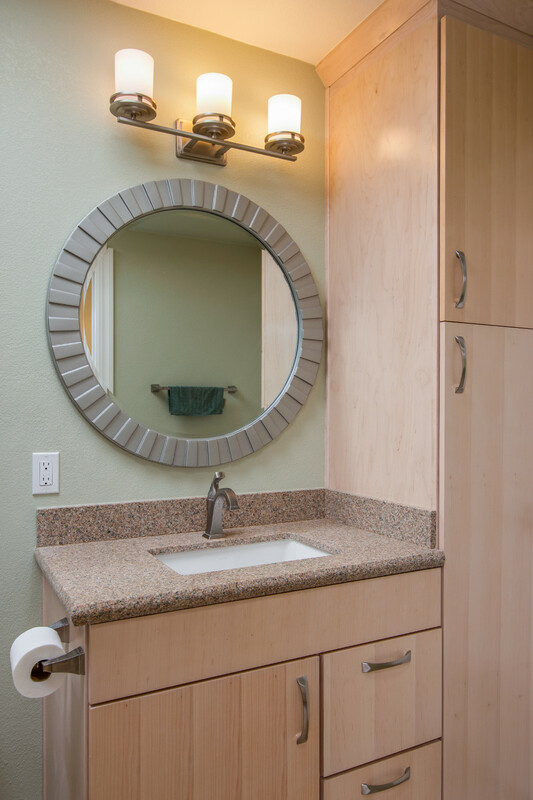 A new granite countertop, mirror, lighting and accessories finished off the space. 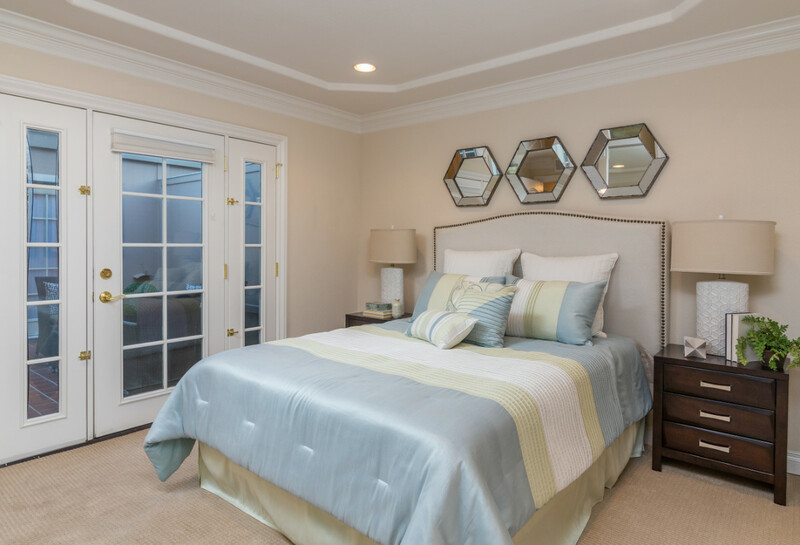 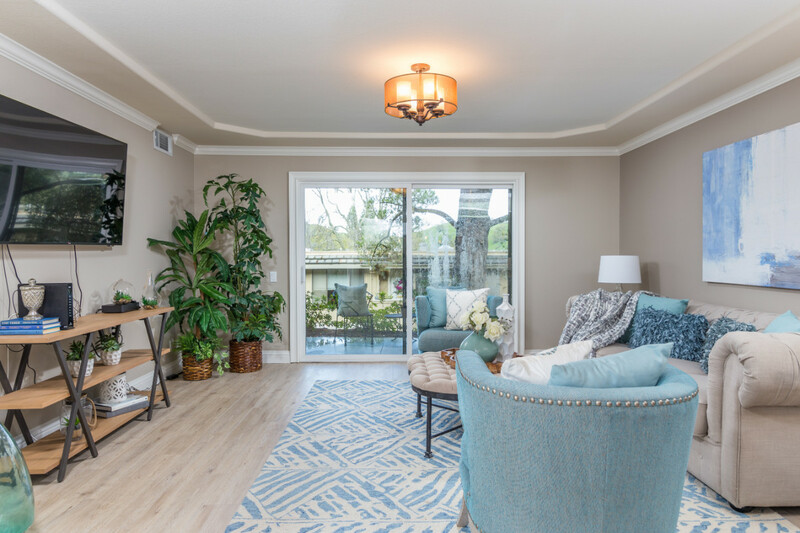 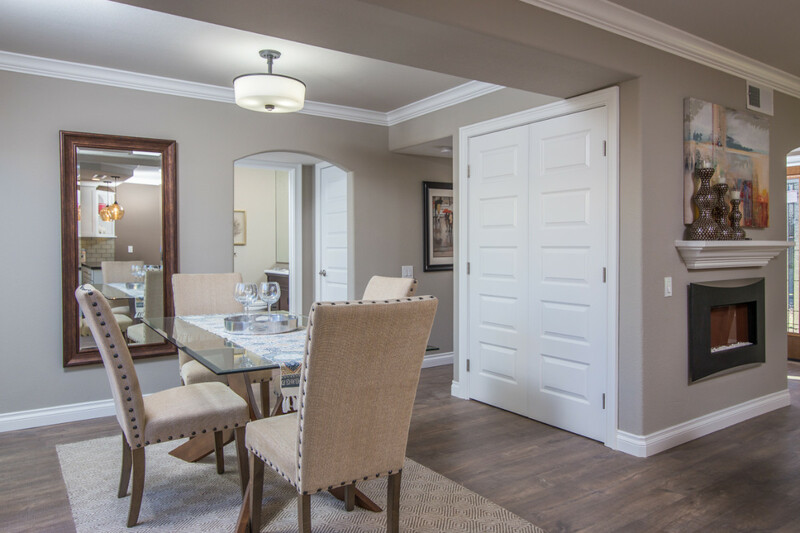 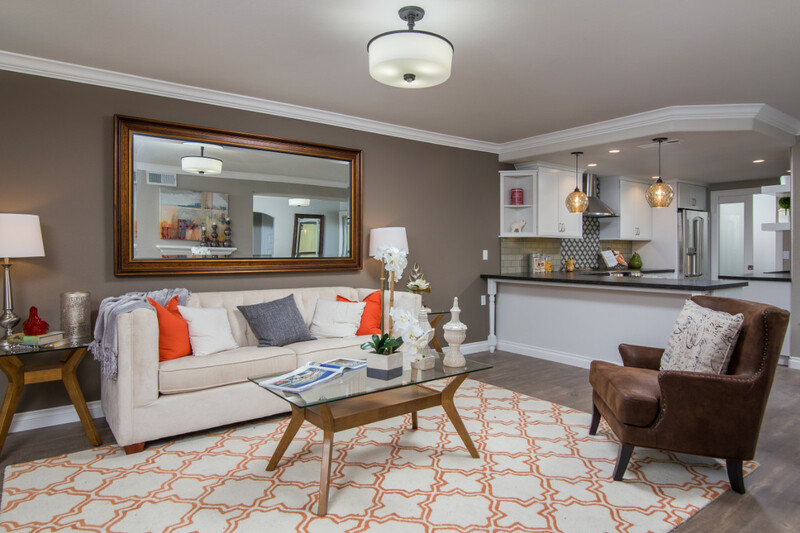 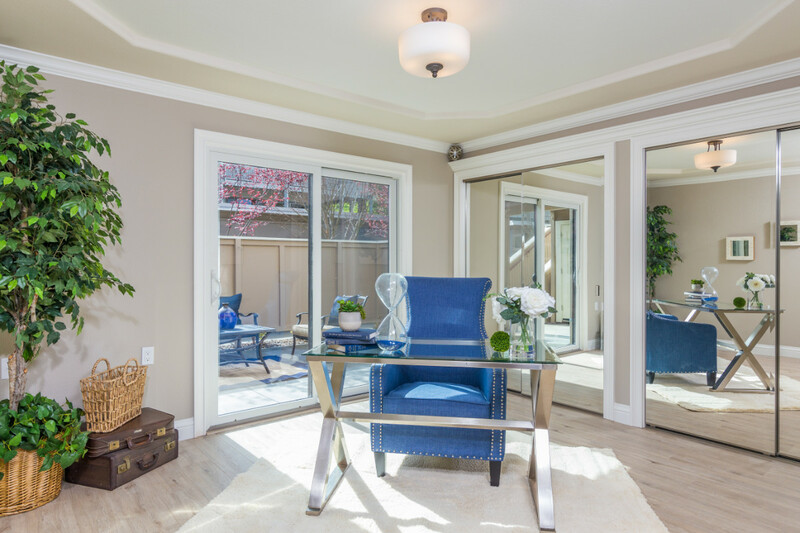 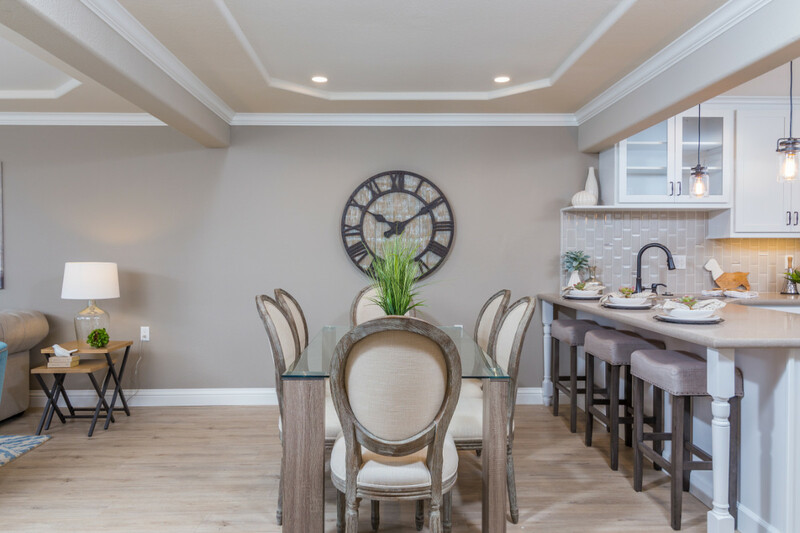 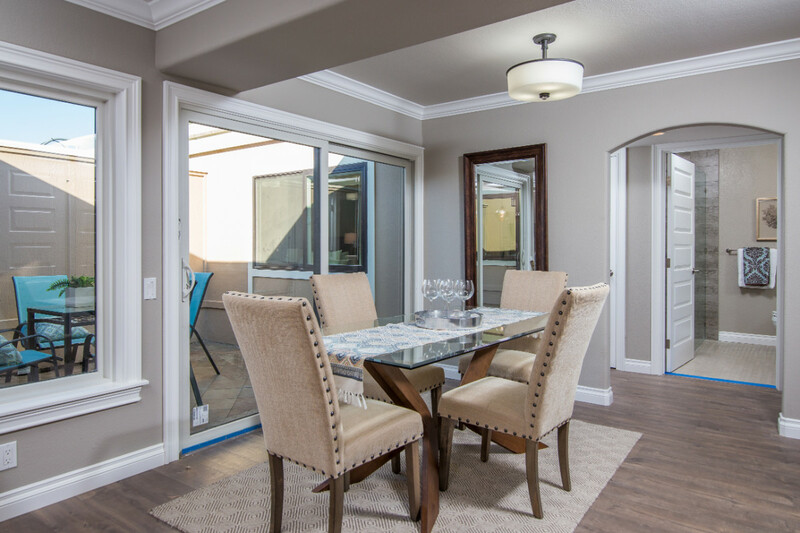 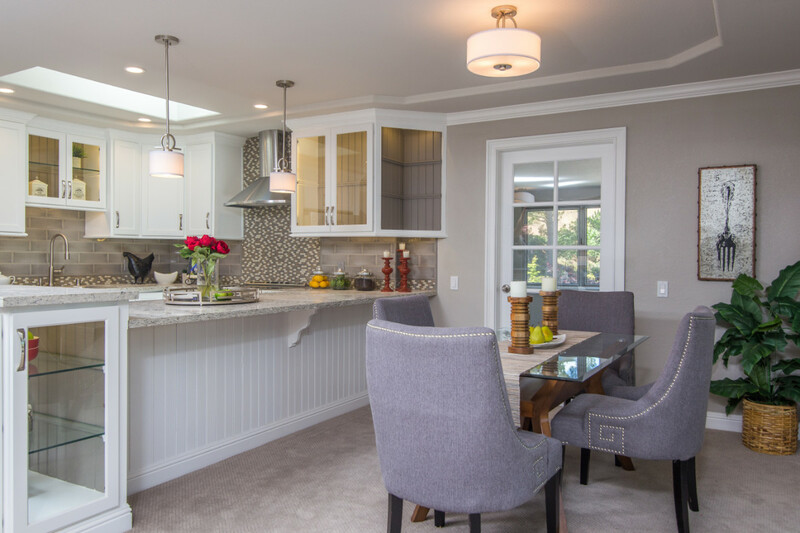 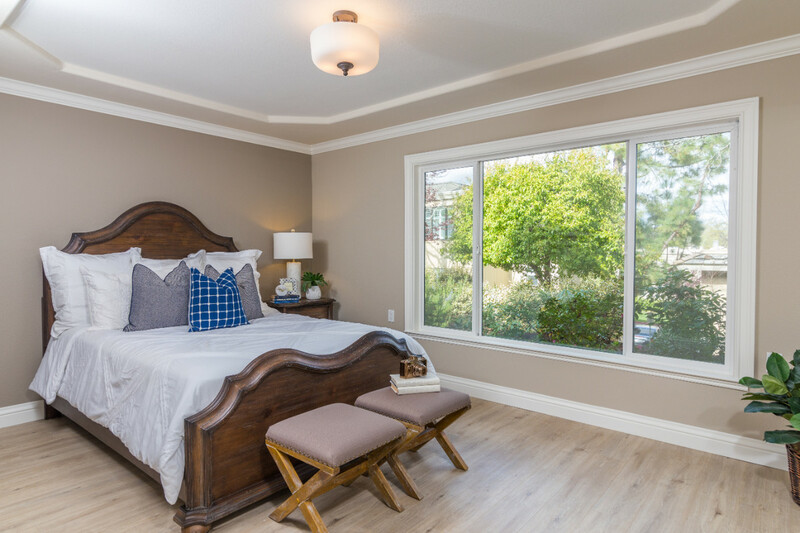 Although we wanted a modern sleek look, we also wanted the newly remodeled spaces in this home to have some soft touches too. 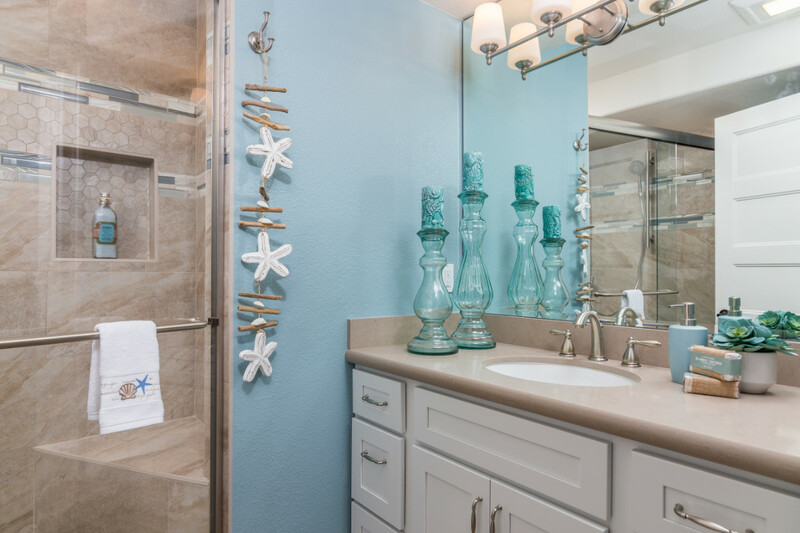 We went for a sort of beachy feel with our color tones. 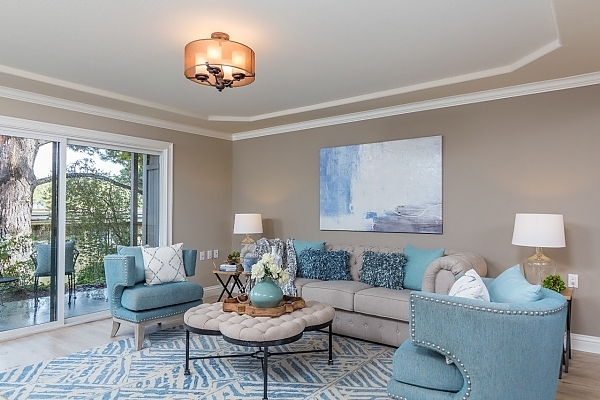 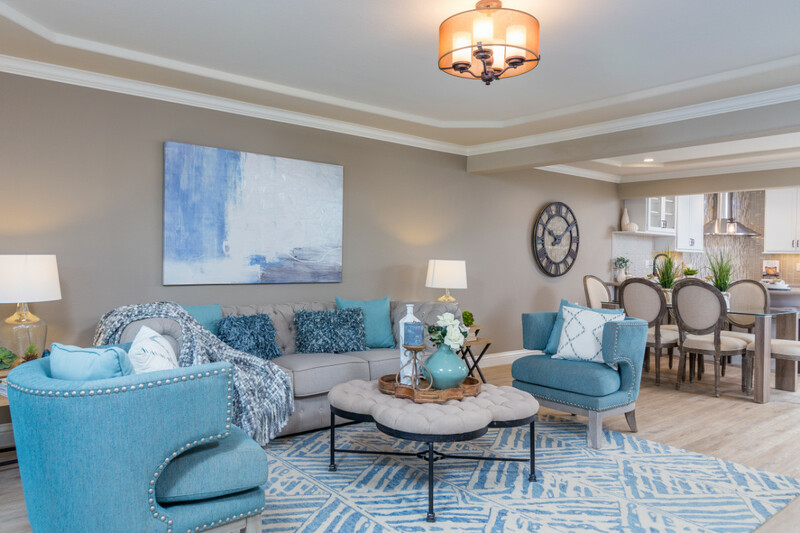 Sandy tones along with touches of aqua and blue-green are featured here and there throughout the home. 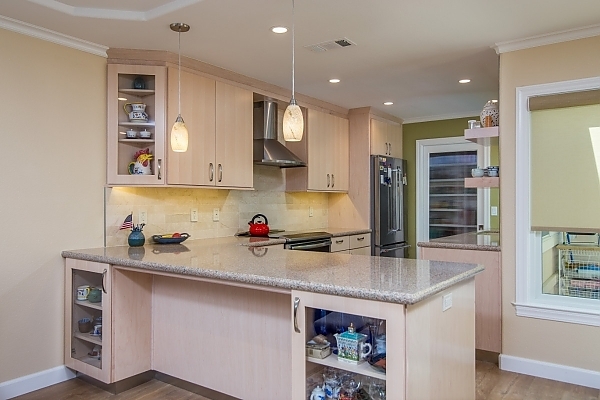 The cabinets are a high gloss modern slab style. 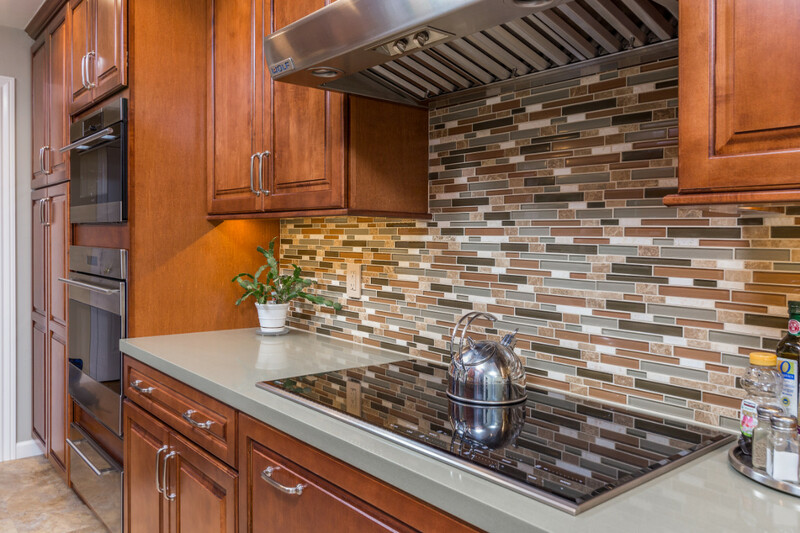 Countertops a simple solid colored quartz with a fun glass mosaic tile backsplash with sandy grout to tie it in. 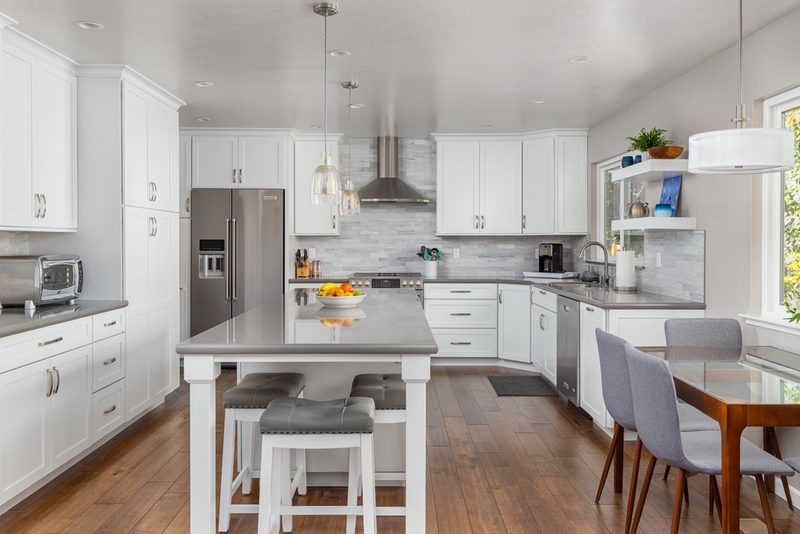 Slightly rustic looking LVT (luxury vinyl tile) flooring was also used, bringing in some contrast to the stark cabinetry. 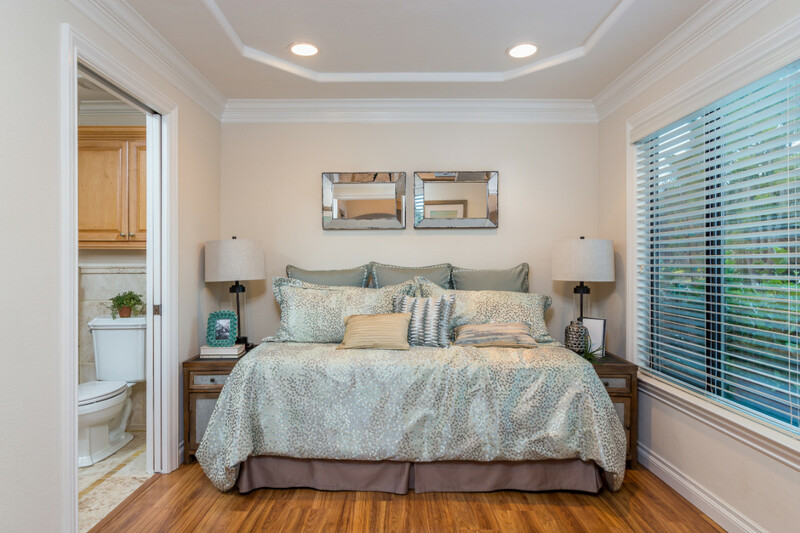 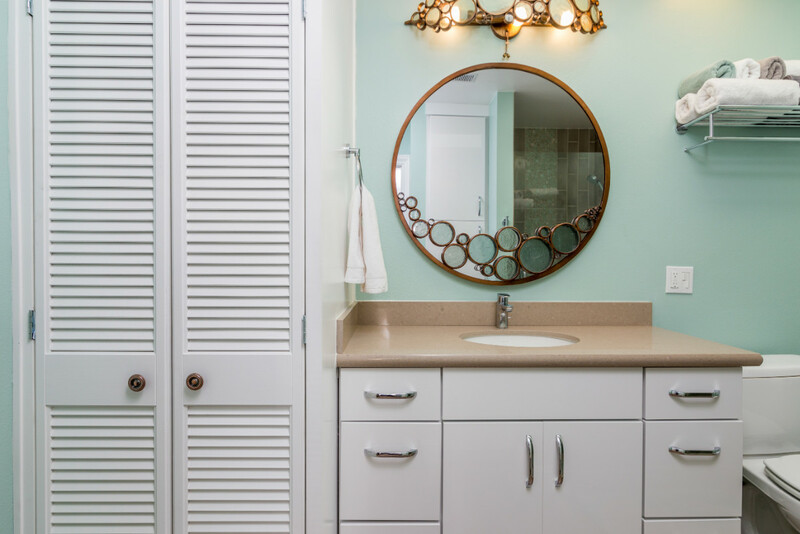 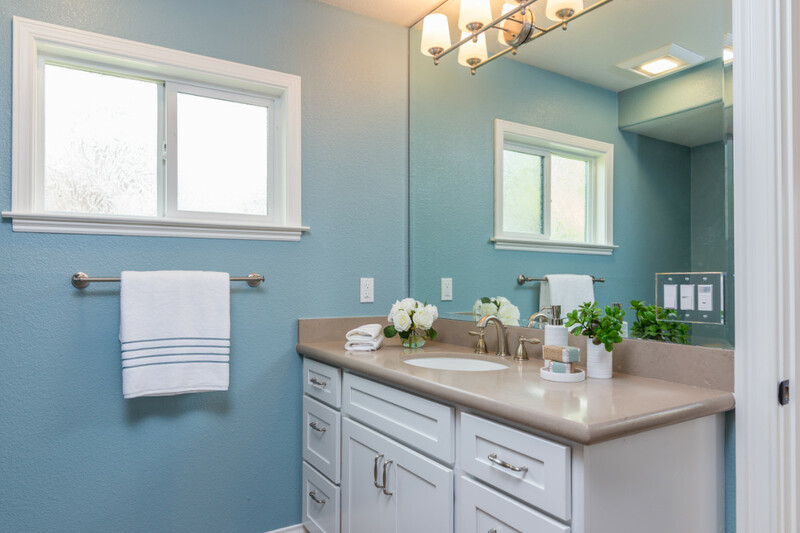 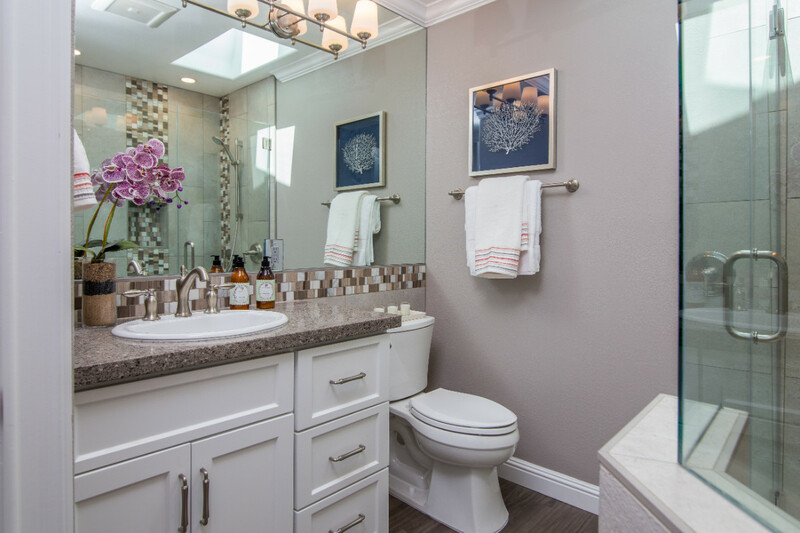 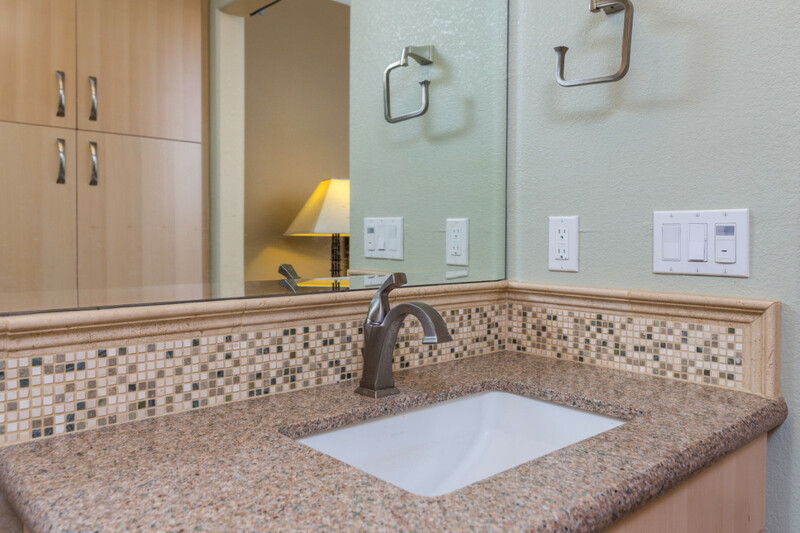 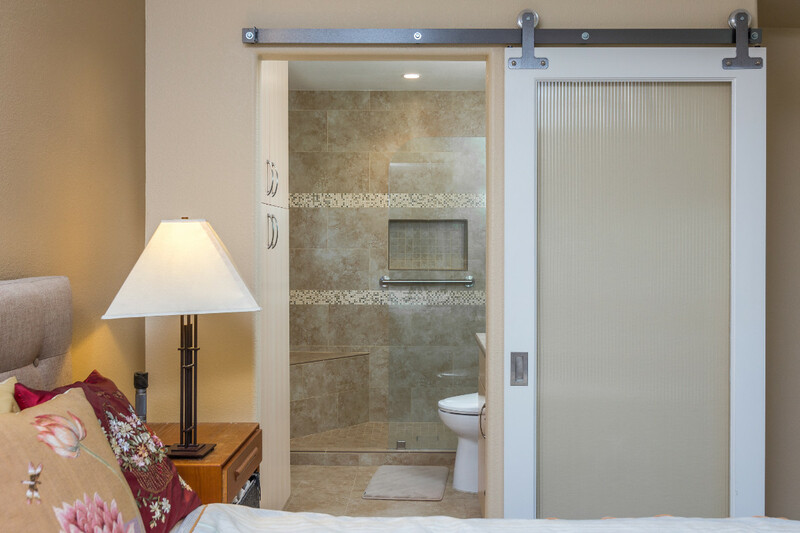 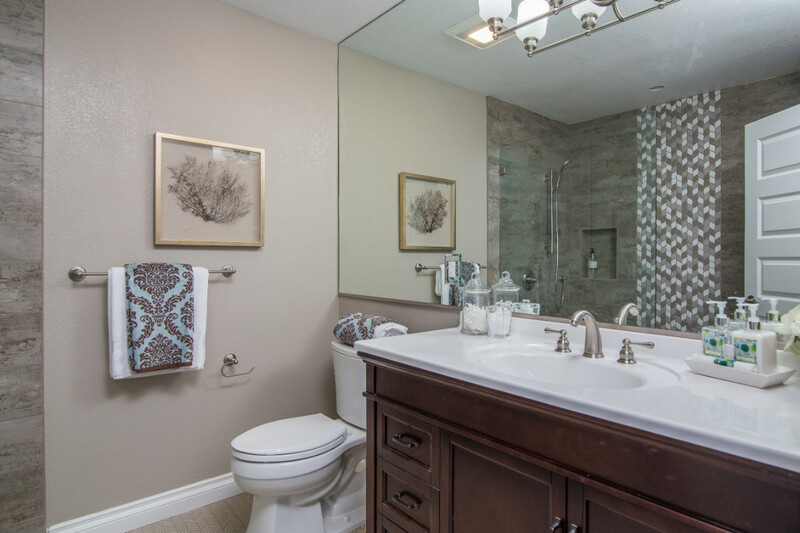 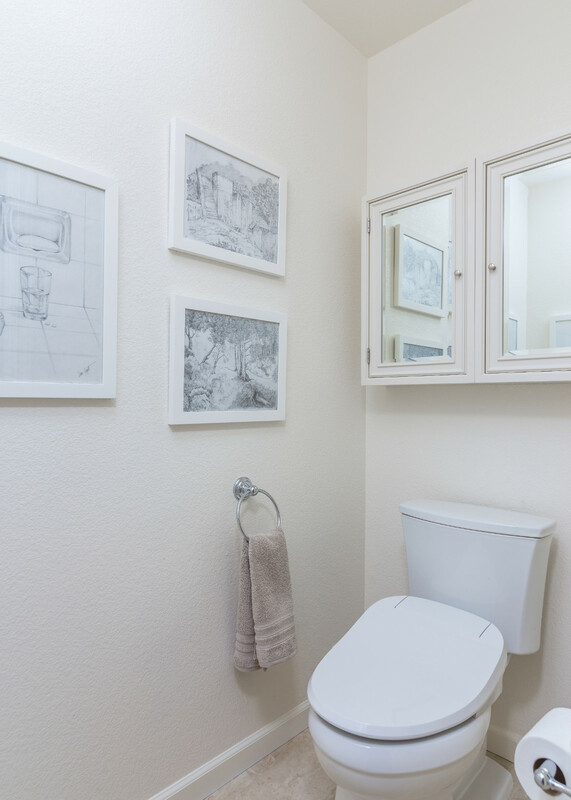 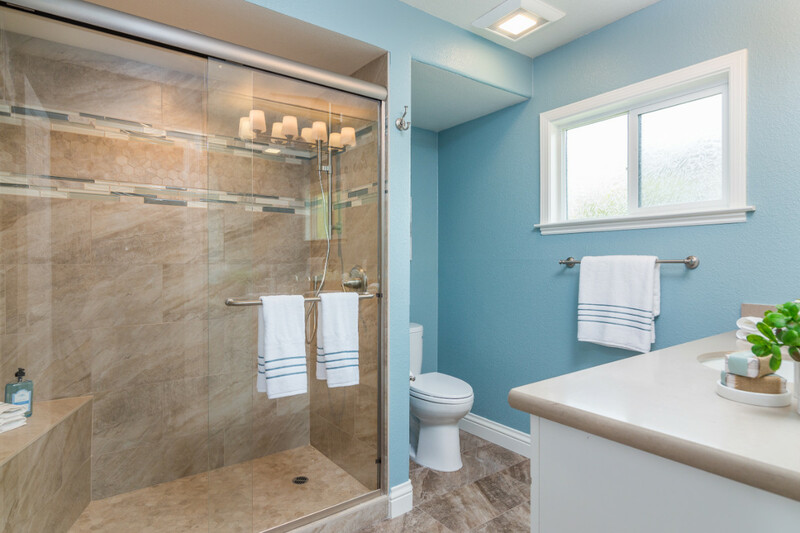 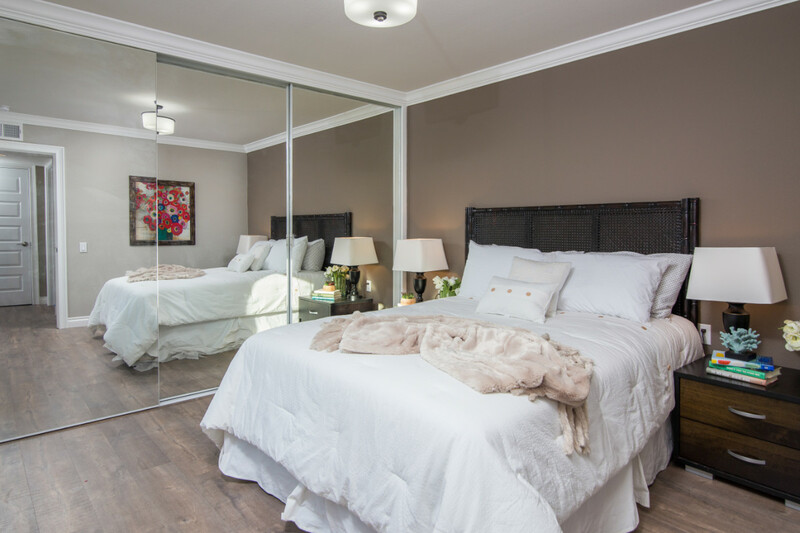 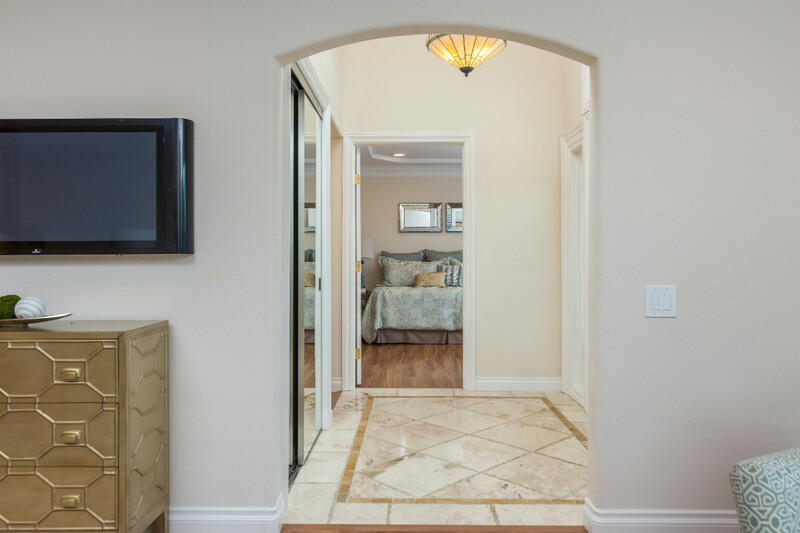 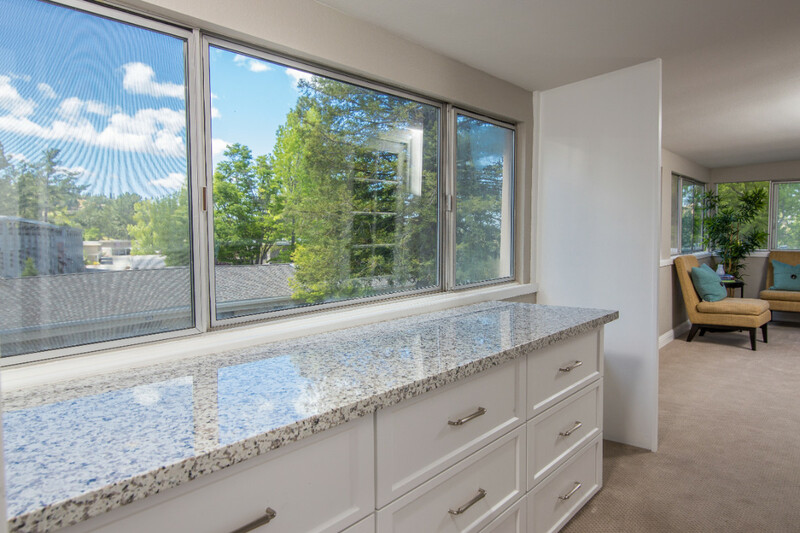 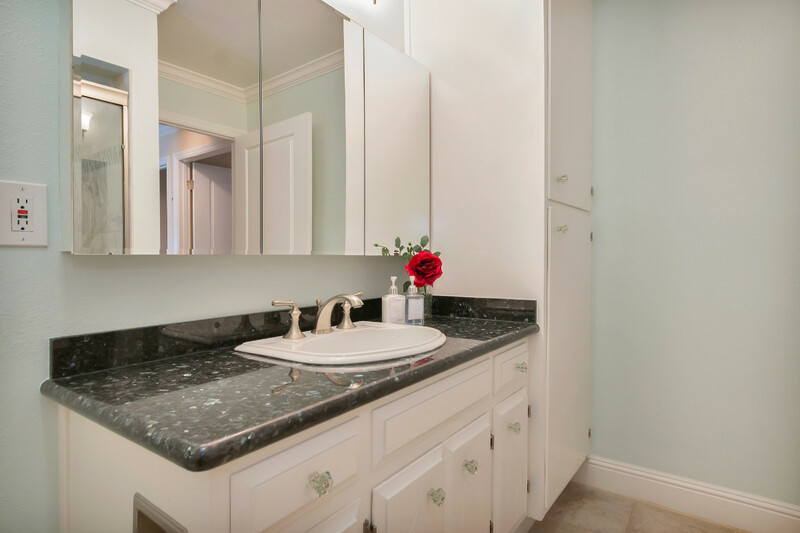 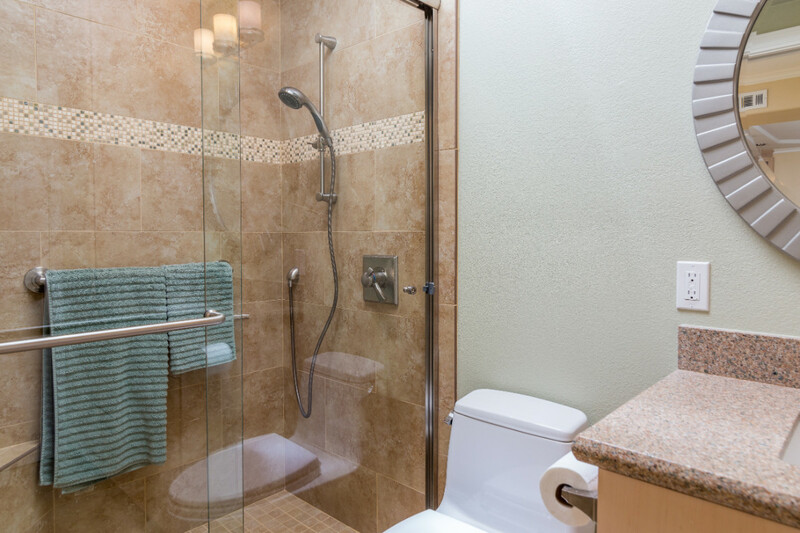 This project involved a complete home renovation and redesign to turn a one bathroom unit into a two bathroom unit with an added laundry closet. 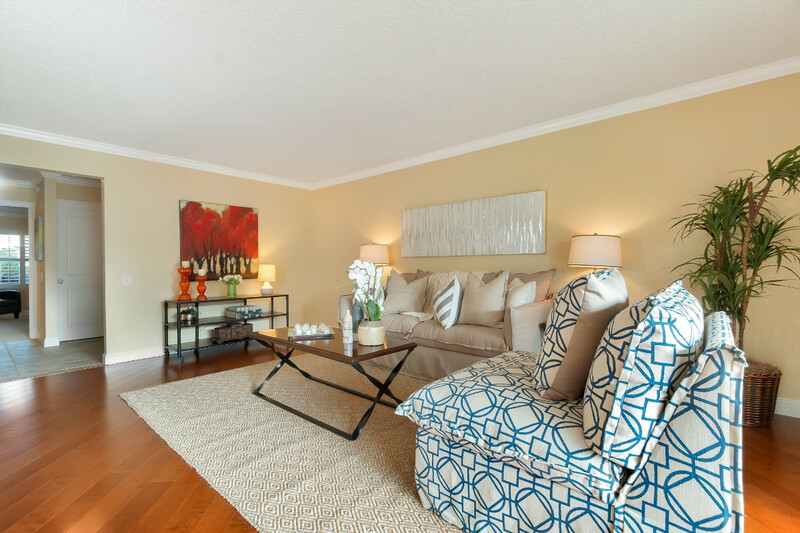 The client liked very contemporary simple lines. 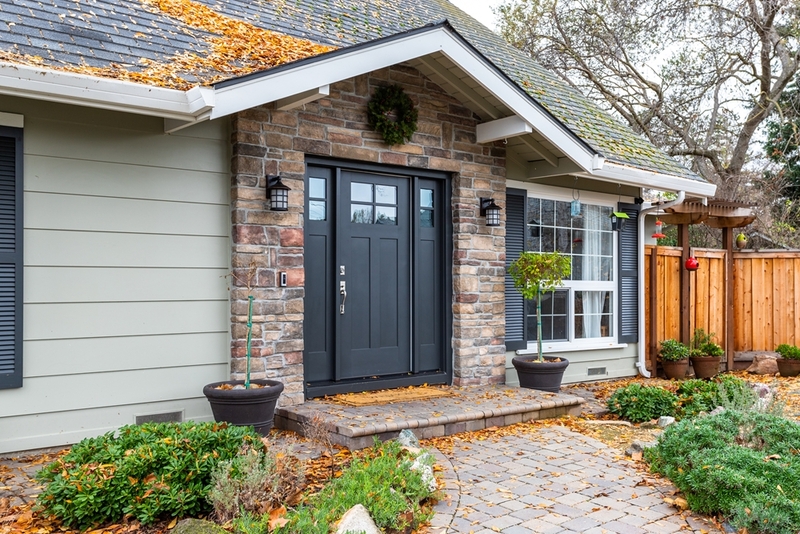 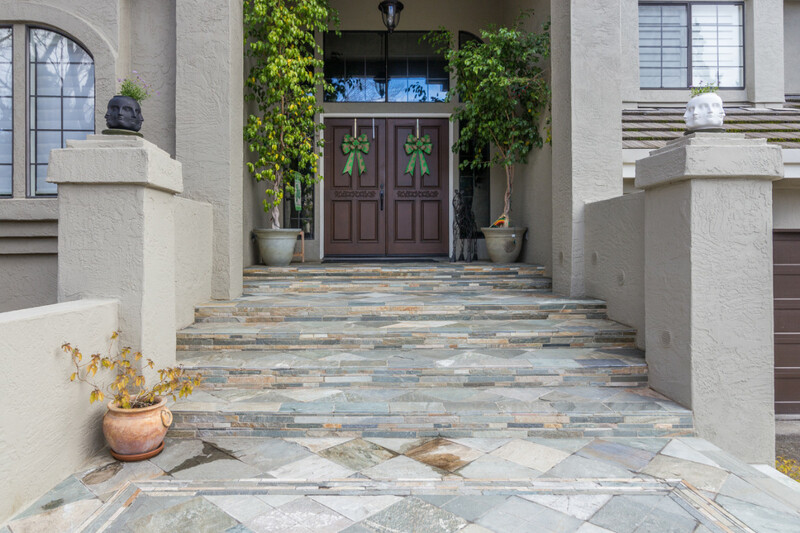 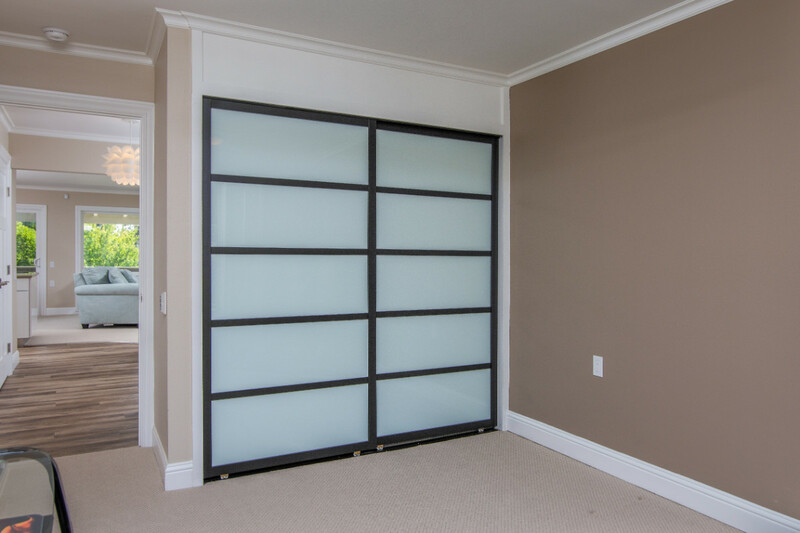 What can be a stark look with slab/flat contemporary doors was warmed up and softened with the color tones used. 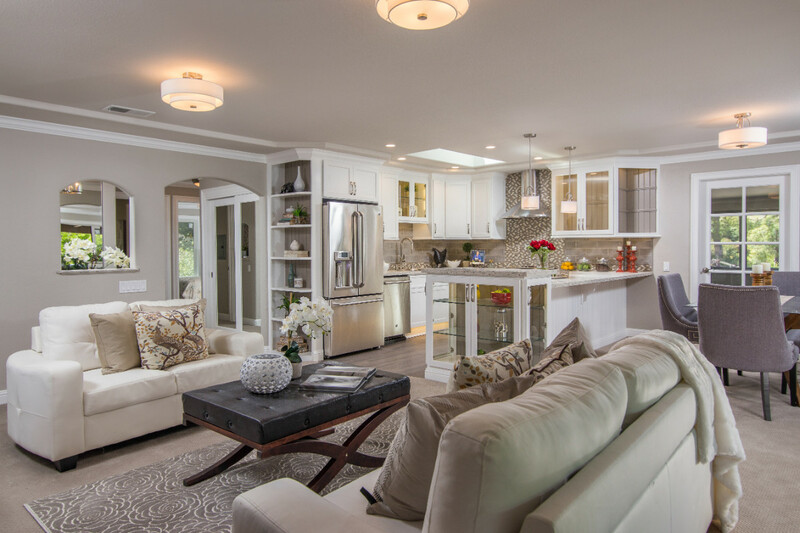 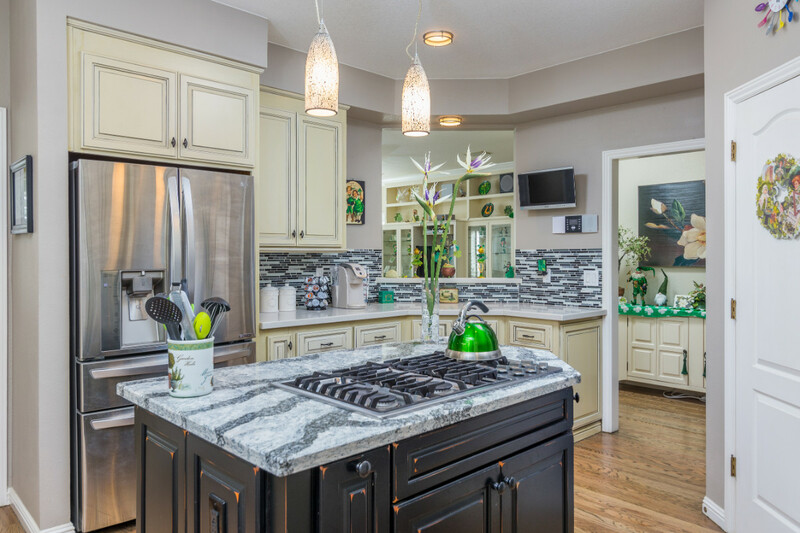 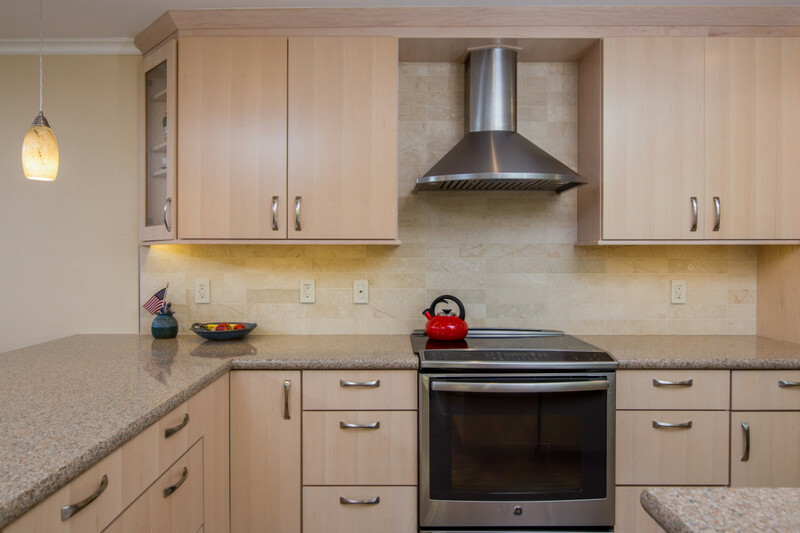 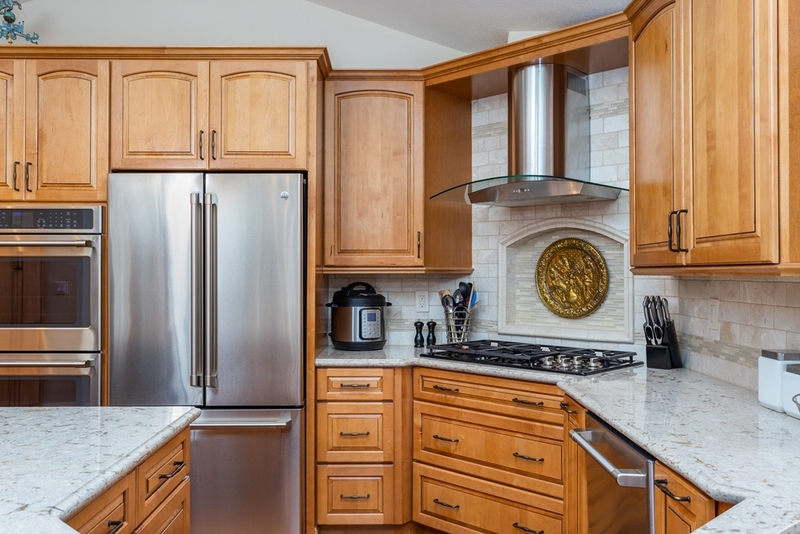 Natural maple cabinetry, with other beige gold and green tones is featured throughout the different spaces. 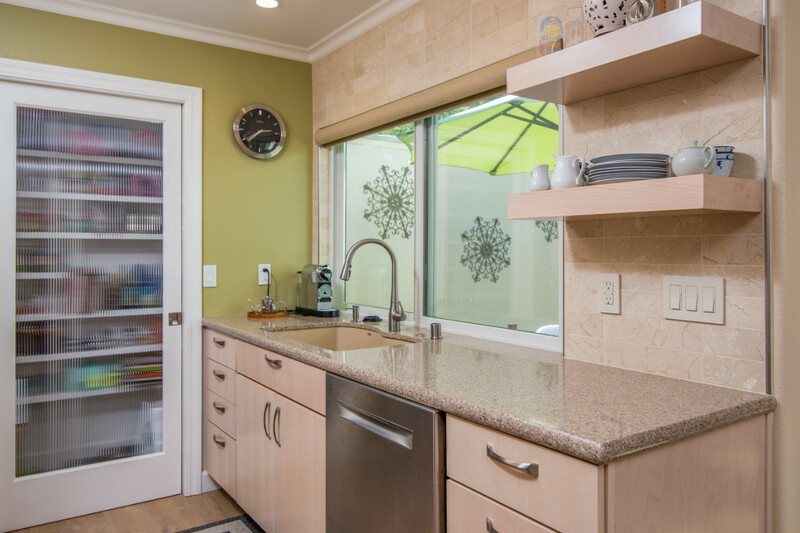 The kitchen has a new large walk-in pantry with reed glass door. 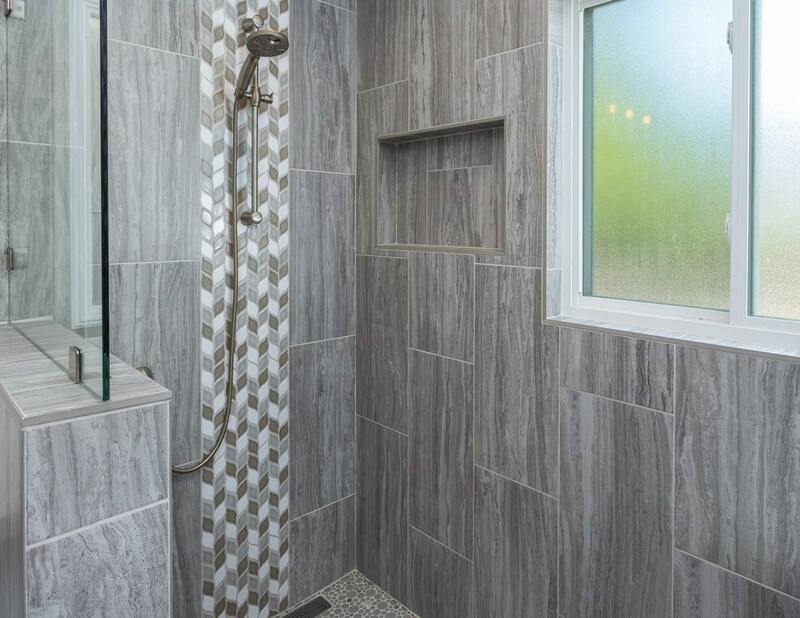 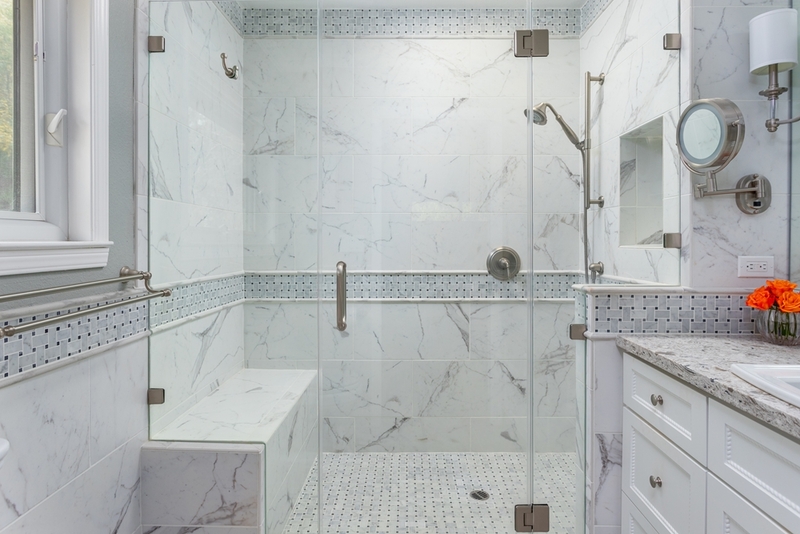 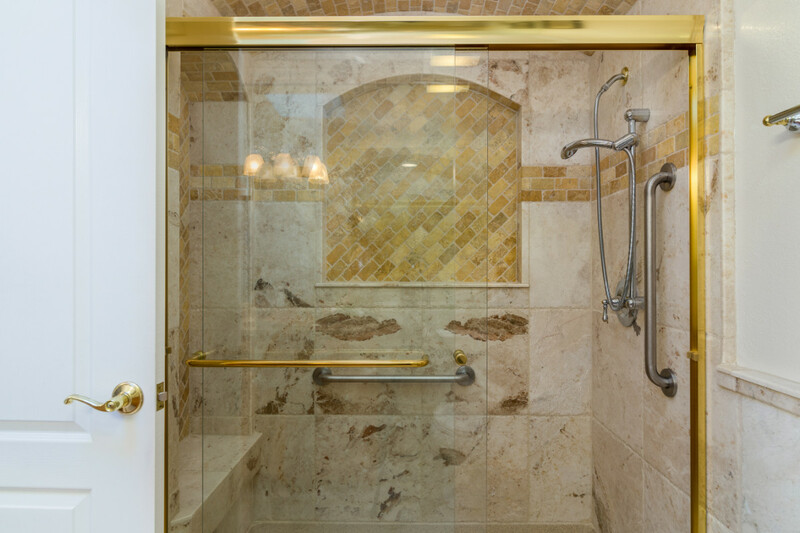 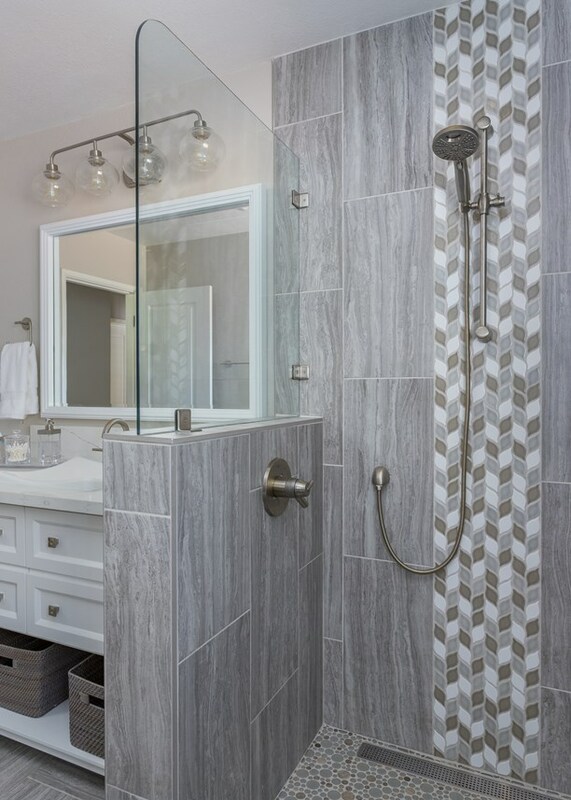 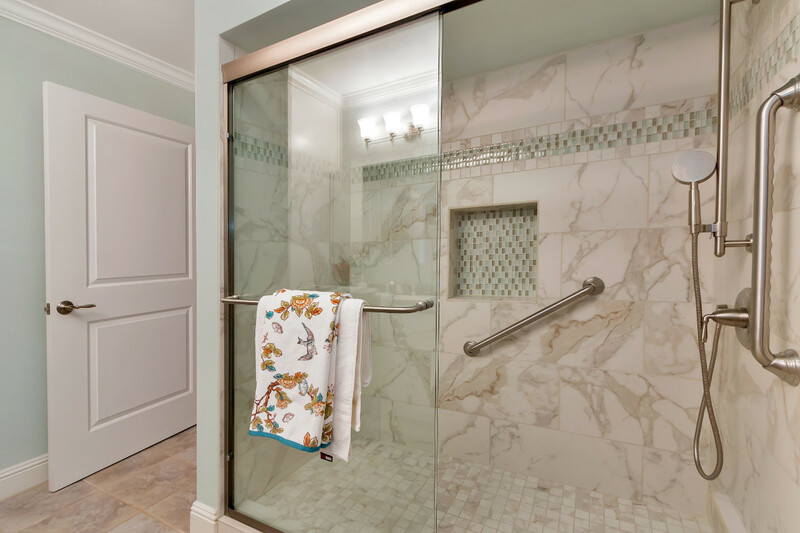 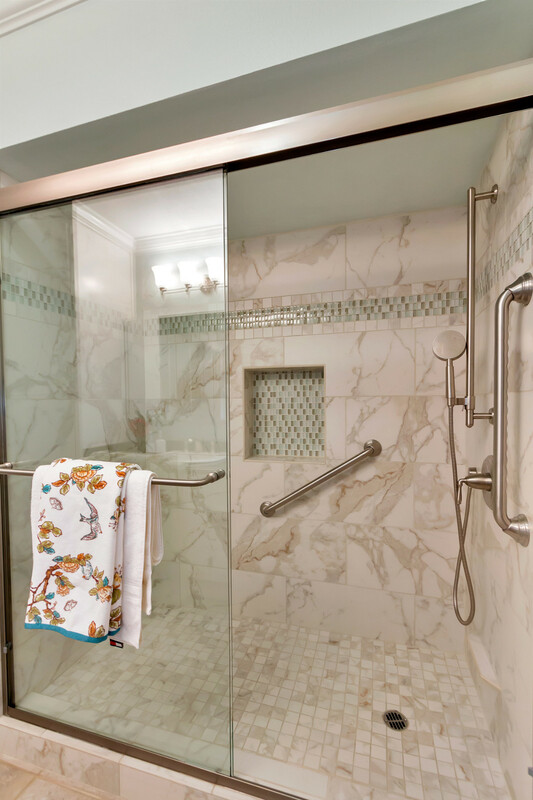 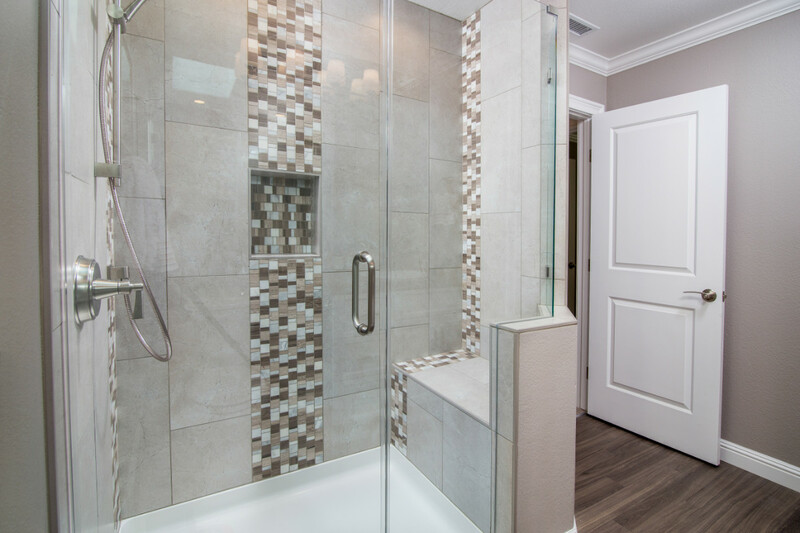 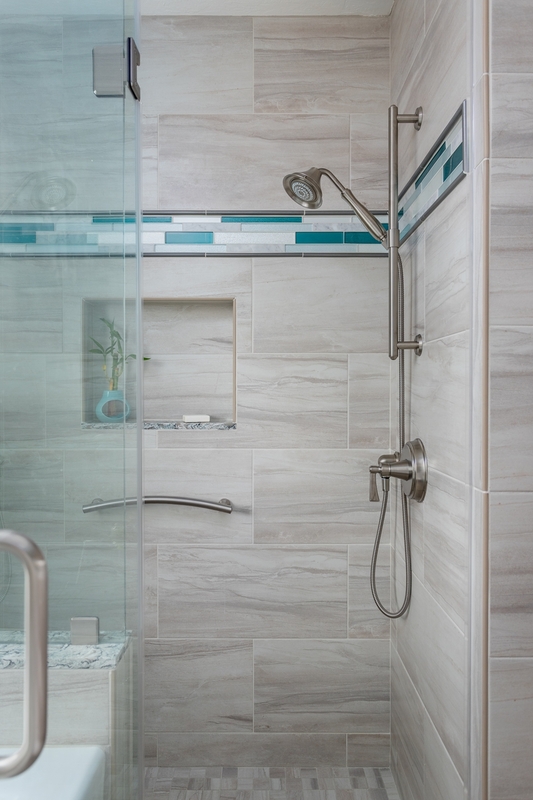 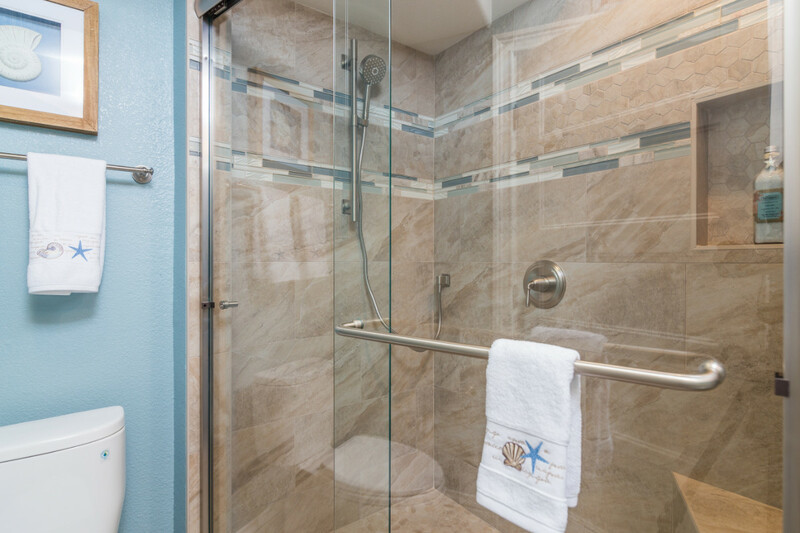 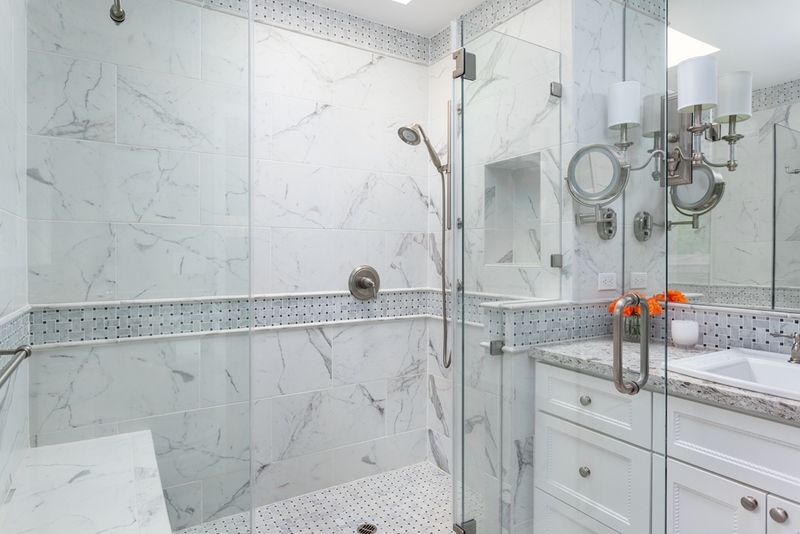 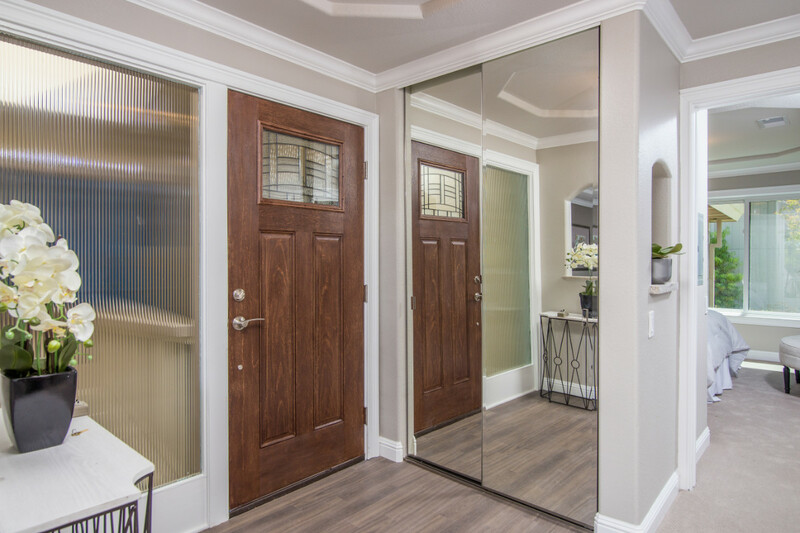 A reed glass barn door was also used at the new master bathroom entrance which features a large walk-in shower with no door, just a sleek glass shower screen. 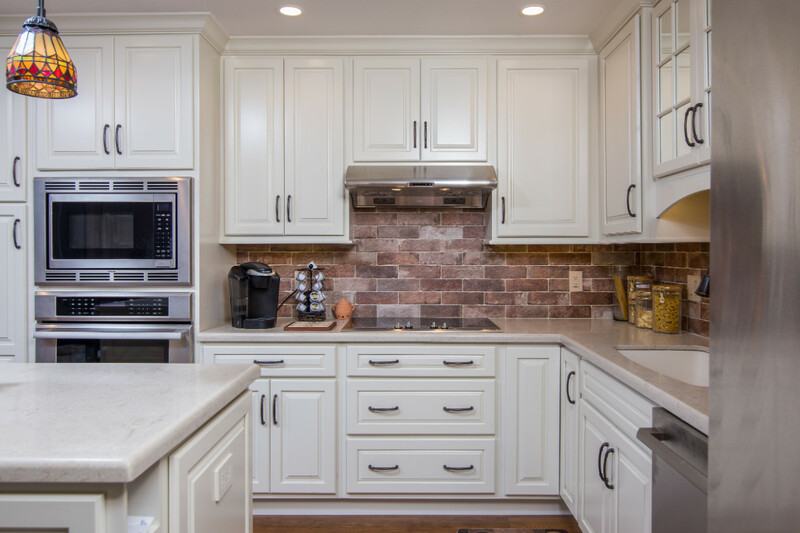 We went for a more traditional look for this kitchen remodel. 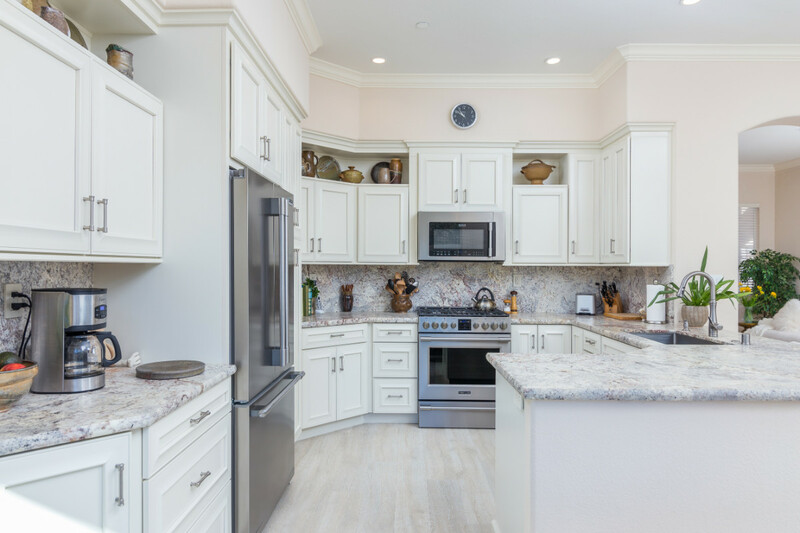 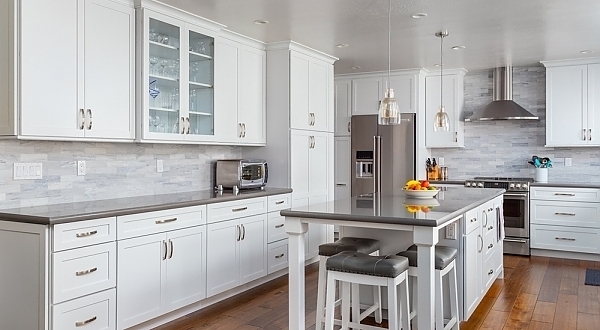 Being a downstairs unit with limited light, Light, Canvas colored cabinets help brighten the space along with a monochromatic creamy quartz countertop selection. 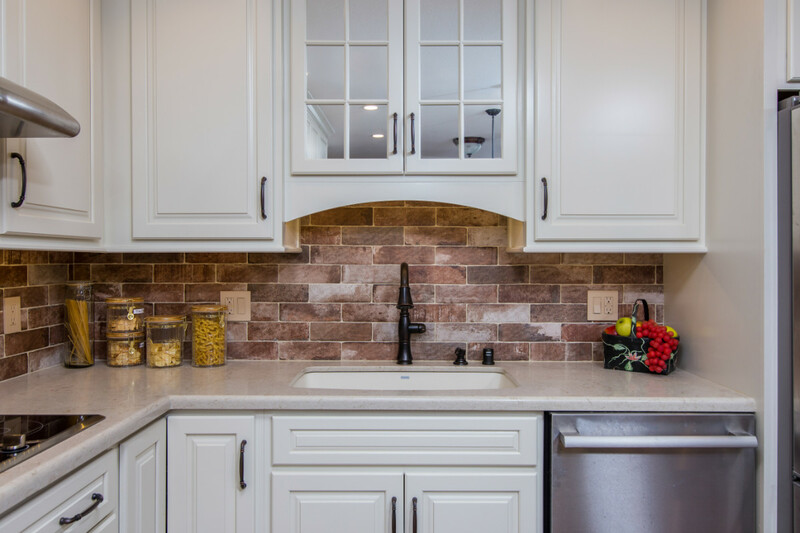 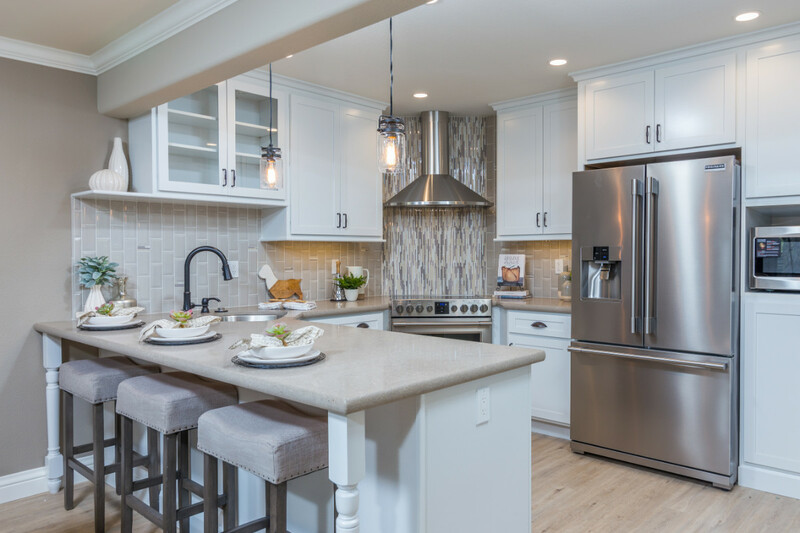 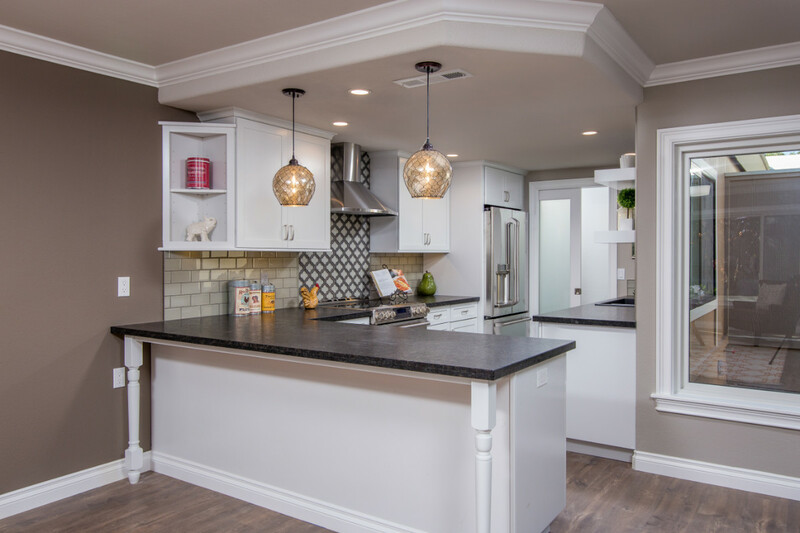 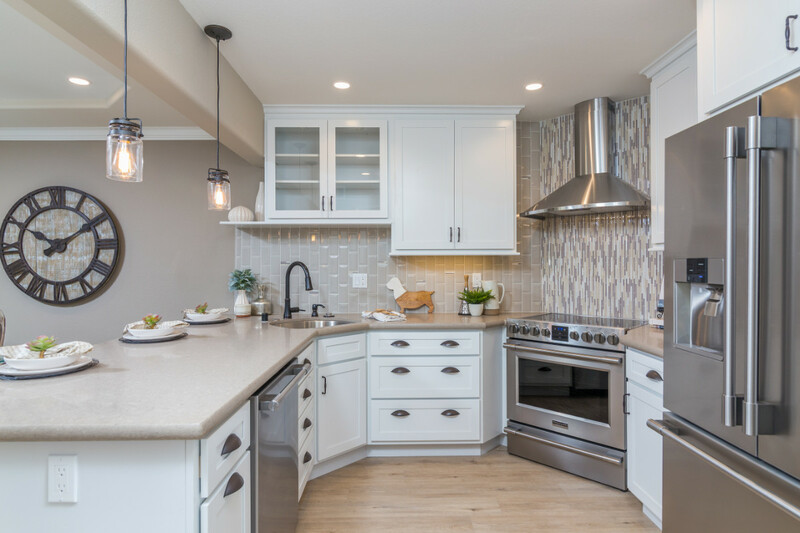 The rich wood tone laminate floors and faux brick look tiled backsplash bring some warmth and character into the space along with the mosaic pendants over the mini island which also features a slick Microwave drawer appliance. 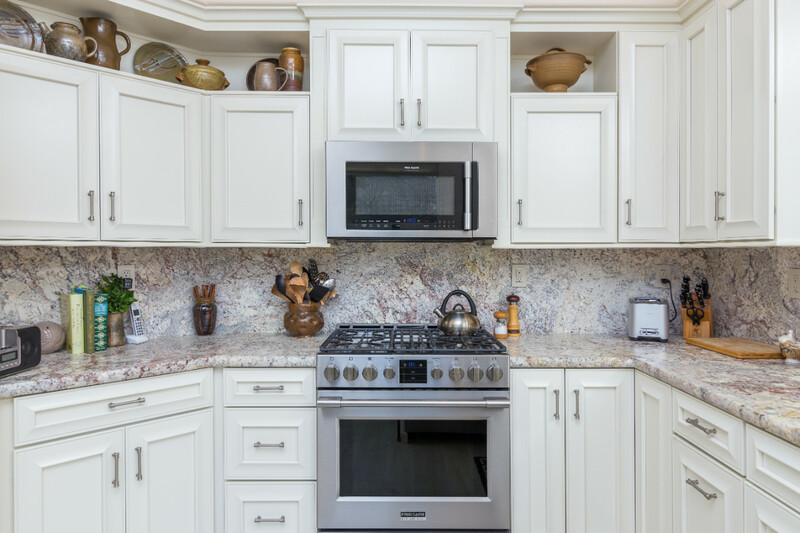 This client had a wonderful pottery collection she loved and wanted to display, so the design of the kitchen incorporated some wonderful open shelves for her to utilize for that purpose. 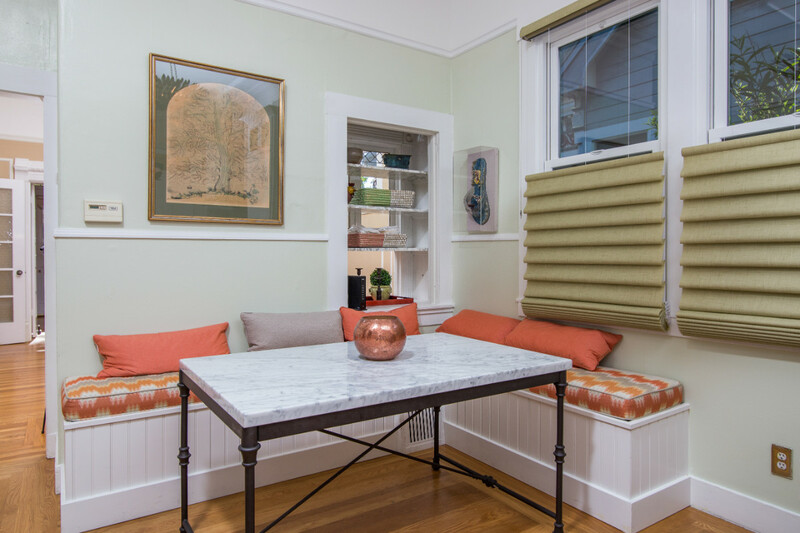 The original peninsula bar top blocked and closed off the room, lowered to all one level now it’s a much more open look. 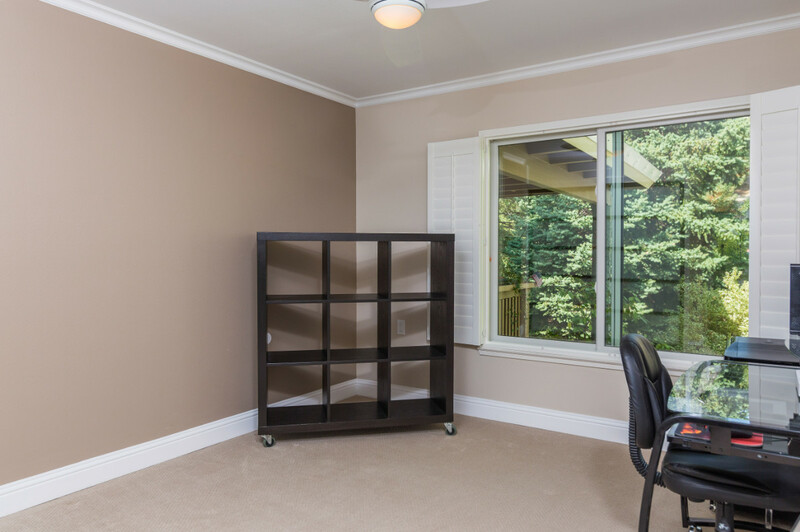 Other reorganization of the space allow for better functionality and storage options. 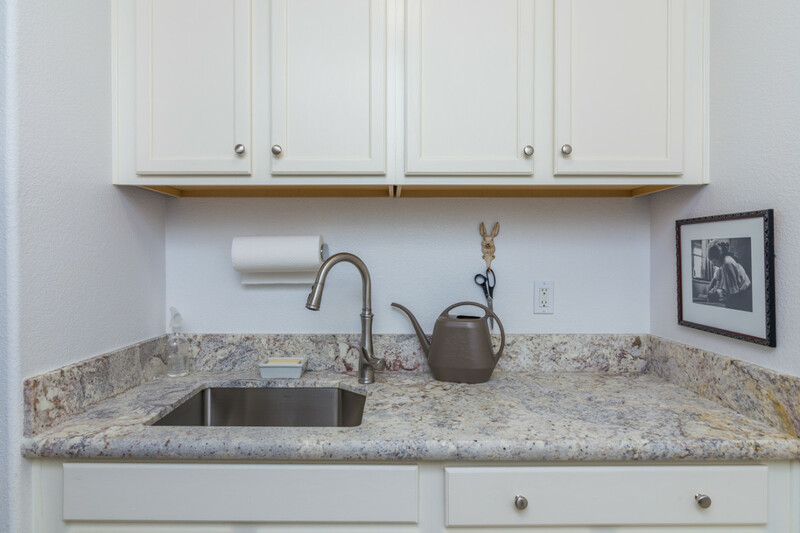 No corners are wasted. 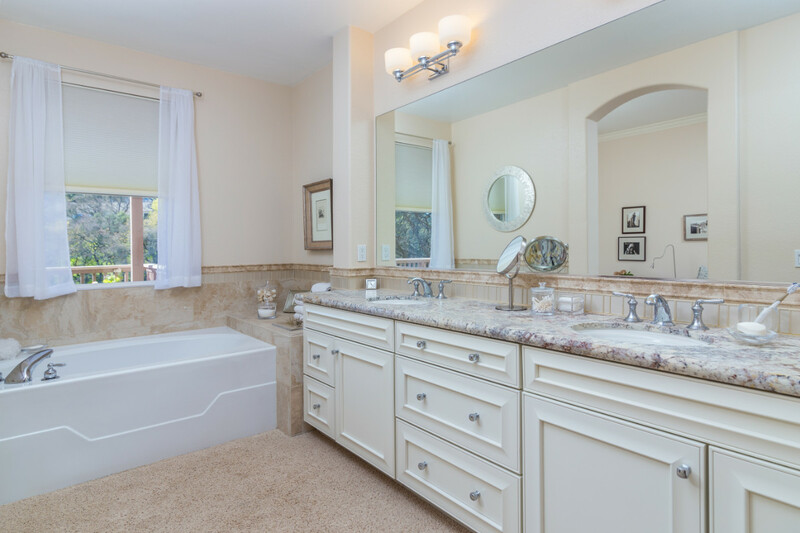 The master bathroom got a beautiful remodel to update it. 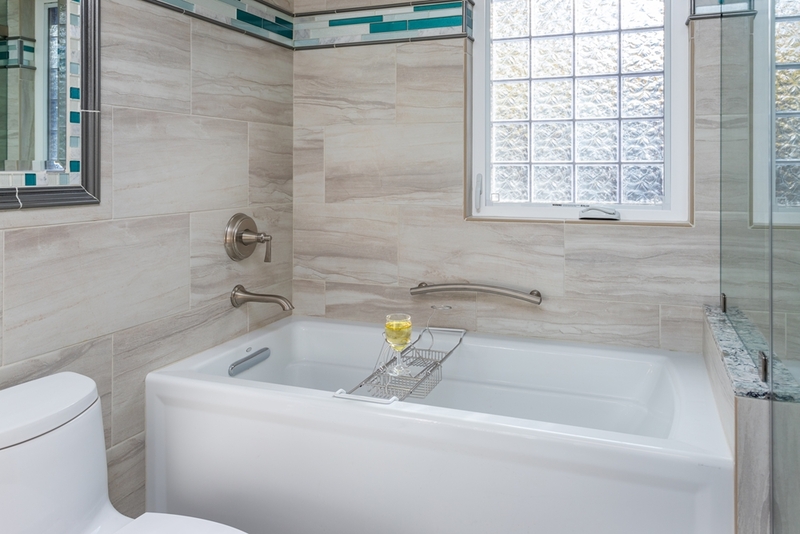 While the tub and tub filler was kept, a new elegant tile wainscoting wraps the tub area and new vanity backsplash area. 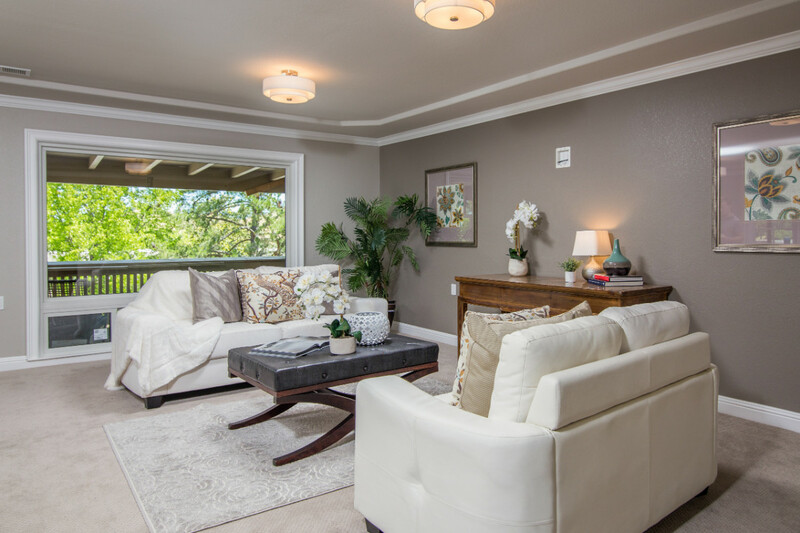 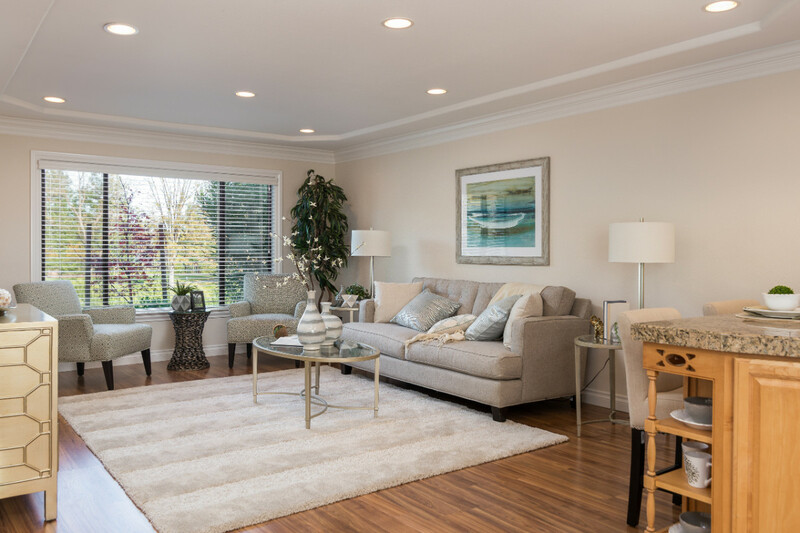 Very subtle soft creams and neutral tones give a soothing feel to the space. Making this kitchen functional for the specific needs of this client were what was most important in this project. 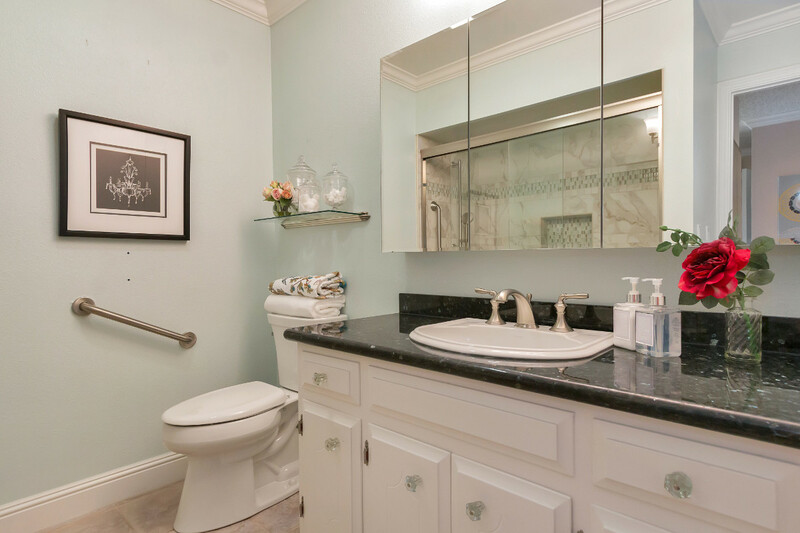 The client hated the original layout and found it a hard space to work in. 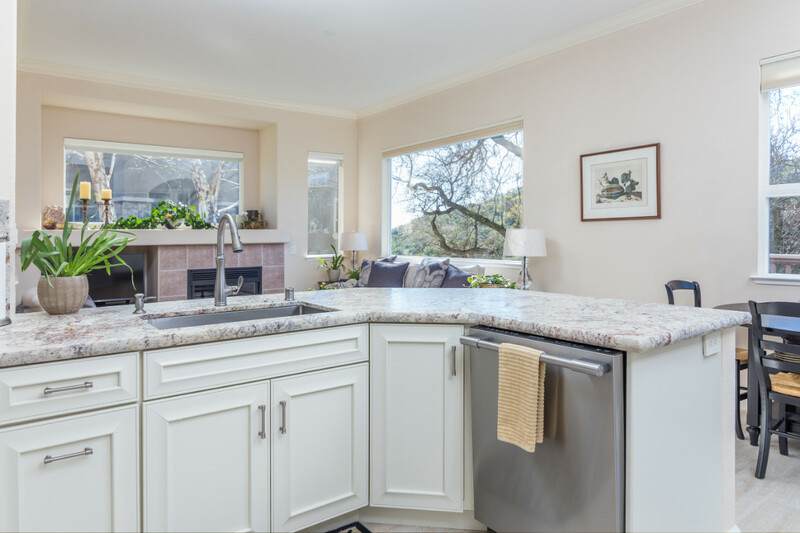 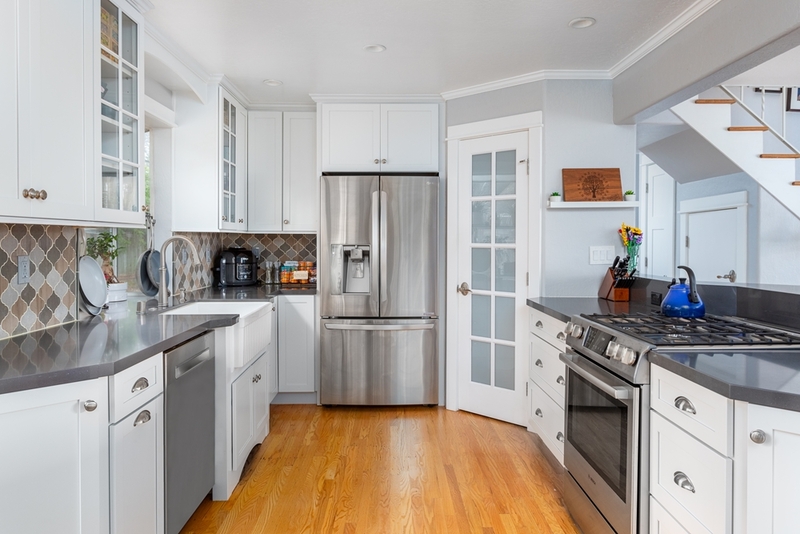 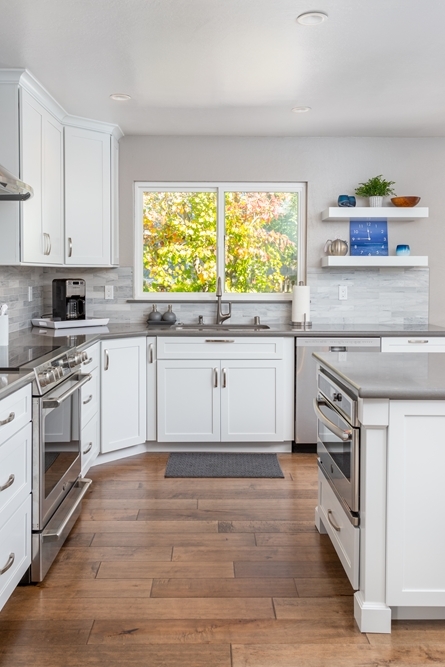 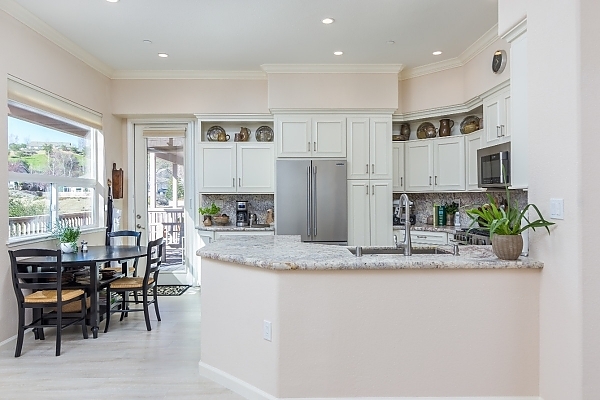 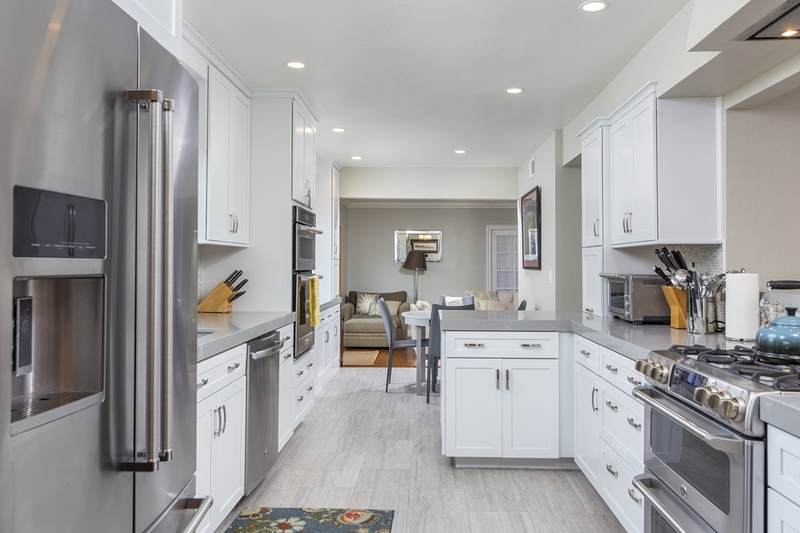 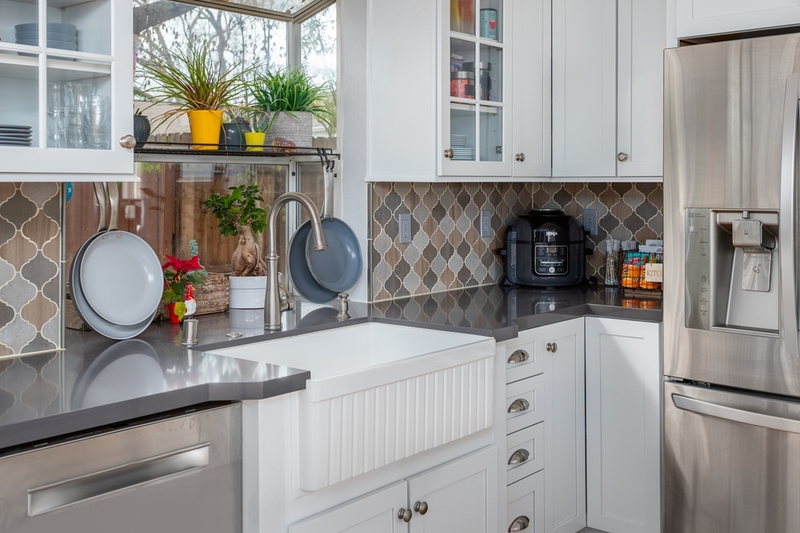 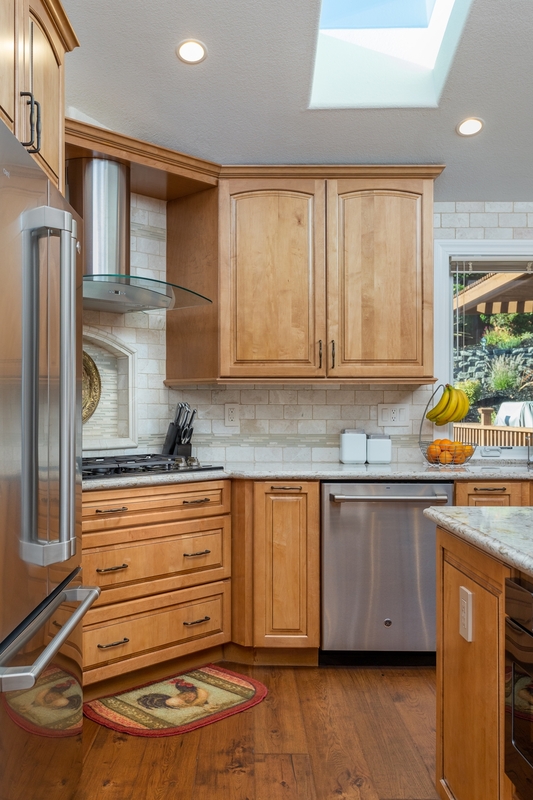 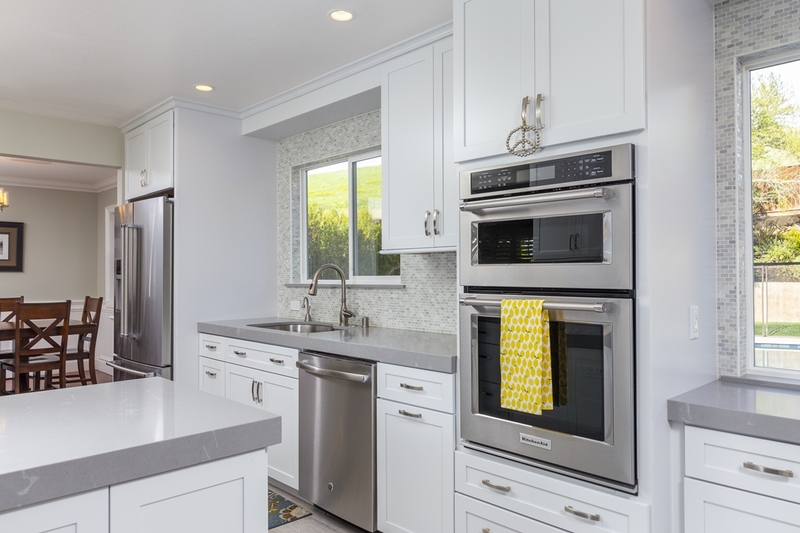 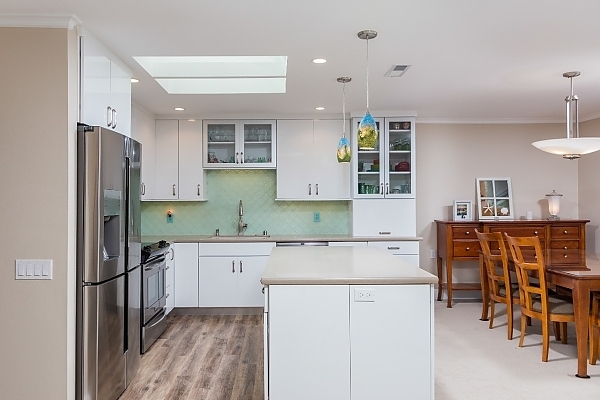 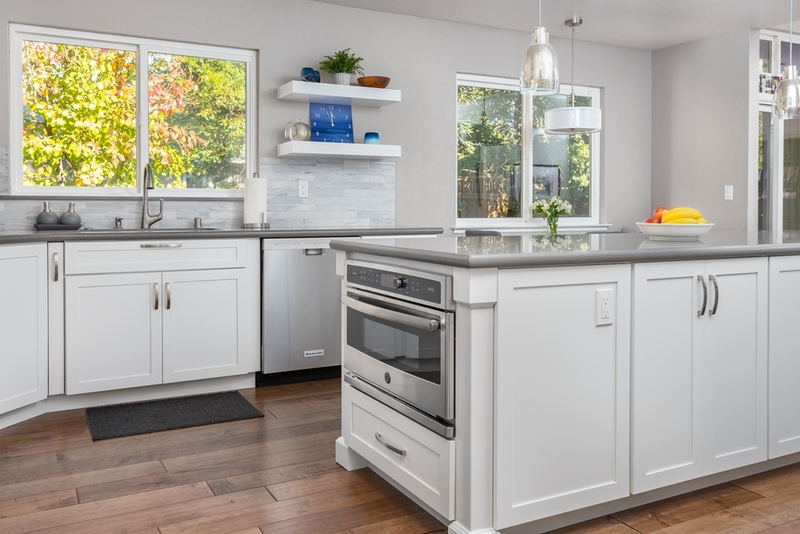 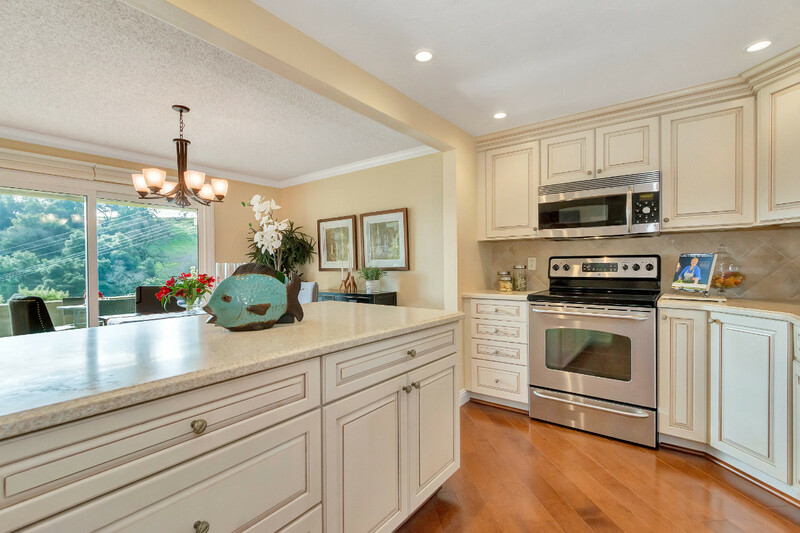 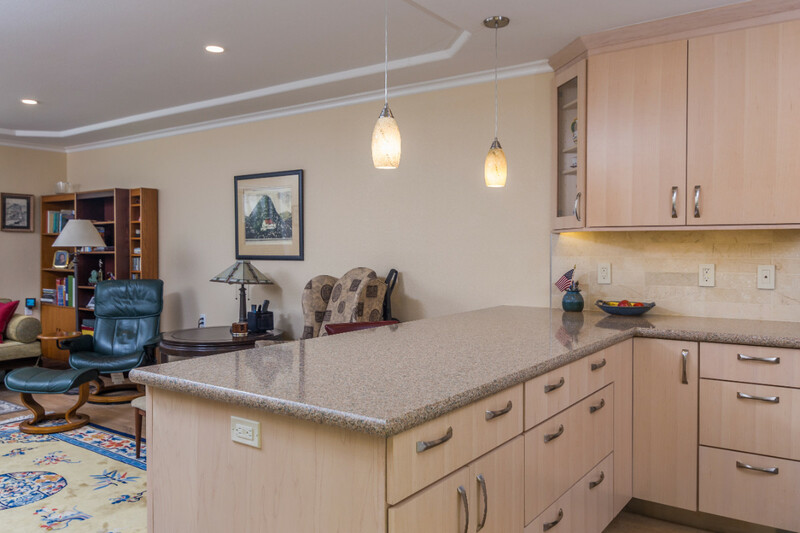 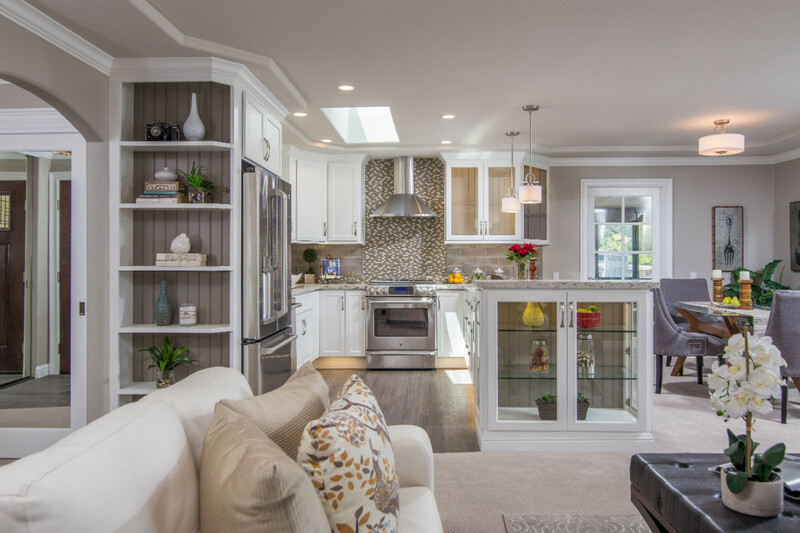 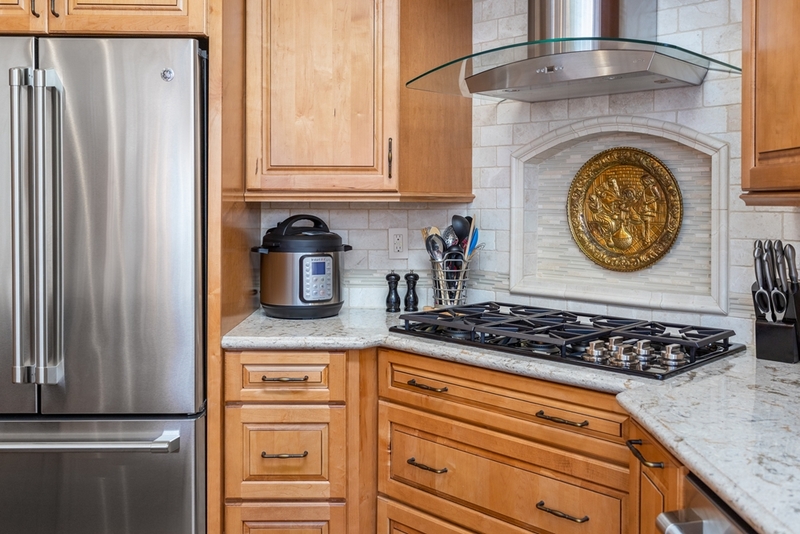 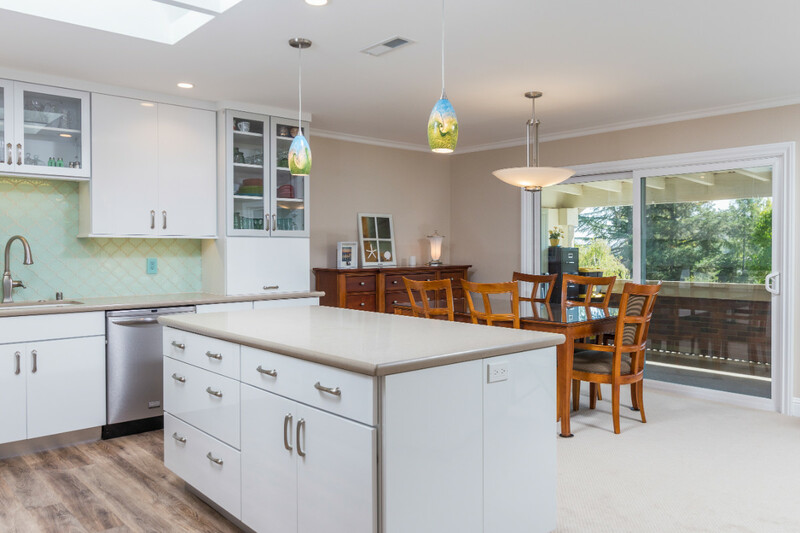 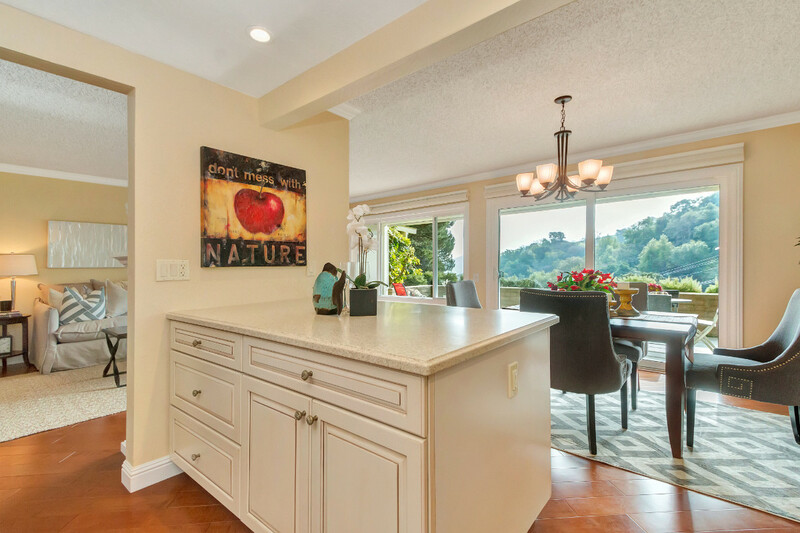 This new layout gave her the desired countertop/workspace between the sink and cooktop, with the refrigerator in a convenient location with landing space at the end of the peninsula. 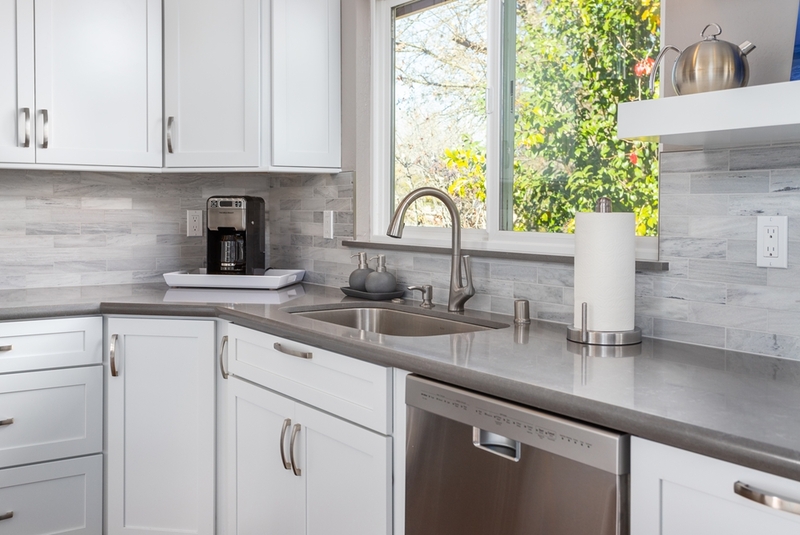 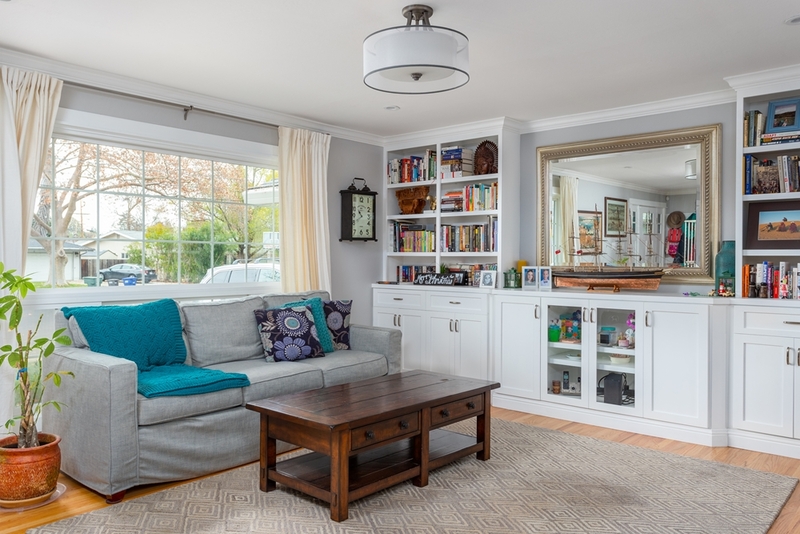 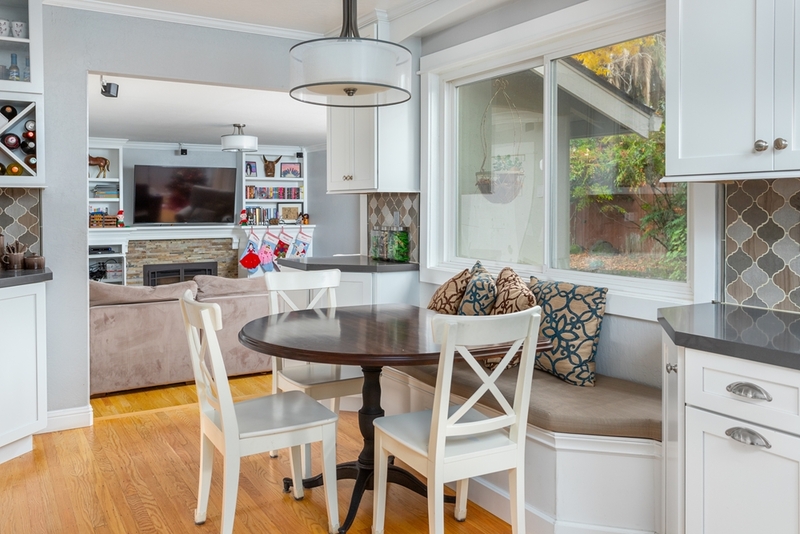 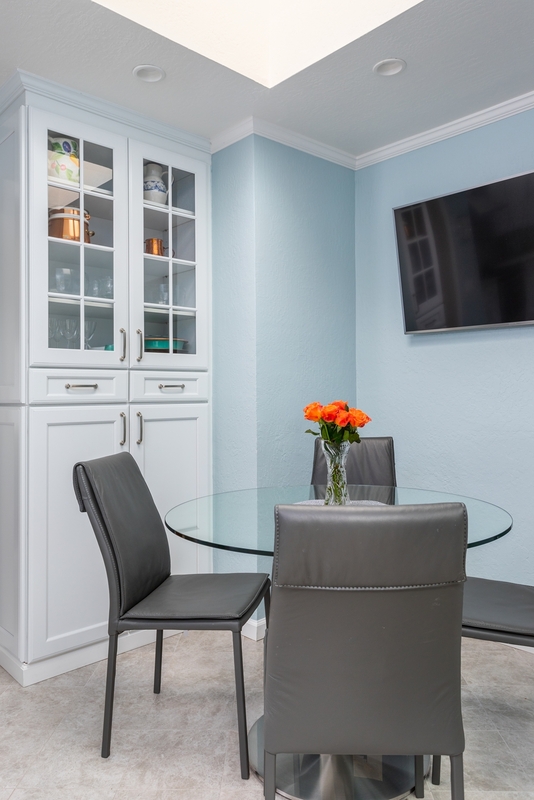 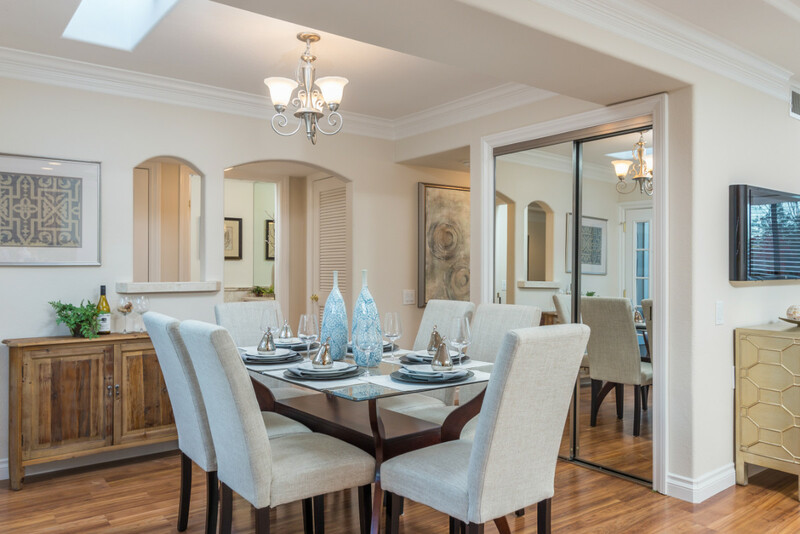 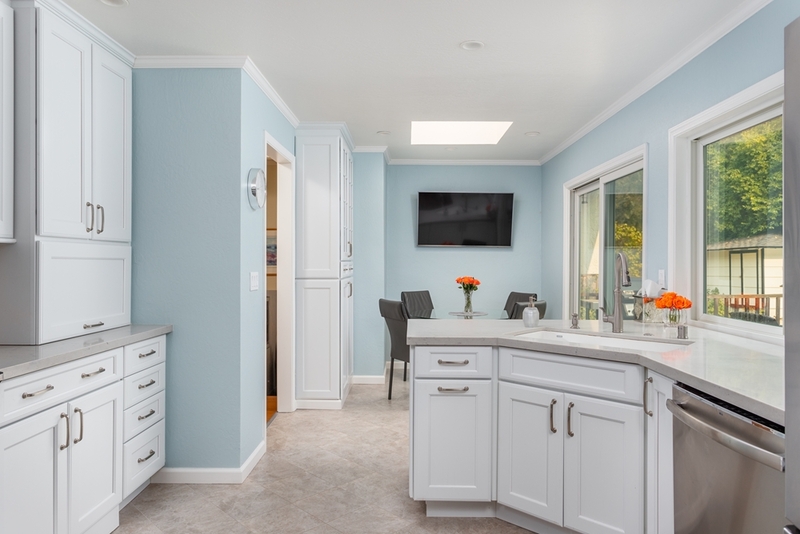 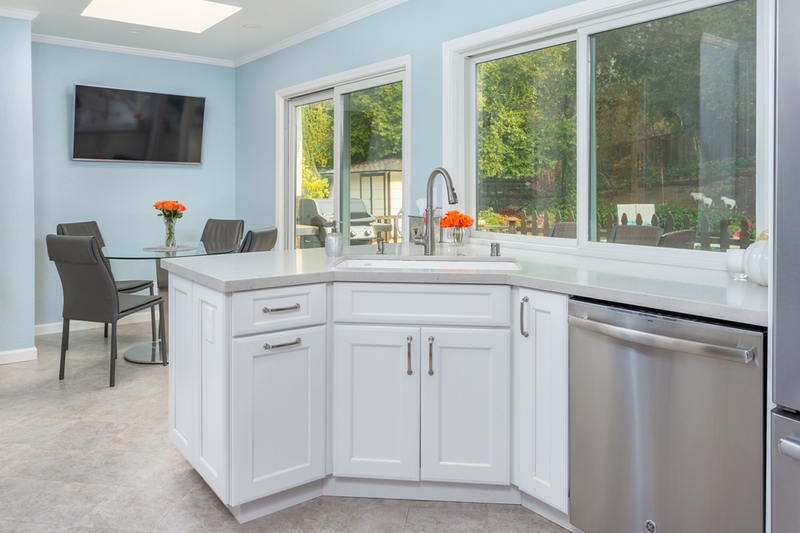 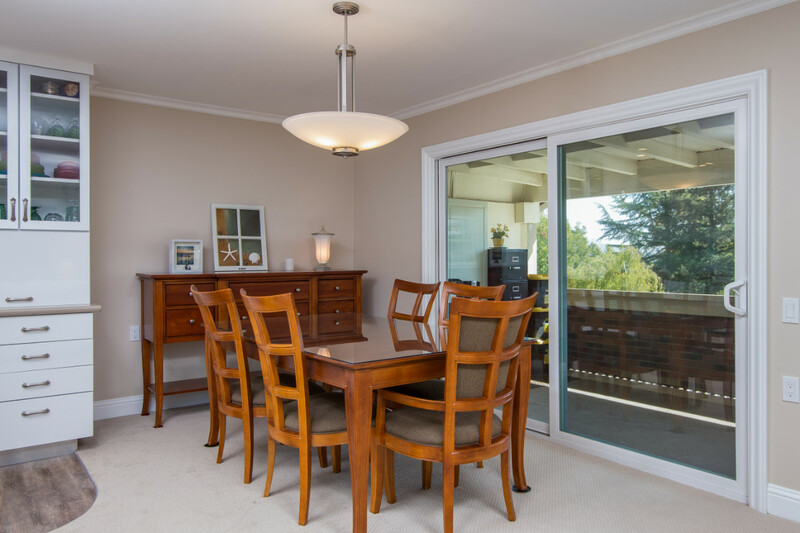 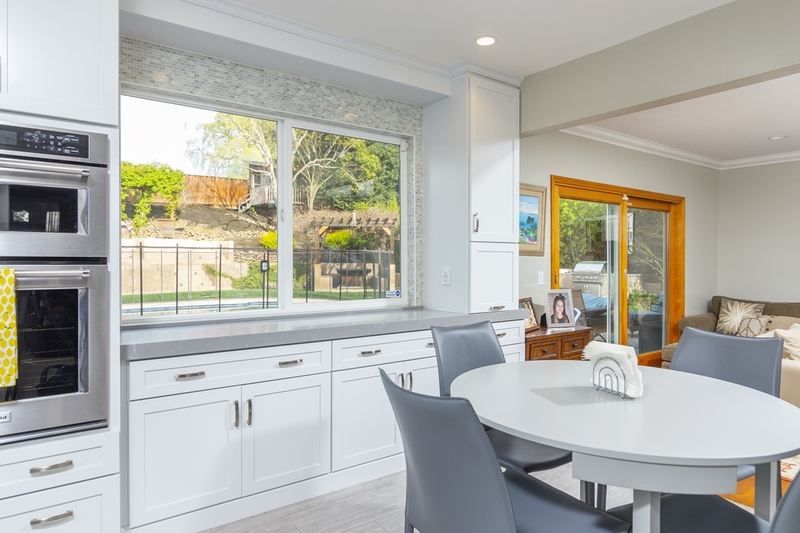 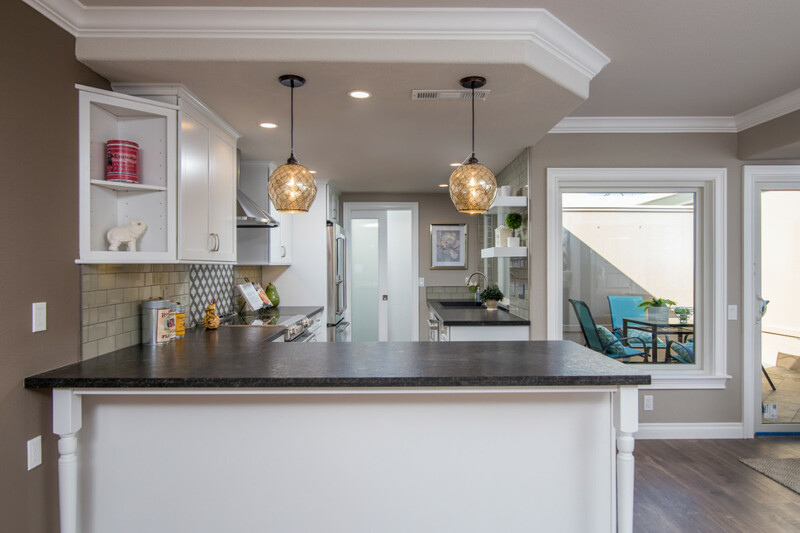 We were also able to put in a large pantry space with sliding frosted glass pocket doors and a quaint bench seat area tucked in behind the new sink peninsula. 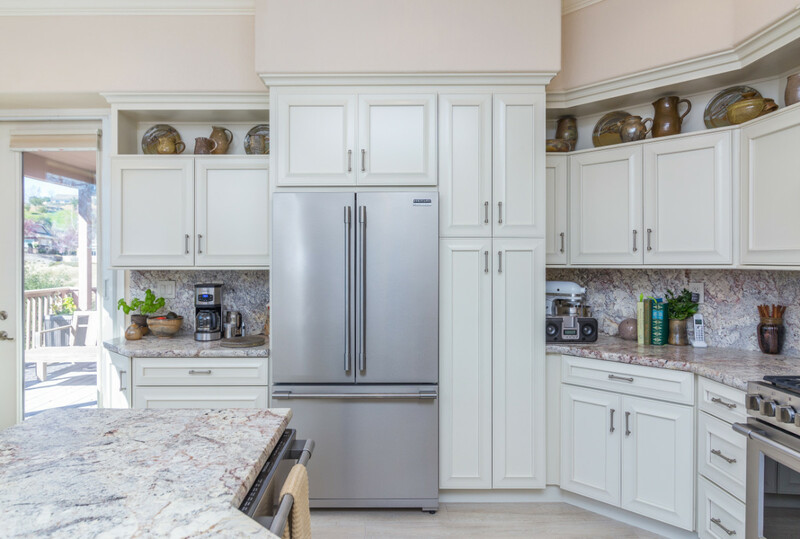 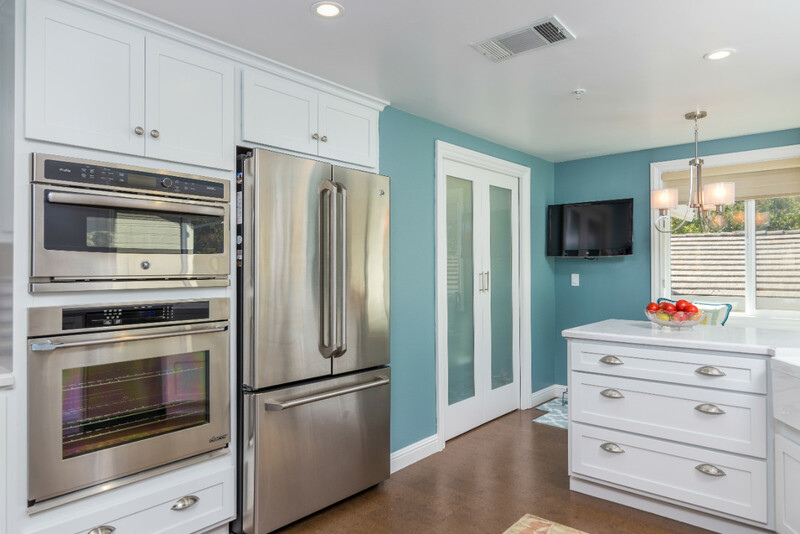 The kitchen and entry/dining room were made more open to each other and we were able to also include a bar fridge and special charging station drawer to meet other specific needs of the client. 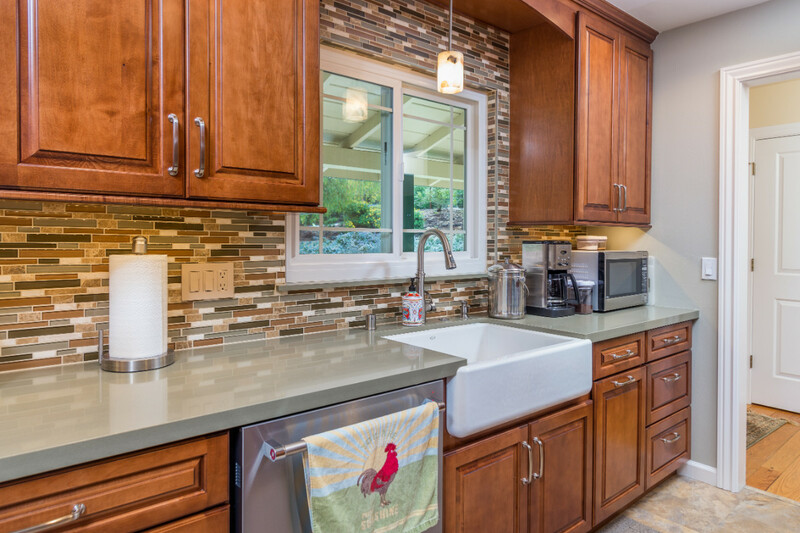 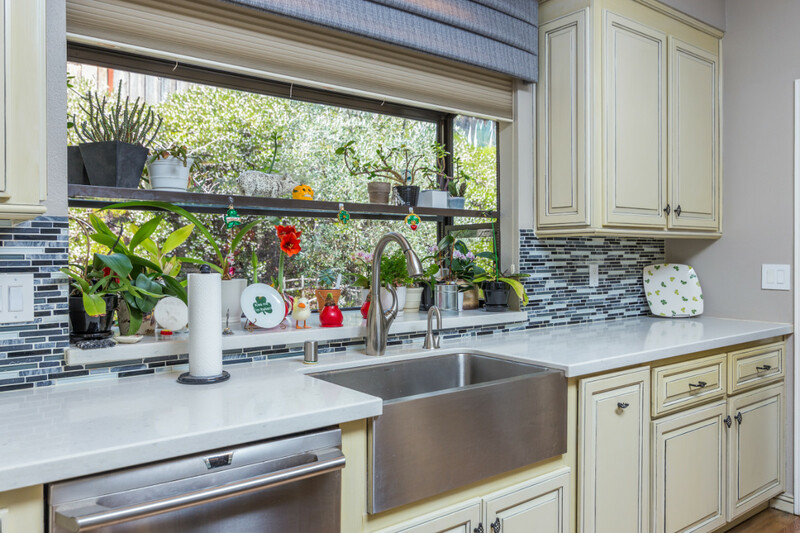 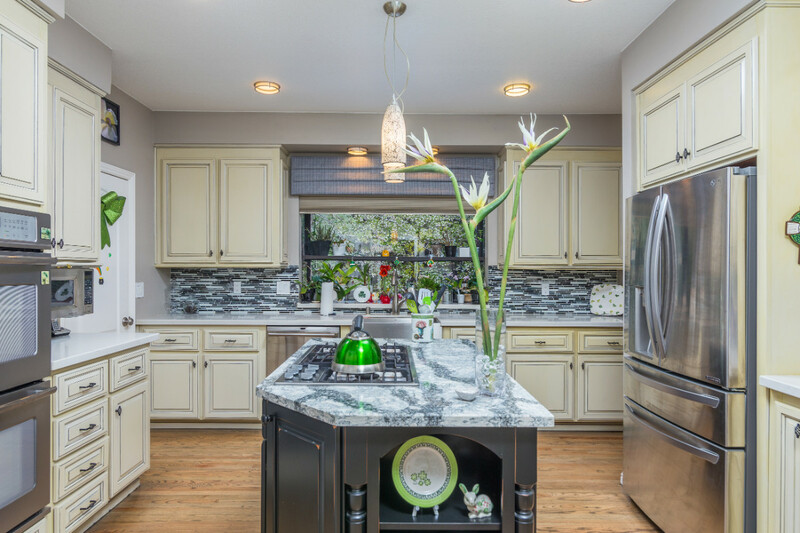 Cork flooring, Corian countertops, an apron sink, marble and glass tile backsplash are all featured in this kitchen.